Week one of the college football season is in the books, and a lot happened. It started with North Carolina heading to Williams Bryce, and ended last night with the Jameis Winston show in Pittsburgh. I spent most of my Saturday huddled around a big screen, two laptops, and an ipad, and now it’s time to recap. So without further ado, here are my five lasting impressions from week one of the 2013 college football season. 5. Alabama Is Not Unbeatable…. But they’re still probably the best team in the nation. 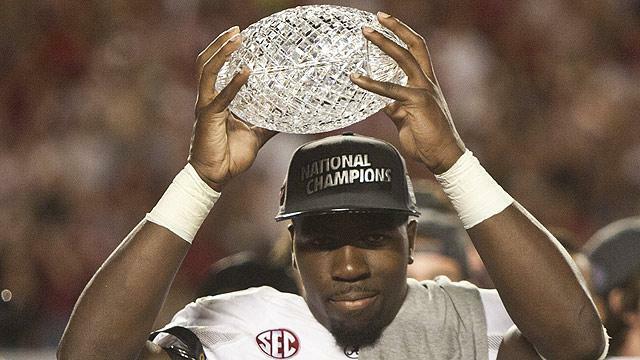 Saturday night Alabama began their title defense, and quest for a three peat in Atlanta against Virginia Tech. While Alabama won the game comfortably by a score of 35-10, anyone who watched the game would know the final score didn’t tell the whole story. The Crimson Tide had luck on their side Saturday, scoring 21 points from Defensive or Special Teams touchdowns. Even more alarming were the warts that the “unbeatable” team showed, most notably on the Offensive Line. Left Tackle Cyrus Kouandjio has been heralded as a potential top ten pick in the 2014 NFL Draft, but he looked less than comfortable on Saturday. He and is brother Left Guard Arie Kouandjio were beaten several times pretty badly, resulting in unwanted pressure for Quarterback AJ McCarron. McCarron struggled to deal with the pressure, completing under 50% of his passes. He looked less like the Quarterback who can win games, and much more like the Quarterback who started his career at Alabama being asked to not lose them. Still, this team is too talented, and their coach is too good to spend much time worrying. I fully expect them to correct the issues, but the giant that everyone thought Alabama was may be more of a taller than average man when compared to the likes of LSU, Florida State, Texas A&M and others. 4. Johnny Football Just Doesn’t Get It…. And maybe never will. After a Summer that saw Texas A&M’s Johnny Manziel constantly in the news, you would think he would want to tone things down a bit now that he’s back to football. You would be wrong. After a summer of eyes on him for the wrong reason Manziel found himself in an unusual position to start Saturday, on the bench. Manziel was suspended for the first half of the Aggies game vs Rice after he was found to have signed thousands of autographs for brokers. Again, you would think he would want to stay out of the limelight now. Again, you would be wrong. It didn’t take long for Manziel to make an impact both on the scoreboard, and in the headlines. Manziel played well helping his team pull away, but it was his actions after the play that will be remembered. Johnny Football used some questionable celebrations, including making the gesture of signing an autograph, and a hand motion to suggest he needs more money. He was also penalized for taunting the opposition after he got into it with a Rice player following a touchdown. His actions were so disruptive that his coach pulled him out of the game after the penalty. Manziel is quick to remind everyone he’s still a kid whenever criticism comes, but he’s acting like a spoiled brat on the field. The pressure and spotlight will only increase from week one, so it will be interesting to see how he handles it. 3. The Spread & High Tempo Offenses Will Ruin Games…. But not for the reason you think. Two things really frustrated me from the first week of college football. I’ll cover the second in a moment, but the first was the defensive “strategy” to tempo offenses. I’m referring to defensive players doing their best soccer dives on the field, faking injuries in order to buy their teammates time. It’s disgusting, despicable and unfortunately unavoidable. That is unless the officials take control. I watched the majority of the games on Saturday, and on numerous occasions it appeared as though defenders were faking injuries to slow down the offense. This was most notable in the late night California versus Northwestern clash, where I saw almost ten “injuries” that I thought were pretty questionable by Northwestern players. The problem is, it worked like a charm, disrupting the flow of the offense and taking Cal Freshman QB Jared Goff out of his rhythm. Honestly, I don’t blame coaches for using this tactic, it works. But that’s where the official comes in. It’s their job to question the coaches and the validity of the high number of minor injuries. They have to take control, and make a coach feel like this is no longer an option to disrupt the offense. Not only do they need to question coaches, but in some cases they need to penalize. Will it happen? Hopefully. If not, watching teams like Cal, Oregon, North Carolina and any other spread or tempo based team will become a lot less enjoyable. Because it’s a joke of a rule and won’t be consistently enforced. If you’ve been living under a rock, or don’t live football 24/7 365 like I do, you may have missed a major rule change. Beginning this year, players will risk ejection for “targeting” a defenseless player. This has already been applied several times this season. In one instance they got it right. 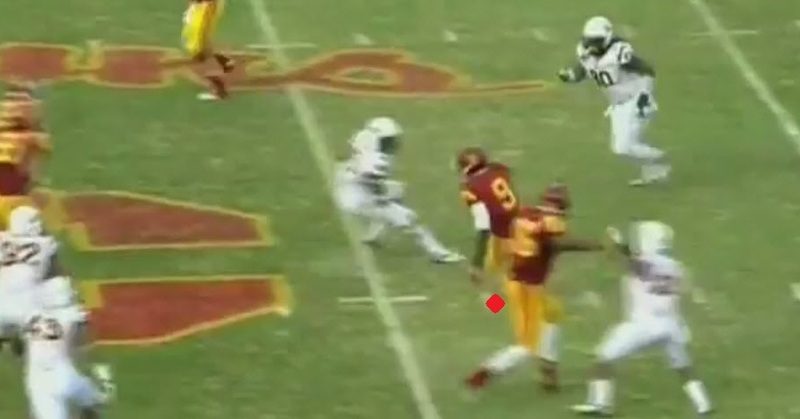 A Defensive Back for Oregon launched himself into the Nicholls State Quarterback as he was sliding. 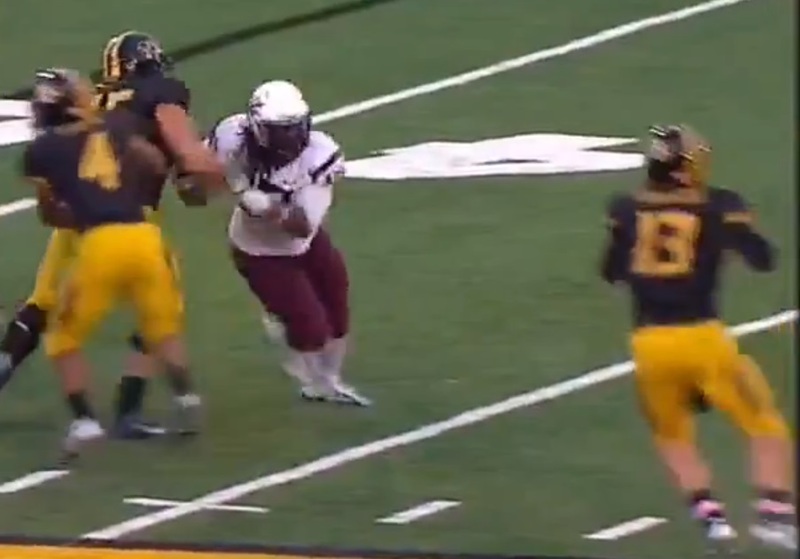 He hit the QB in the helmet, knocking him out of the game. He was rightfully flagged, and ejected from the game. However just several hours later they got it incredibly wrong in the already mentioned California and Northwestern game. Early in the fourth quarter of the home game against Northwestern, Defensive End Chris McCain was penalized for a hit on the Quarterback. Not only was the call a roughing the passer 15 yard penalty, but McCain was promptly ejected from the game. 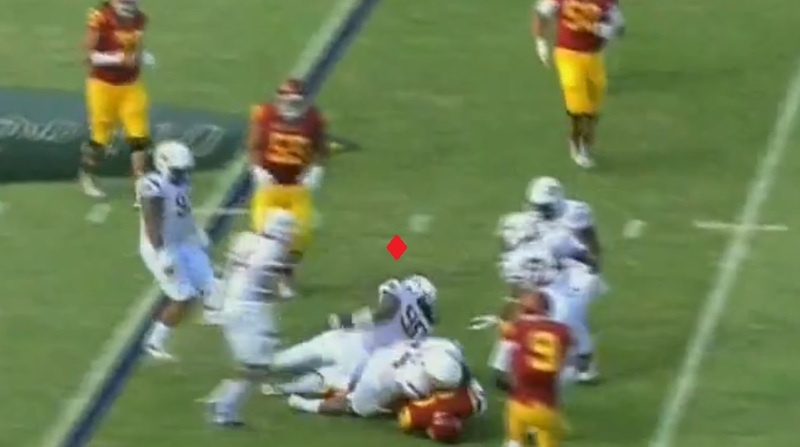 McCain’s hit was far from an ejection worthy penalty though. In fact, it was probably closer to a legal clean hit, then it was worthy of being sent to the locker room early. The play should have been reviewed, but it wasn’t due to a failure in the system. Due to this McCain won’t be suspended for the first half of this weeks game, but it doesn’t make the issue go away. Giving officials the power to eject a player for what they believe is targeting is a risky business. Not only that, but what happens when a targeting situation occurs in a big game? Let’s say Alabama versus Texas A&M in week three for instance. Does anyone actually believe a player is getting kicked out of that game? 1. Jameis Winston’s First Start Was Good…. Really, really good. I’m not one to jump to conclusions based on a first impression, but it’s hard not to be impressed with what Redshirt Freshman Quarterback Jameis Winston did for the Seminoles last night. Winston was electric last night, completing 25 of 27 passes for 356 yards and four touchdowns. He also added 25 yards and another touchdown on the ground. 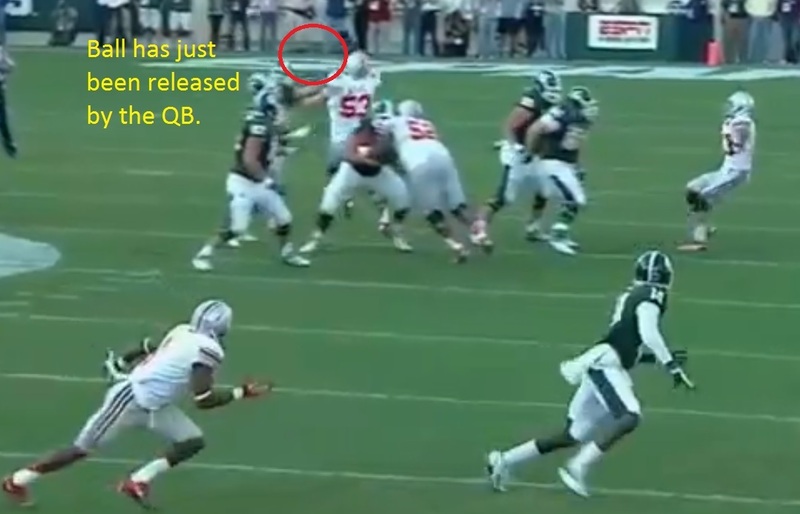 It wasn’t just the numbers though, it was all the things that don’t show up in the box score for the young QB too. His pocket awareness, his decision making, his command on the field, he just looked like a much more seasoned Quarterback then he is. 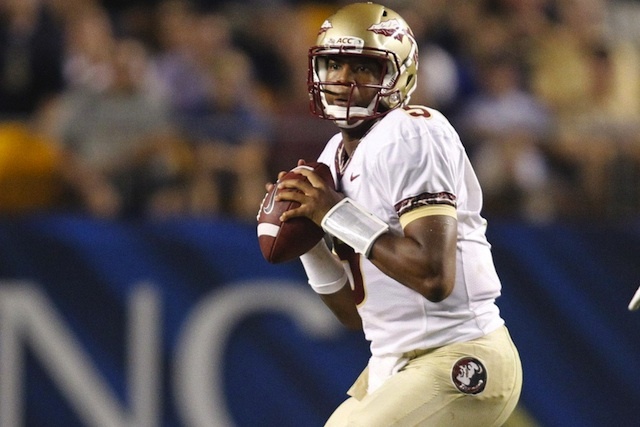 We may not see just how legit Winston is until mid October when the Seminoles face Clemson. That will be the first time Winston plays a quality opponent in the unfriendly confines of Death Valley (just ask Aaron Murray how welcome Clemson made him feel). Still, his performance last night was incredible, amazing, insane, unreal, otherworldly, and any other ridiculous adjective you can come up with to describe it. With a schedule loaded with inferior opposition to pile stats against, a Heisman trophy for Winston may not be out of the question. Still he’s a Redshirt Freshman making his first career start, so I’ll be gentle on the gas of the Jameis Winston bandwagon for a few more weeks. We’ve finally made it. College football is just one day away, which means it’s time for the top player in my Best of the Best. It should come as no surprise to anyone that the player is South Carolina Defensive End Jadeveon Clowney. He’s without a doubt the best player in college football, and he may be the best defensive prospect from an NFL standpoint in the last decade. He’s the closest thing you can get to a “perfect prospect”, being complete in every area of the game. Even as a 17-year-old Senior in High School Clowney was so good that you could see top pick potential in him. Now four years later he’s only gotten better, and barring a team needing a Quarterback that bad will almost certainly be the number one overall pick in the 2014 NFL Draft. So now it’s time to take a look at what makes Clowney THE Best of the Best. 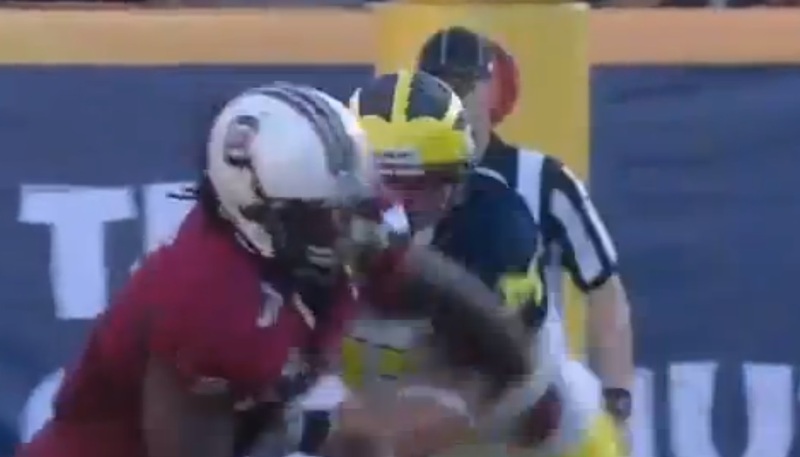 Clowney is an incredible athlete, and this shows up in a lot of ways on the field. He’s a great speed rusher, getting around the edge with ease. He’s shows good ability to pursue not only sideline to sideline, but also down field. 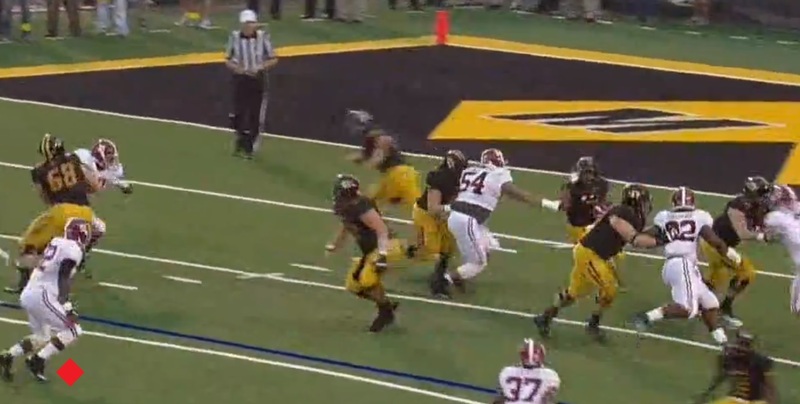 He even shows the ability to completely embarrass blockers by leaping over them. On this play we’ll see Clowney force the Quarterback to evacuate the pocket. 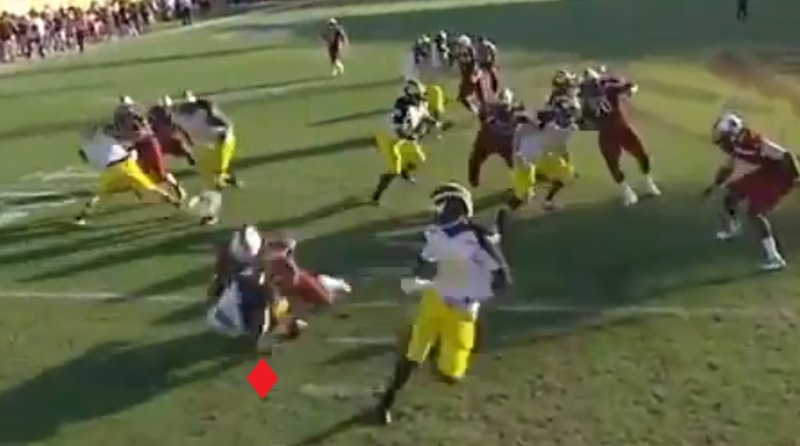 Clowney does a good job getting to the Quarterback in the backfield, but Michigan’s Devin Gardner is athletic enough in his own right to escape Clowney initially and scramble down field. 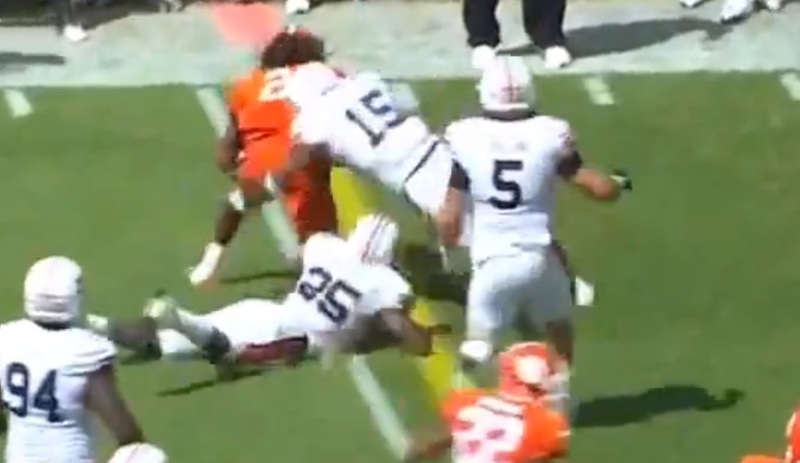 Here we’ll see Gardner is in space, and Clowney looks to be having trouble maintaining his balance. 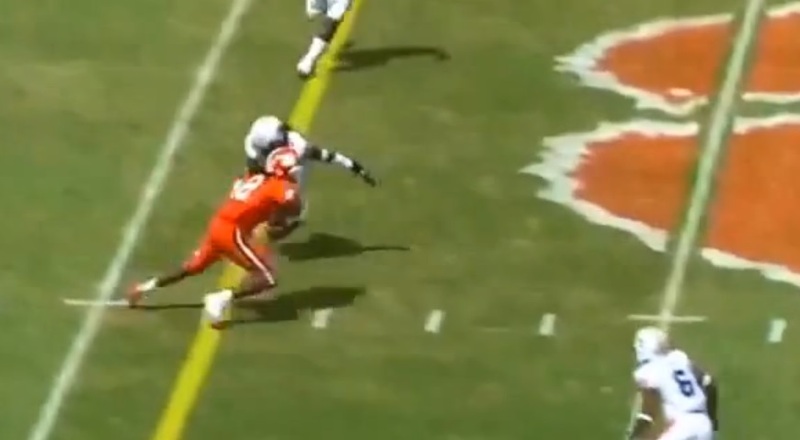 It doesn’t look like Clowney is going to be able to make a play. But as the play ends, it’s Clowney that gets down field and is able to bring down Gardner before the damage is even worse. Gardner was slowed slightly by a couple of Gamecock’s players before Clowney made contact, but it’s still a tremendous individual effort. 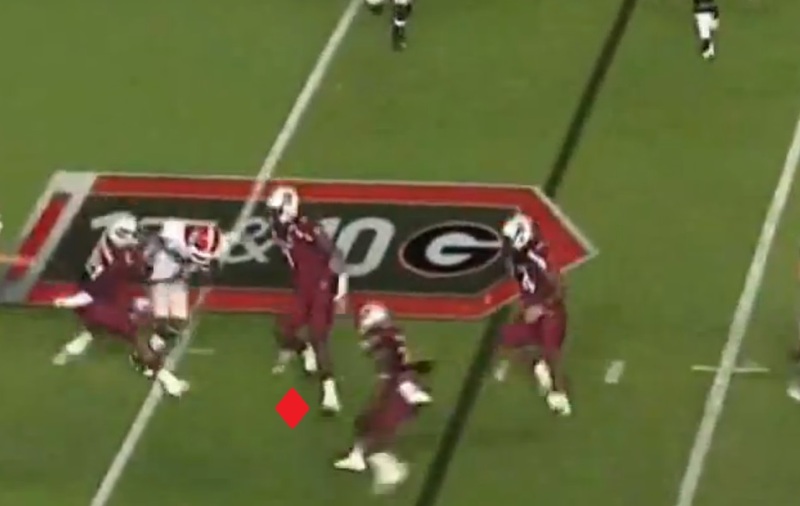 On this play we’ll again see good down field pursuit from Clowney as he chases down the ball carrier. 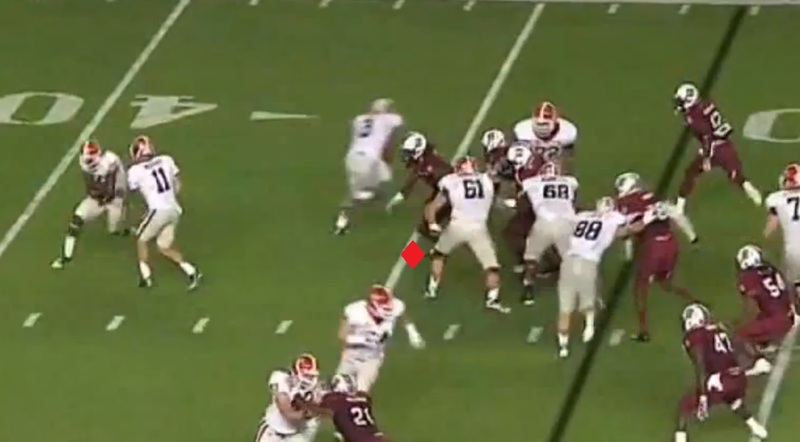 Clowney does a good job reading the direction of the play, and disengages quickly in order to pursue the ball carrier. Clowney shows great athleticism being able to launch himself in a diving tackle attempt, and pull the Running Back down for a moderate gain. 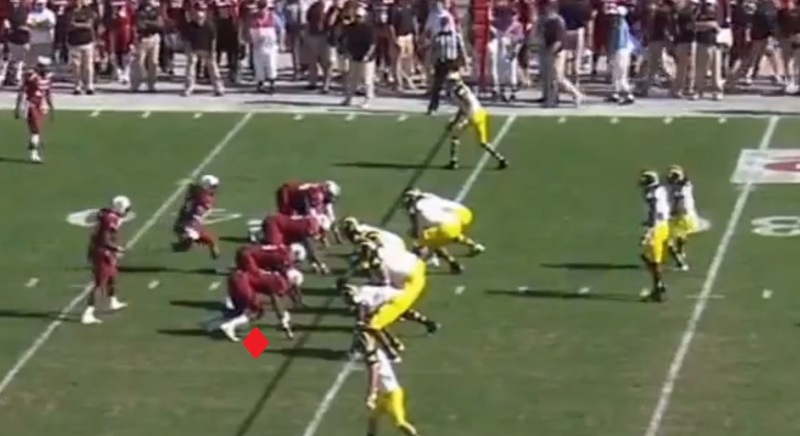 Without Clowney’s play this may have been a significant yardage play. On this play, Clowney shows excellent sideline to sideline ability in pursuit of the highlighted Wide Receiver’s end around. Clowney does an excellent job not biting on the Running Back’s fake, reading the play as an end around from the start. 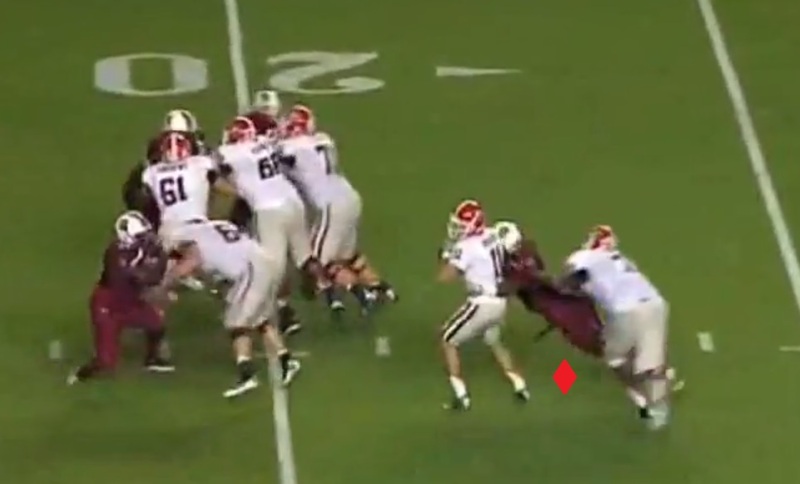 Clowney shows great acceleration closing on the ball carrier, and taking away his angle to the second level. Even though Clowney doesn’t make the initial stop, he’s right there showing just how fast he can get from one side of the field to the other. 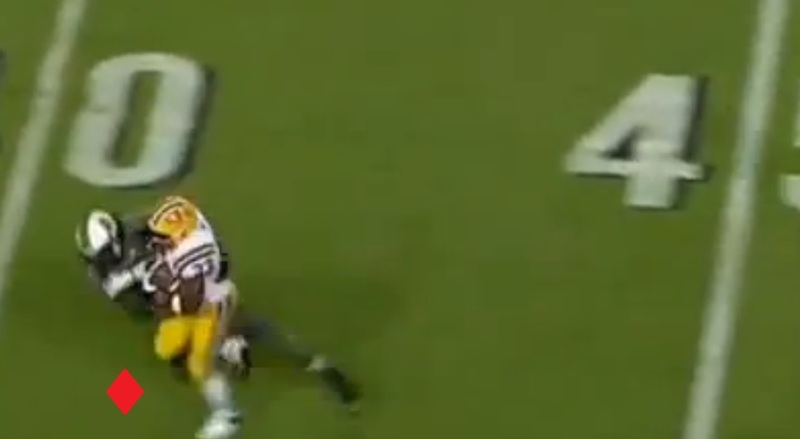 Here we’ll see an even better example of Clowney’s down field pursuit against LSU. 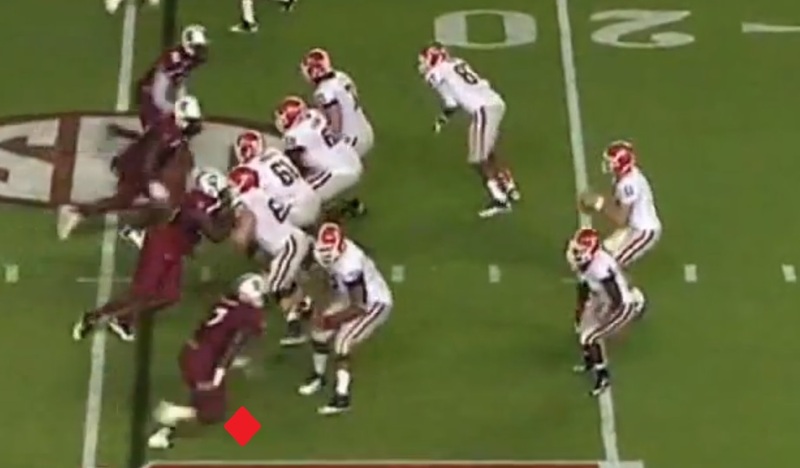 As the play begins Clowney runs a stunt, and will pressure the Quarterback. 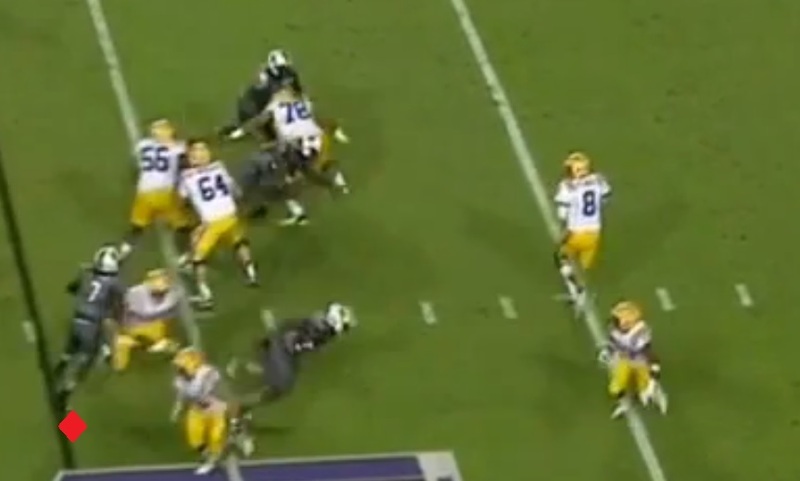 However LSU has the screen called, and the QB gets the pass to the Running Back who has blockers in front of him. The back is able to miss a couple of Gamecock defenders miss, but Clowney still hasn’t given up on the play. The result of the play is a first down, but it would have been an even bigger gain without Clowney’s incredible effort pursuing the screen. Against Georgia Clowney’s athleticism was on complete display as he leaped over the blockers several time in order to get into the backfield. Along with athleticism, Clowney is an incredible pass rusher. He’s got a great stable of pass rushing moves, from a simple speed rush to a devastating bull rush. He uses these moves along with great leverage to regularly get into the backfield and frustrate Quarterbacks. Not only does he have a good arsenal of moves, his burst off the line is so good that at times he doesn’t even need them. On this first play, we’ll look at a rush where Clowney is so quick out of his stance that he’s able to slip by practically untouched. He’s going to rush between the Left Tackle and projected top 15 pick in 2014 Taylor Lewan, and the Left Guard. 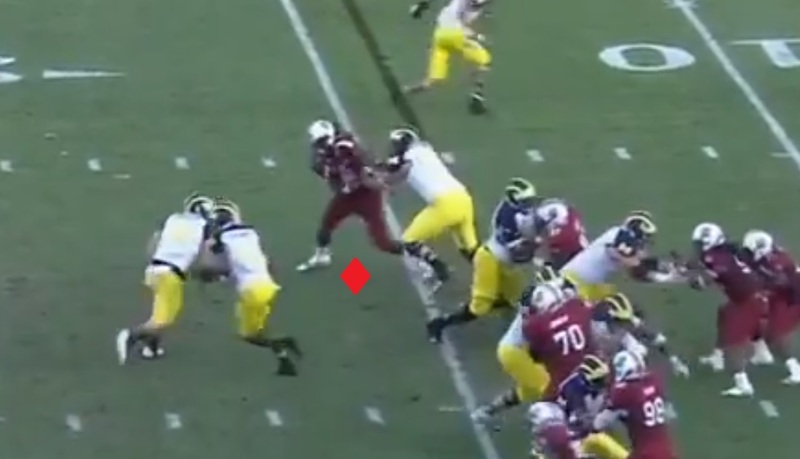 Clowney gets a great initial burst off the ball, and is easily able to get between the Tackle and the Guard. He’s going to use a subtle swim move, but it’s really not necessary with how fast he is. The Offensive Lineman do eventually get their hands on Clowney, but it’s not before he’s in the Quarterback’s face and causing him to throw ball that a defender is in position to deflect. 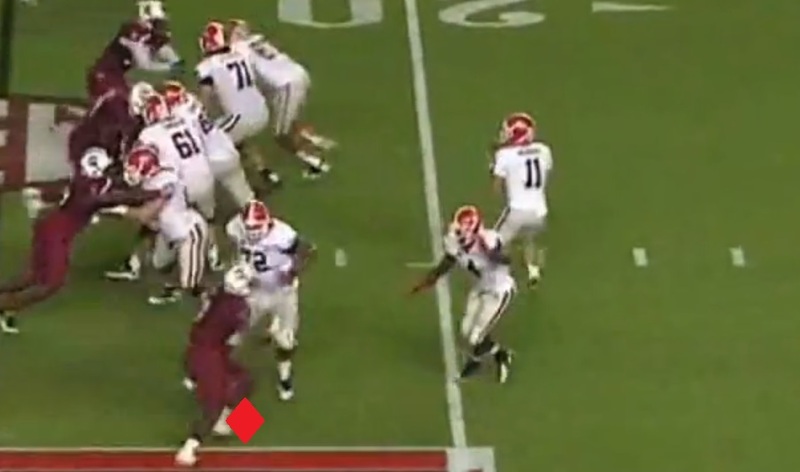 This play is actually a designed run, but it shows Clowney’s excellent swim move. Once again he’s going to get a great burst off the line. 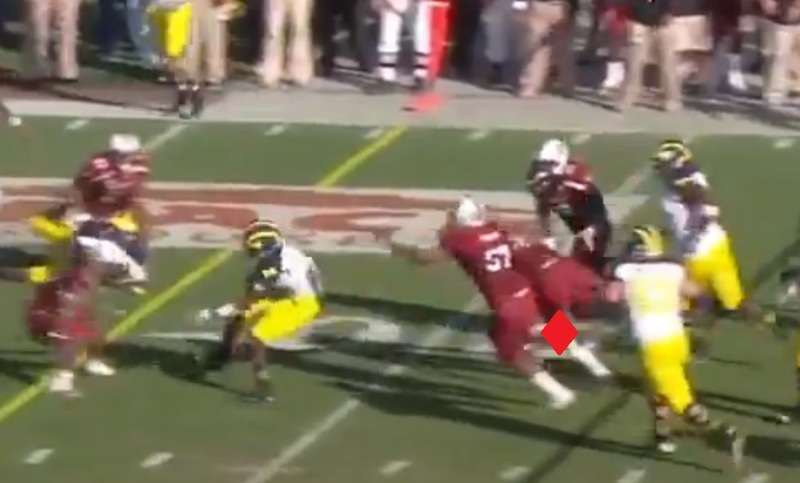 He not only beats Taylor Lewan off the snap, but makes things worse by using a great swim move to get around the outside of Lewan. 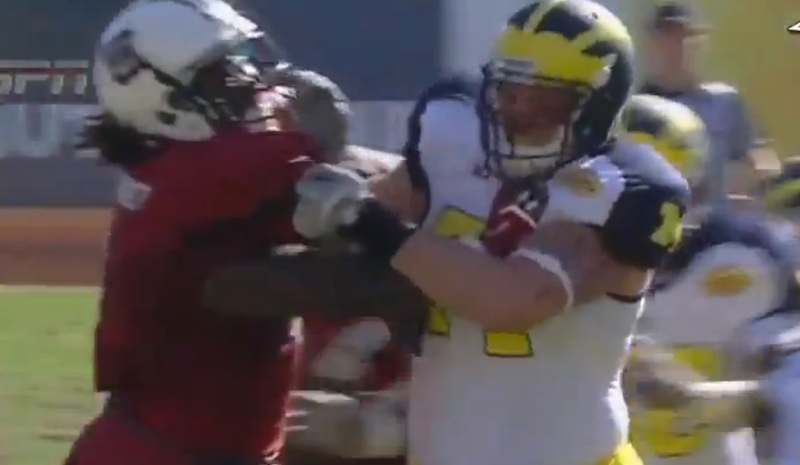 This makes it impossible for Lewan to block him without grabbing the jersey and being called for a foul. Here’s a better look at the swim. 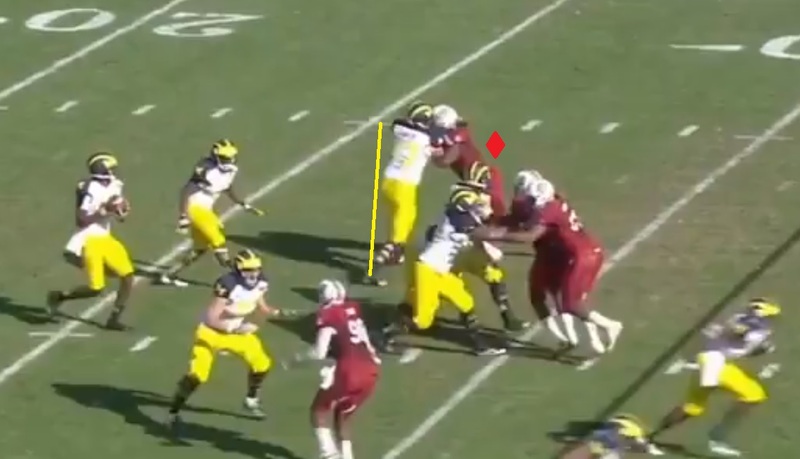 Clowney is able to bring his arm up and over Lewan’s inside shoulder. 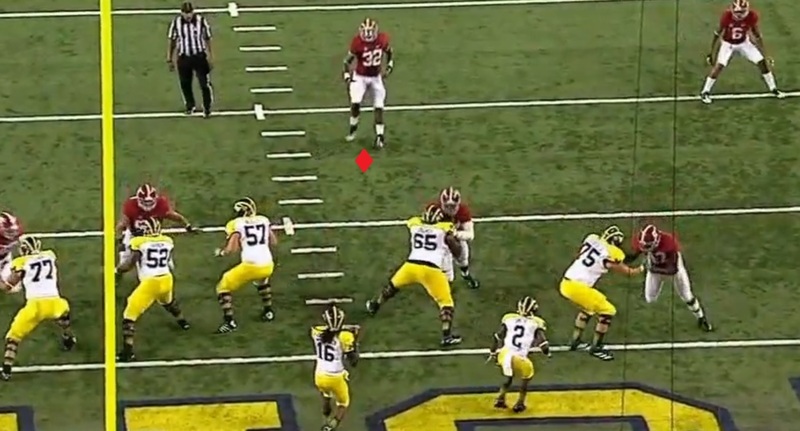 With the leverage he can turn Lewan, and slide by the outside putting Lewan completely behind him. 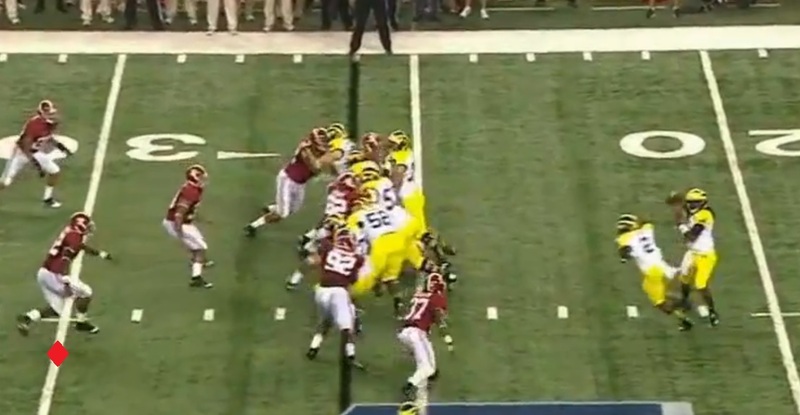 Clowney now has a free lane to the ball carrier Denard Robinson and he’s easily able to finish the play off in the backfield with a big hit. Clowney doesn’t just use the swim to beat a man to the outside though. He’s got a devastating inside swim move. 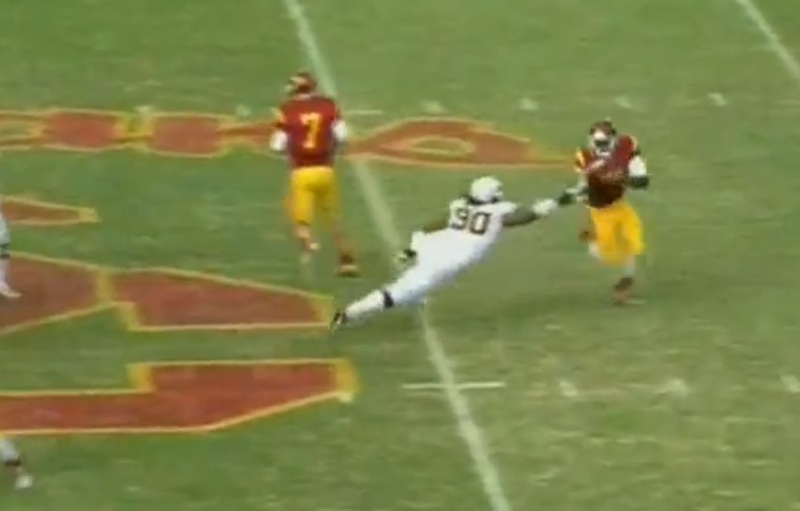 He’s so quick, and so powerful with it that it just leaves Offensive Tackles looking silly. 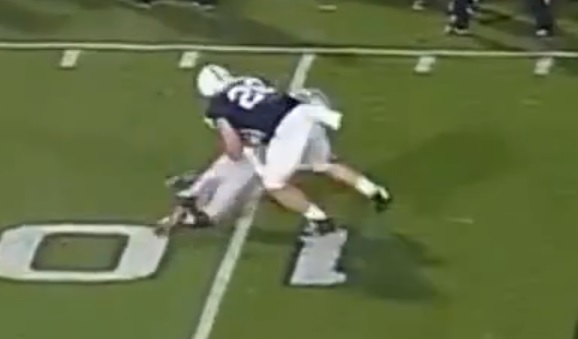 Here we see how easily Clowney beats Offensive Tackle Xavier Nixon off the snap. 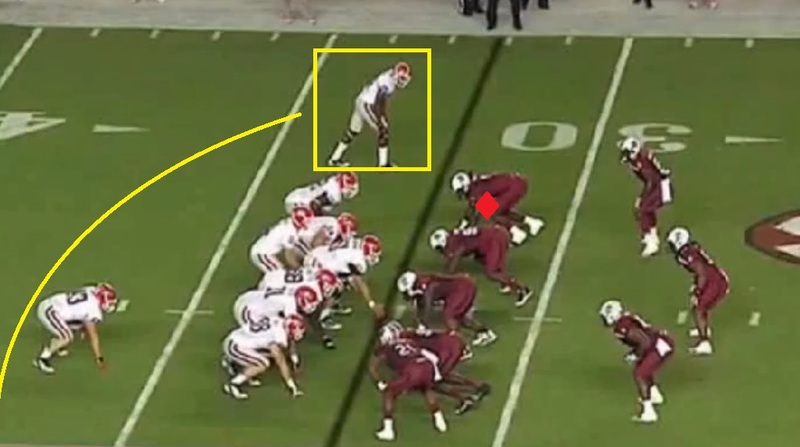 Notice the separation Clowney already has. Another look shows us how lethal this pass rush move is. 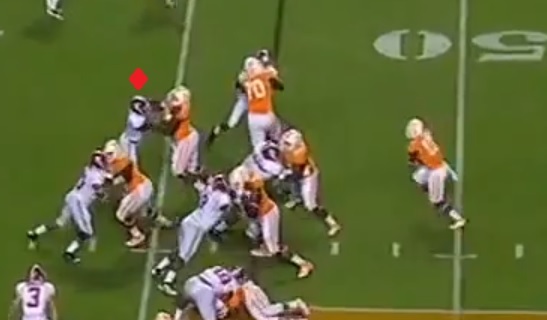 Nixon is left helpless to the inside swim, and looks like he has no clue where Clowney went. 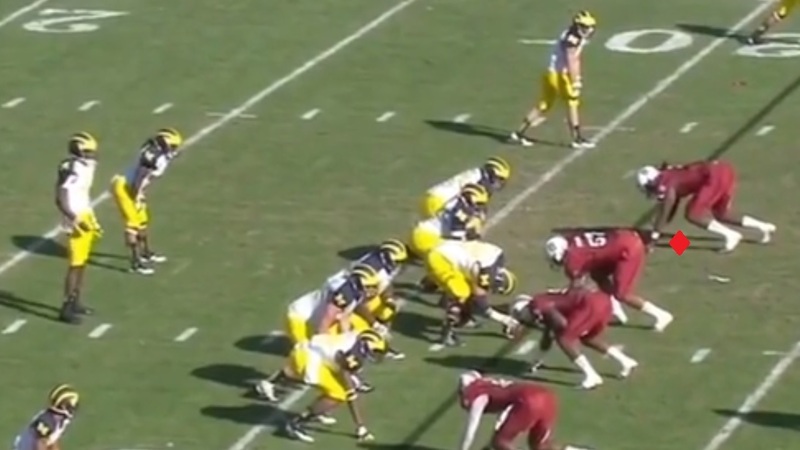 On this next play, we’ll see Clowney overpower Lewan with a powerful bull rush. 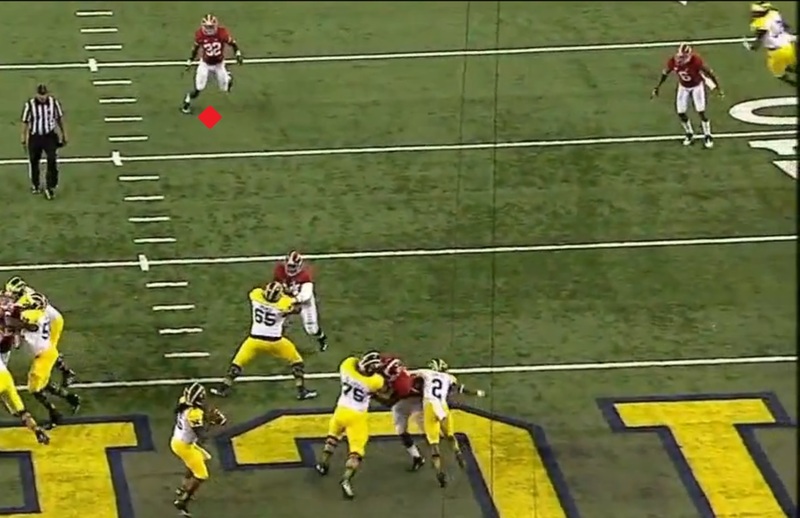 Clowney will get leverage off the snap, and be able to drive Lewan straight back into the Quarterback. 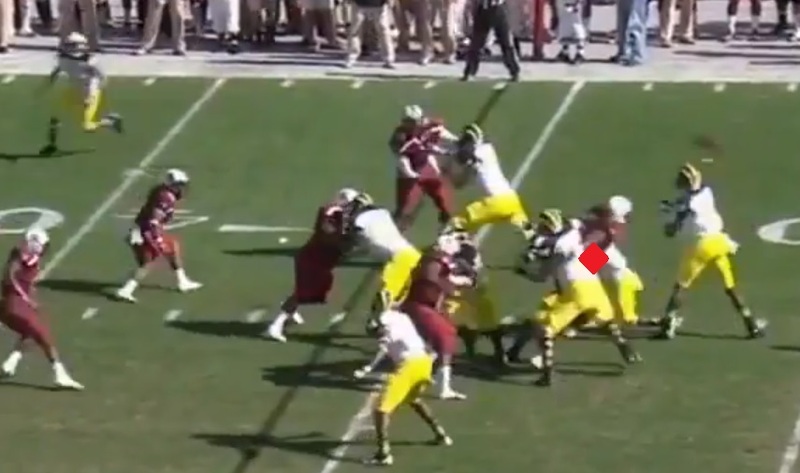 Clowney fires off the snap and immediately wins the leverage battle. 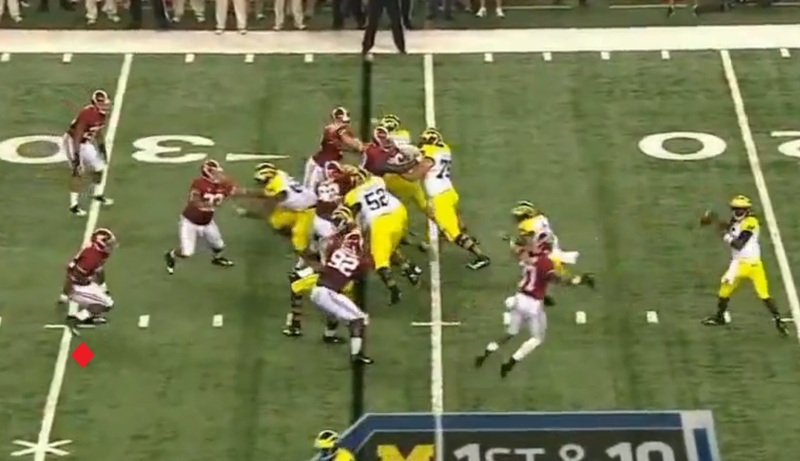 Notice how Lewan’s body is almost completely vertical, and Clowney has an arched back and his momentum is moving forward. 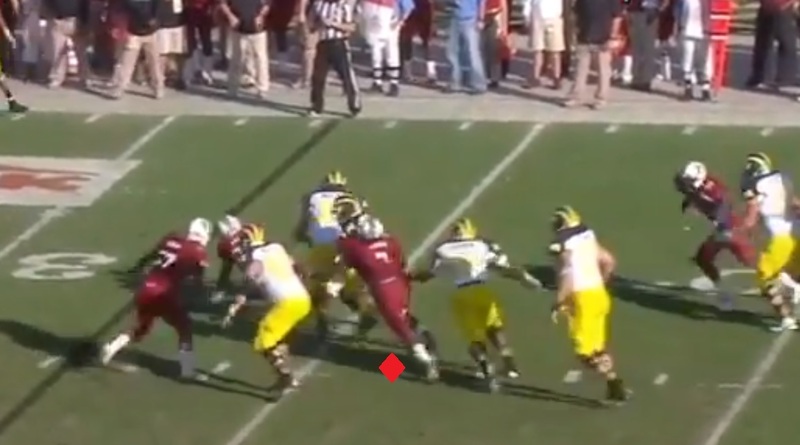 This creates large amounts of leverage, and allows Clowney to drive Lewan straight back. 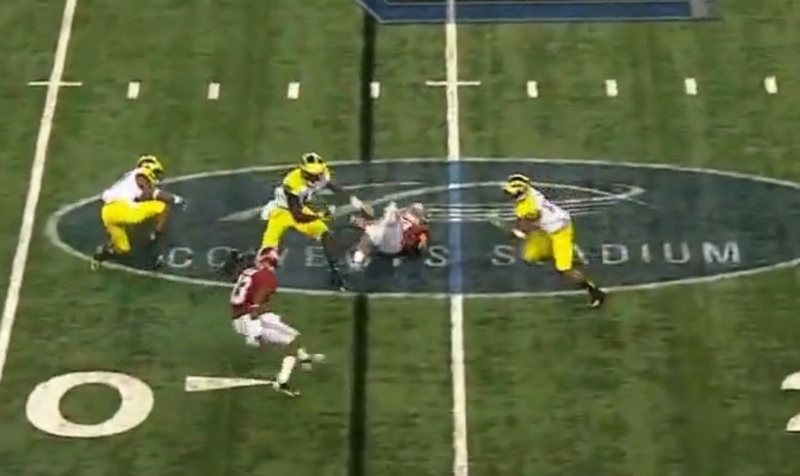 In order to try and stop Clowney’s rush, Lewan is forced to hold him. 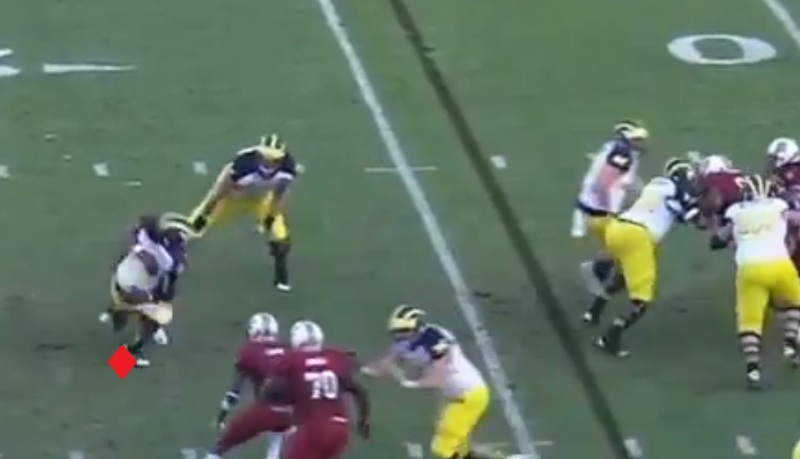 Even with the hold Clowney is able to drive Lewan straight back into the QB and force Gardner to make a hurried throw. On this last rush, we’ll see Clowney use nothing but speed to get to the Quarterback and bring him down. Clowney get’s a great burst off the line, and the Left Tackle is already in a bad spot being asked to kick out and mirror his athleticism with his feet. 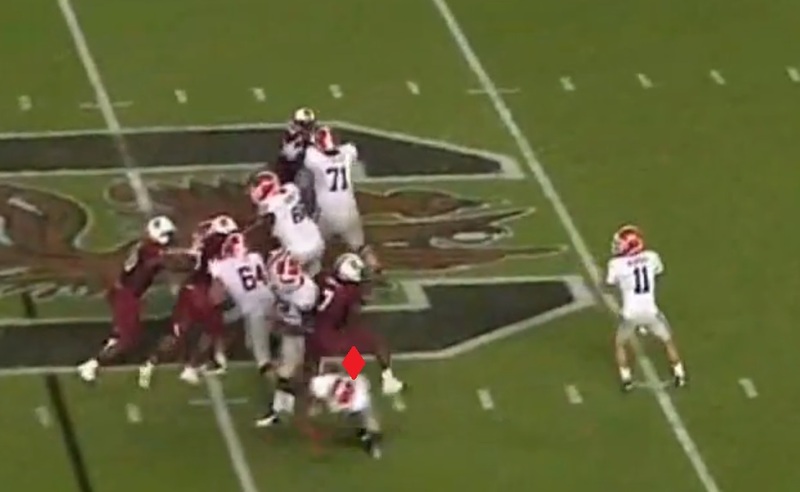 The Left Tackle does a pretty good job getting in front of Clowney, but his foot speed isn’t quick enough to take away the edge from the South Carolina End. The Running Back doesn’t do a good job chipping Clowney as he’s coming out of the backfield, and Clowney is easily able to get around the edge of the Left Tackle. 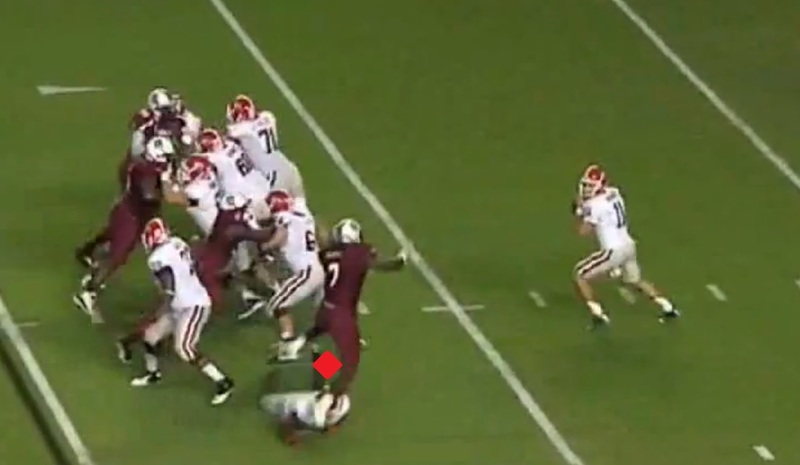 Once he’s around the edge the only thing left to do is finish the play with a sack, which Clowney does with ease. Clowney isn’t just a one trick pony though. Along with excelling as a pass rusher, he’s also a very good run defender. 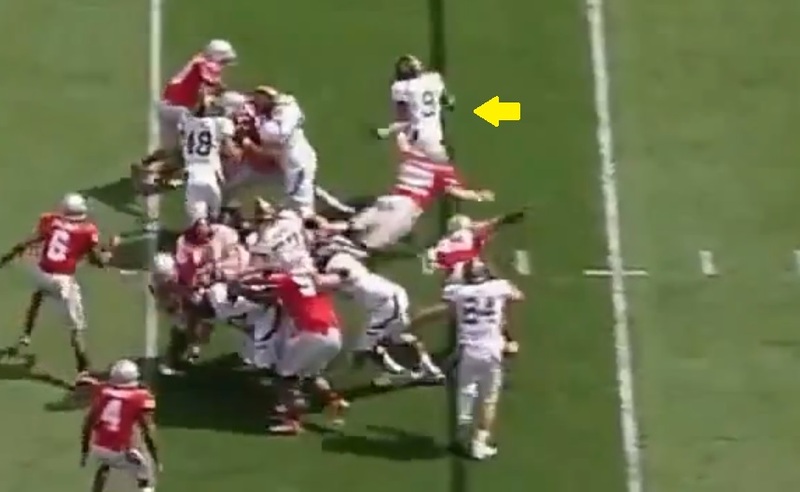 As already mentioned he pursues the entire field well, he’s good at sealing the edge, and he’s a strong tackler. 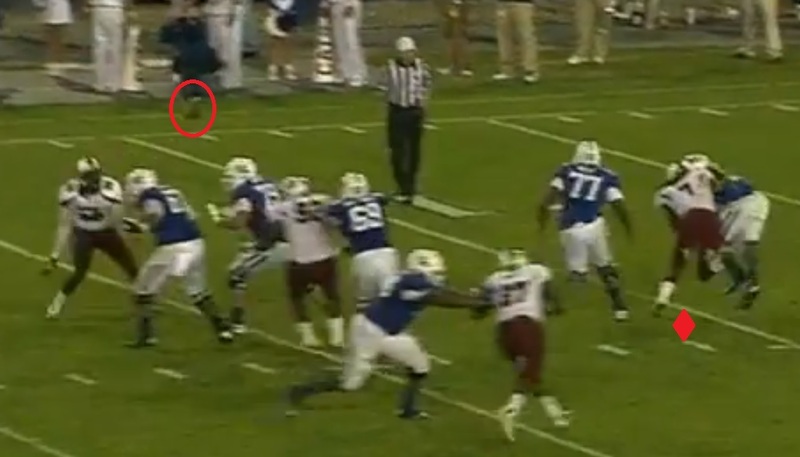 On this play we’ll see Clowney seal the edge against Kentucky, and not allow the Running Back to get to the sideline. 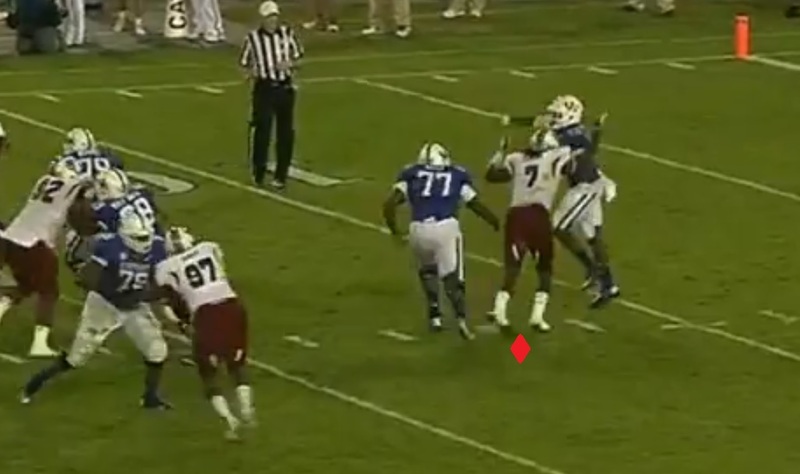 Once again Clowney explodes off the line, and gains the leverage advantage against the Left Tackle. He recognizes early that the play is a pitch to the left side of the field, and begins sliding the Tackle laterally. With the leverage advantage he’s able to continue sliding the LT laterally, keeping himself in between the Running Back and his lane to the edge of the field. This forces the RB to cut back inside, where he and his teammates are there to clean up. 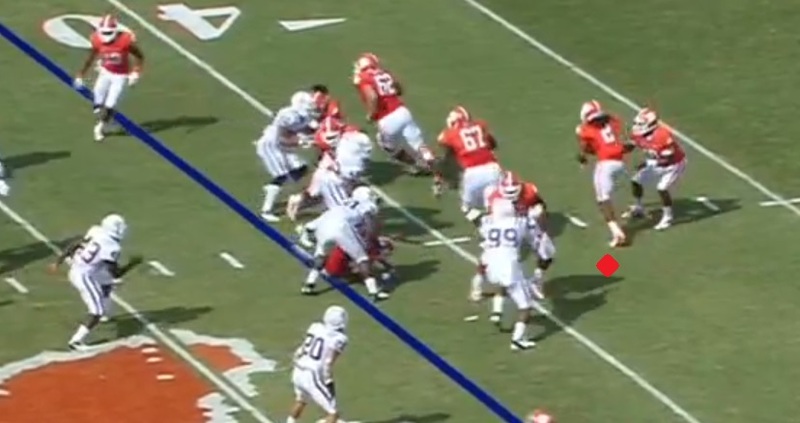 Here we’ll see Clowney overpower a blocker to make the tackle in the backfield. Clowney again gets an explosive burst off the snap. He’s given a free release which allows him to build up speed. This is going to create an extremely tough matchup for the Right Guard who is pulling to block him. 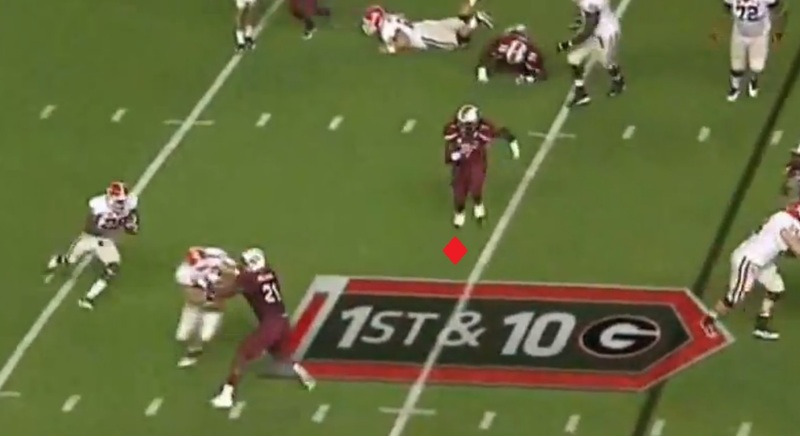 The Guard makes contact, but Clowney is able to pretty easily overpower him on the play. Another look at the play shows us how Clowney does it. 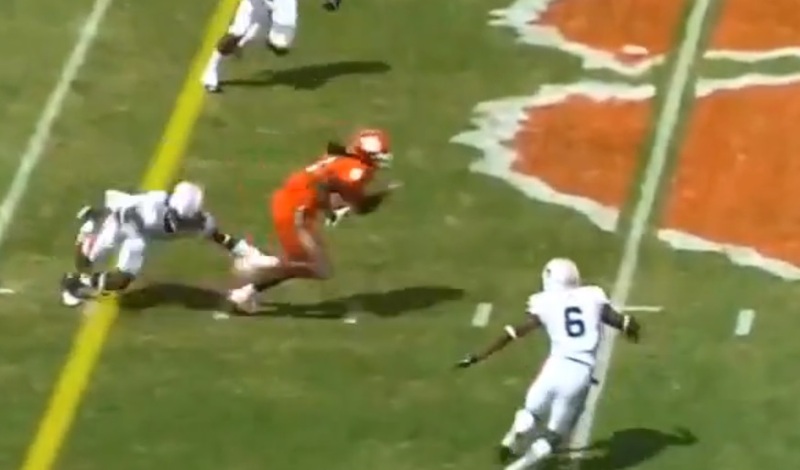 With nothing but speed Clowney crashes into the pulling Guard. 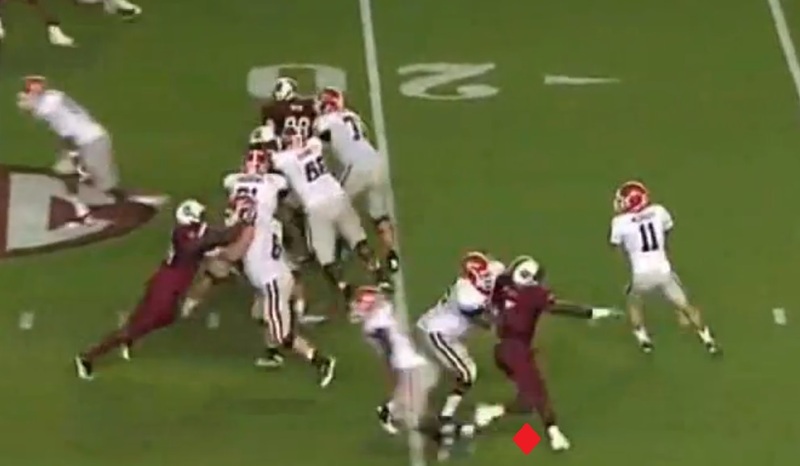 Clowney’s forward momentum is so powerful it shocks the blocker and jolts him backwards. This creates balance issues, and he’s able to run through the blocking attempt despite the Guard doing his best to hold Clowney. 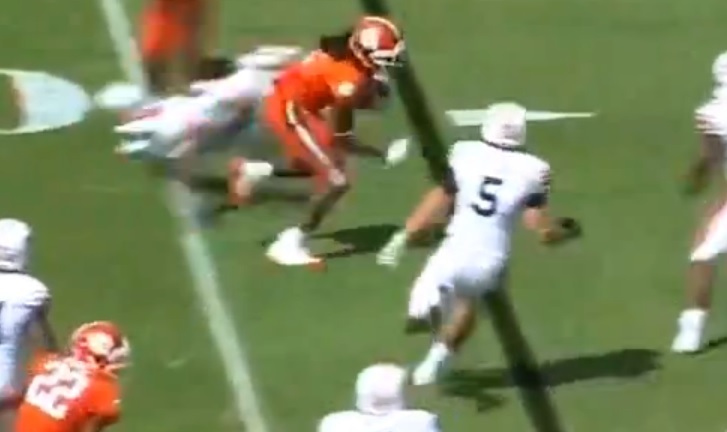 Clowney is able to easily clean up the play in the backfield. The last thing I want to touch on, is Clowney’s ability to make big plays. Whether it’s a critical sack, and forced fumble, or knocking the pass down, Clowney always seems to be able to make a big play when his team needs it. 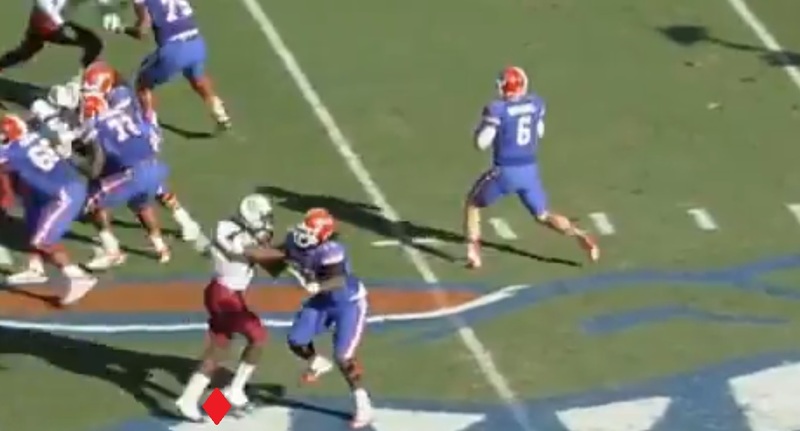 Here we’ll see Clowney’s ability to force the QB to throw the ball long before he’s ready. 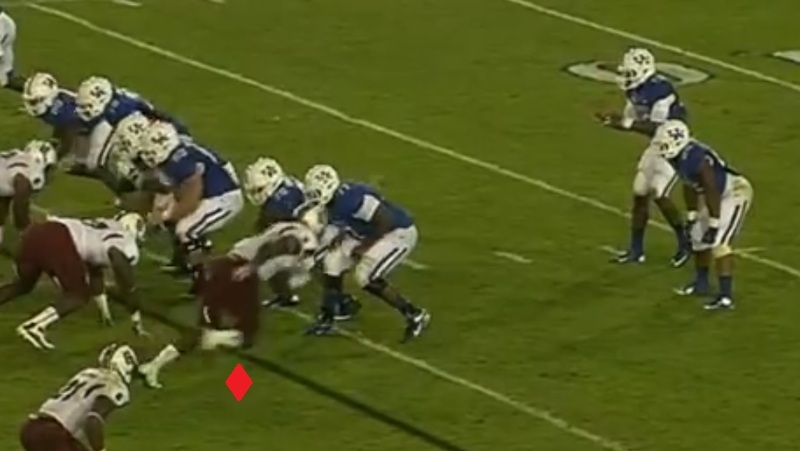 Notice how well Clowney has jumped the snap. He’s already well into his first step as the same time as the ball is being snapped. 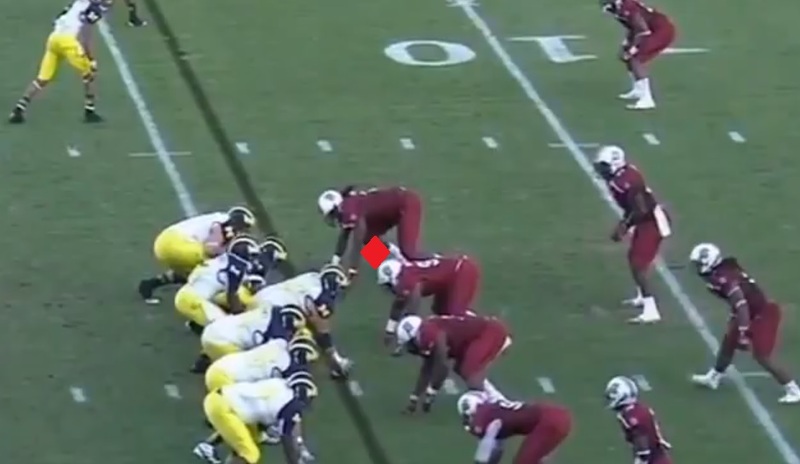 Clowney is easily able to beat the Left Tackle around the edge, and get pressure on the QB. This forces the QB to to throw the ball well before he’s ready, and without his feet set. The results are disastrous. The ball his the Right Guard in the back and bounces in the air. 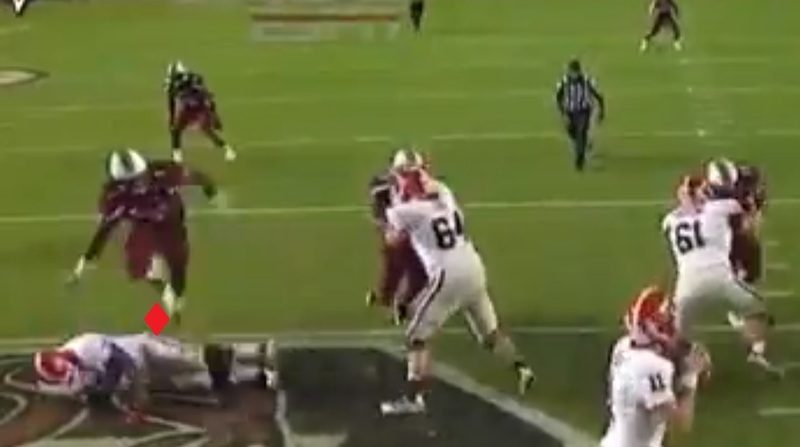 The South Carolina Defensive Tackle will intercept the ball inside the 20 yard line. In a game where Kentucky was down by 11 with less than seven minutes left in the fourth quarter this effectively ended the game. The best example of his play making ability came in the form of a bone jarring tackle against an unfortunate Michigan Running Back, in a play that is simply known as “The Hit” among college football fans. After a controversial call against the Gamecocks, Clowney comes off the edge unblocked due to a missed assignment and unloads on the back, jarring his helmet, the football, and perhaps even his body loose in the process. For those that need a refresher, just want to see it again, or were living under a rock during the last nine months here’s the clip. Anything I put here will be nitpicking at best. Clowney does practically everything better than anyone else in the nation at his position. However there is one area of his game I would like to see him get better in as the 2013 season plays out. 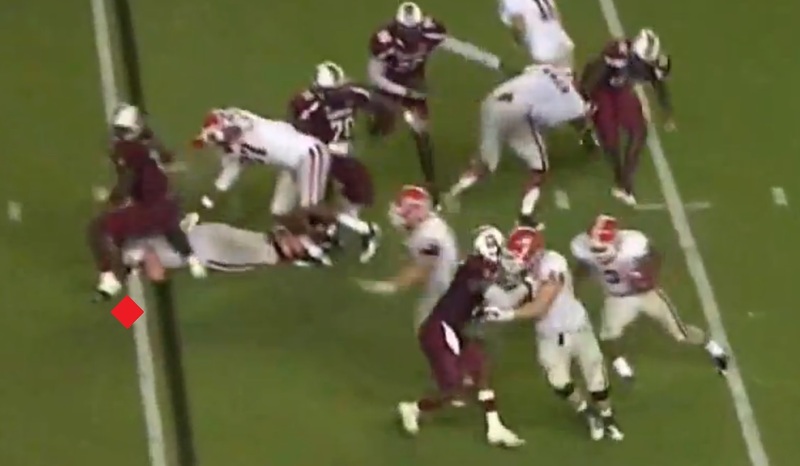 If I had to pick out one area where Clowney could get better it would be finishing tackles in space. As I said before this is a bit of nitpicking because he even has times where he looks very good in space. 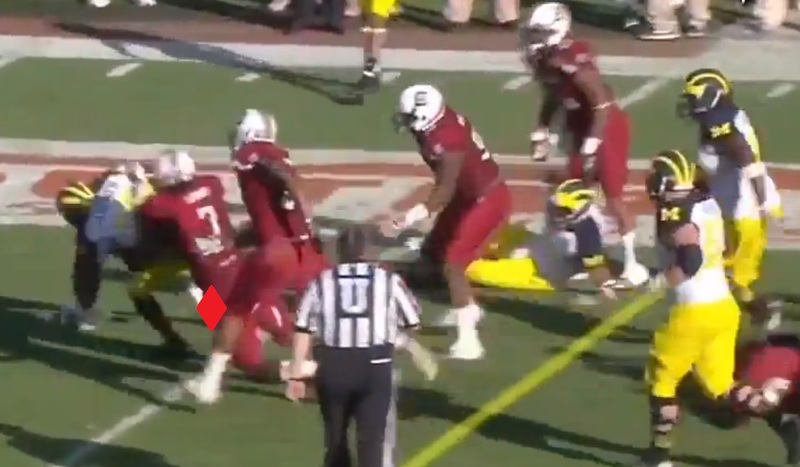 However there are plays where it looks like Clowney has a ball carrier dead to rights, only to have an awkward looking tackle attempt be unsuccessful. Here’s several attempts from the same game against Florida. 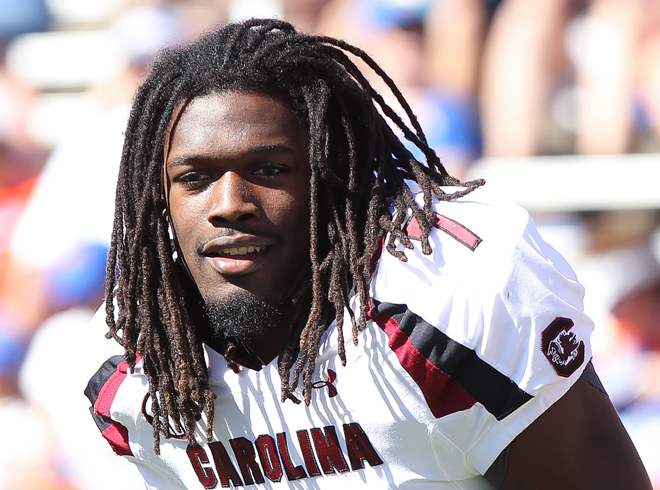 Clowney is the closest thing to a complete football player you can get going into the NFL Draft. He’s an incredible athlete, with great size and length. He has an explosive first step that at times, makes his pass rush moves unnecessary. When he does have to use rush moves though, he’s not lacking at all. He’s got a great speed rush, timing the snap well and exploding around the Tackle with great hip flexibility and bend. He routinely plays with great leverage, allowing his powerful bull rush to be effective at pushing Tackles back into the QB and collapsing the pocket. Without a doubt the best move he has is his swim move. He has the ability to swim both inside and outside of the tackle, something no other pass rusher shows on a regular basis. His outside swim move is extremely effective, turning the Tackle and leaving them forced to hold or let him go by. Even as effective as his outside swim is, his inside move is that much better. His inside swim move is absolutely devastating, leaving Tackles looking lost and completely helpless as he gets into the backfield with ease. 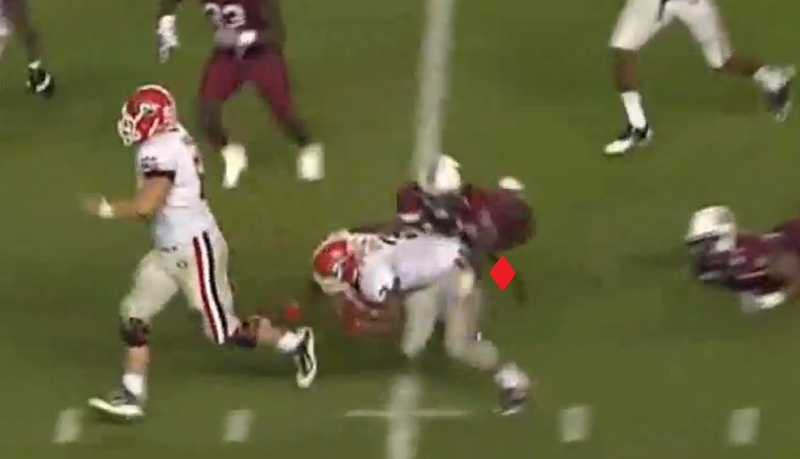 Clowney is also a very skilled Defensive End in run support. He pursues plays exceptionally well, being able to chase ball carriers sideline to sideline, and showing the ability to run them down from behind. 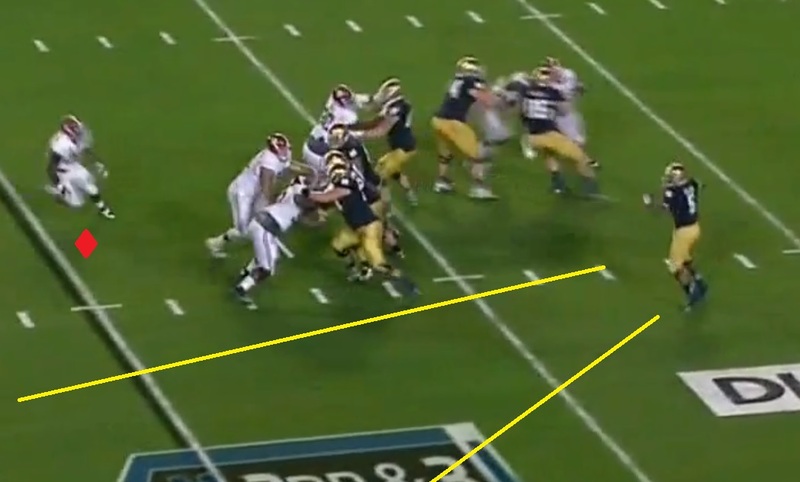 He seals the edge well, forcing ball carriers back inside where he and his teammates are waiting to clean up. He also uses great power to overpower blockers into the backfield, and is able to work through the trash at the line of scrimmage with great feet. He’s a play maker in every sense of the word, coming up with the big sack, tipped pass, or forced fumble when his team needs it most. He also creates plays for teammates, by pressuring the QB and forcing early throws. Nitpicking a bit, I would like to see him finish tackles in space at a more consistent rate. 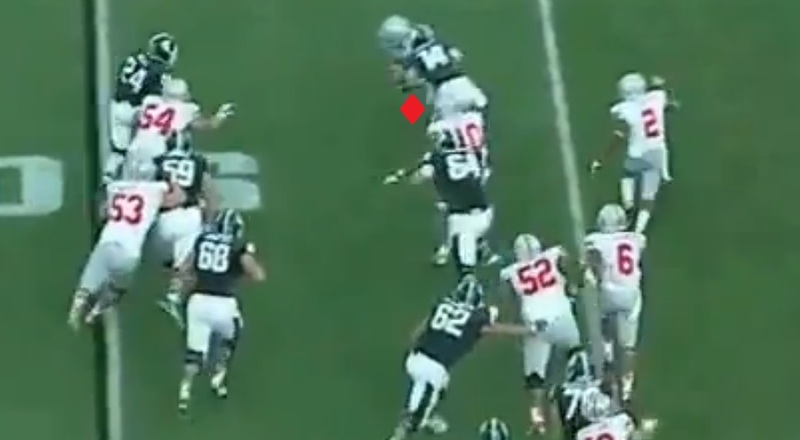 Also, his spin move isn’t as strong as his other rush moves, however he uses it far too often in my opinion. Going forward, Clowney is without a doubt the best player in college football, and will almost certainly be the top player on NFL teams Draft boards. His skill set will be intriguing to any team, and he has the ability to be a difference maker at the position, in the mold of players like Julius Peppers and Jason Pierre-Paul. We’re now four days away from the beginning of the 2013 college football season, which means it’s time for part seven of my Best of the Best series. This 10 article series will take a look at my top 10 draft eligible players in college football. This isn’t necessarily a prediction of where I feel they will be drafted, but more my thoughts on where these 10 rank against all other college players. While I fully expect all of these players to be top 15 draft selections next year, there could always be fluctuation with a premium placed on positions like Quarterback and Offensive Tackle. 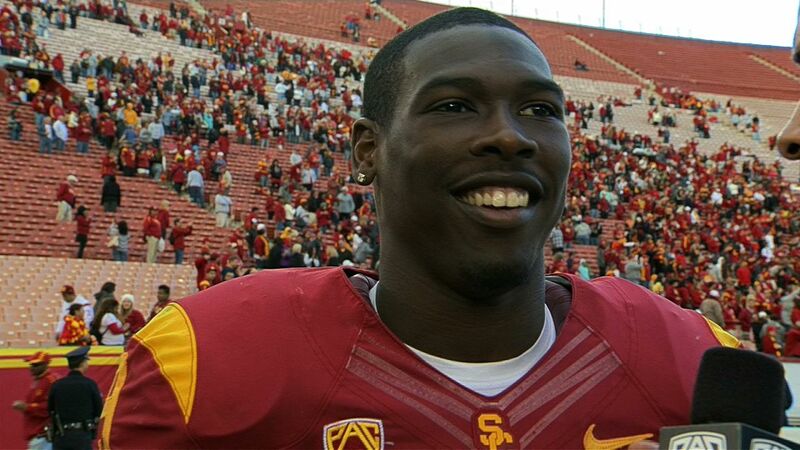 With that said, it’s time to look at my number three prospect, USC Wide Receiver Marqise Lee. Marqise Lee came to USC as a player with only one High School season of experience at the Wide Receiver position, and a player who many expected to be a standout safety. However, he’s not just found a home at Wide Receiver, he’s turned into one of the most dangerous Weapons in college football. Lee is an explosive play maker who is elusive, and hard to get a hand on in the open field. 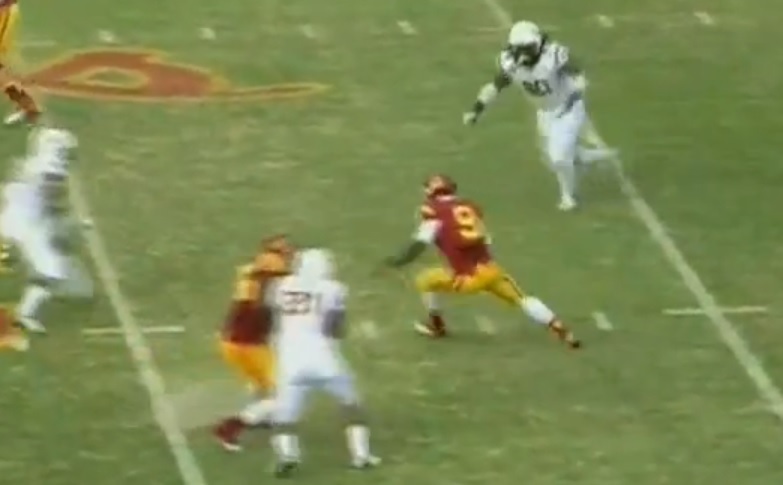 He’s shows great fight for the 50-50 ball, and uses his body well to block out a defender. He flashes the ability to be a complete receiver, however he needs to be more consistent in most areas. 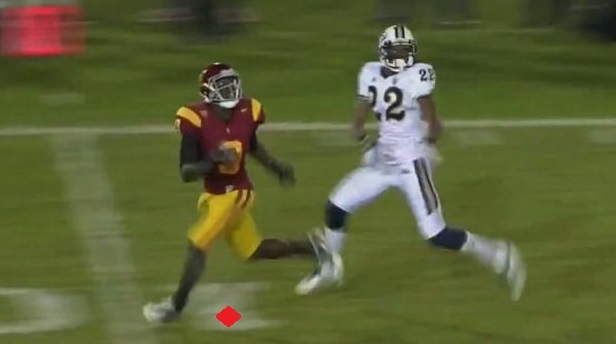 So lets take a look at one of the Best of the Best, Marqise Lee. Lee is a natural play maker. He has a quick burst off the line, and is exceptional in space. He is able to change direction fluidly fooling defenders, and shows the vision and drive to fight through space. At the start of this play we see Lee lined up on the outside of the formation. 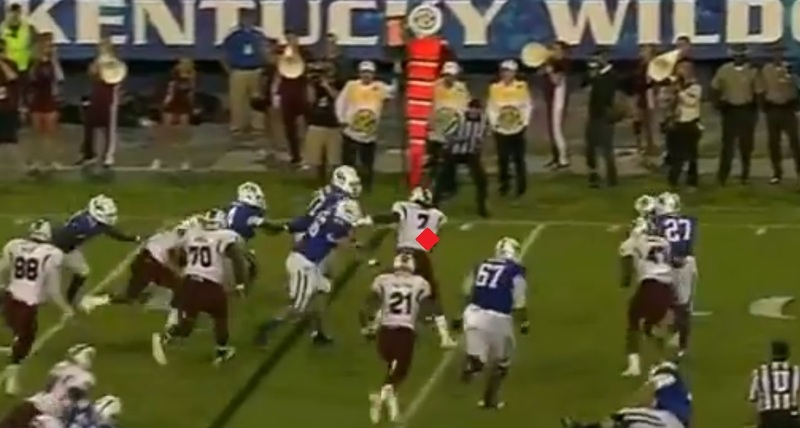 The DB Tony Grimes backs off providing cushion for Lee, instead of deciding to try and jam him on his release. As the play develops, Lee runs a shallow route and makes the catch around four yards past the line of scrimmage. The defender at this point in time has good position on him to make the tackle for a short gain. As Lee turns and sees the closing defender he immediately stabs the ground and takes his momentum back to the outside of the field. This move causes the defender to freeze. With the defender now behind the play and fighting to regain position, Lee is able to break to the edge of the field. 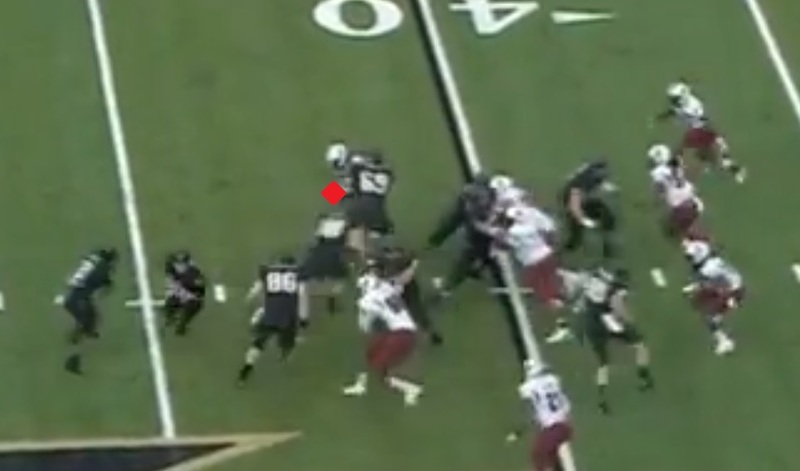 Also of note, TE Randall Telfer has done his job on the play and is down field to block out the safety. 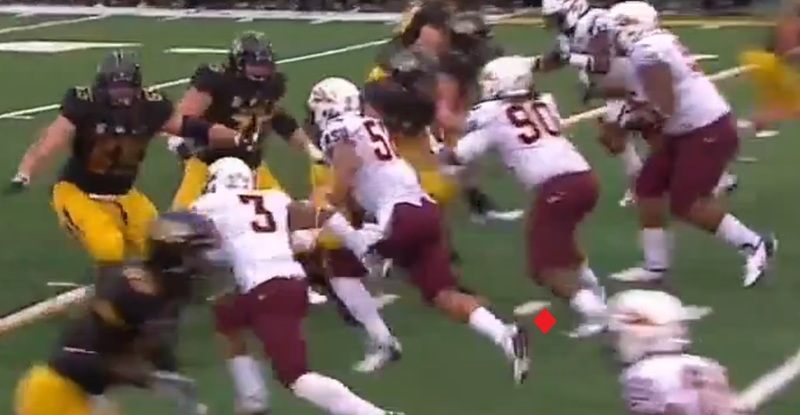 With the safety effectively removed from the play by Telfer, the last defender who has a chance to stop the play before it becomes a sizable gain is the original defender. He makes a diving tackle attempt that Lee is able to run through. Lee finishes the play demonstrating his explosiveness after the catch as he out runs all the chasing defenders to the end zone. 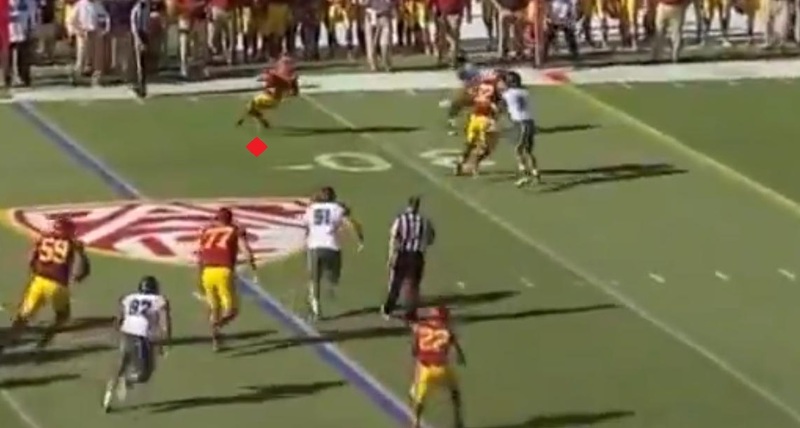 He also shows great control of his body, tiptoeing the sideline along the boundary. As the play begins, Lee takes the pitch to the left and works his way to the edge. He is able to make the defender Sutton miss in the backfield, and continues through the play. As the defender closes in on him, Lee realizes the other side of the field is relatively open, and looks to cut the play back. Lee makes an exceptional cut inside of the defender leaving him vulnerable to an incoming block. He shows great strength to fight through the trash, and run through numerous tackle attempts. His QB helps him out, blocking the defender with the best angle, and Lee is able to turn a loss or no gain on the play into a significant gain down field. Even though he doesn’t possess sub 4.4 speed, Lee is an incredibly explosive receiver. He’s quick off the line, and once the ball is in his hands he shows the ability to take it the distance on most plays. 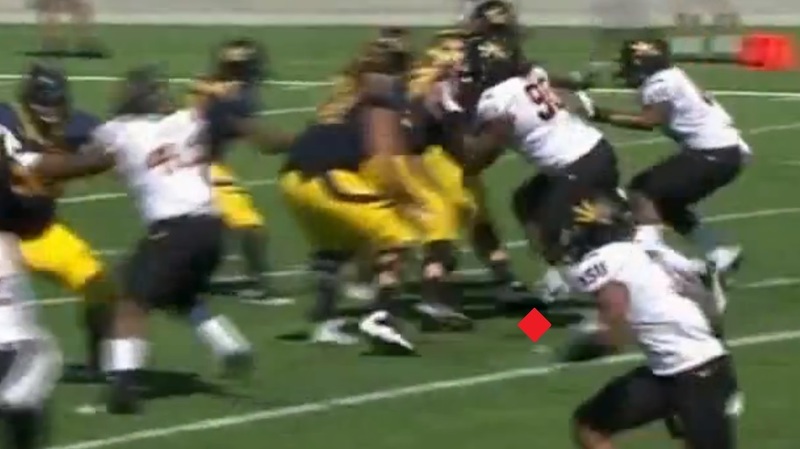 At the start of this play against Arizona Lee is again given a free release by the defender who is aware of what can happen if he lets Lee get behind him. As Lee makes the catch you can see he has six defenders in close proximity to close in and make the play, with just one blocker. As the first defender fails in his tackle attempt Lee begins to accelerate across the field and away from the defenders. Now Lee has really put the defense in a bad position, he’s managed to evade several of the defenders that were in position to bottle him up. Now the only worries are the man to the left and slightly up field of him, and the safety closing in from the bottom of the screen. The safety is able to get a hand on Lee to slow him down slightly, however Lee shows good ability to run through the tackle attempt and keep going. With the safety now out of the picture Lee escapes towards the sideline, maintaining his distance from the chasing defenders. Even with a defender in close proximity, he is able to maintain enough distance to finish the play for a touchdown. Another example of his explosive ability is demonstrated in the same game against Arizona. Lee makes the catch about 12 yards down field, with a defender in decent position to make the play. Lee immediately looks to turn up field. The defender who at this time has a pretty good angle on him begins to close in. As Lee continues up field, he accelerates quickly, and is able to out run the defenders tackling attempt. As Lee continues to accelerate, he leaves three defenders in an impossible situation. There is no play to be made. Lee finishes the play pulling away from all players including his blocker Robert Woods, and walks into the end zone for a touchdown. Lee shows great effort on the field for 50/50 balls. He high points the football exceptionally well in most instances, uses his body to shield defenders, and he fights through contact down field to put himself in position to make plays. 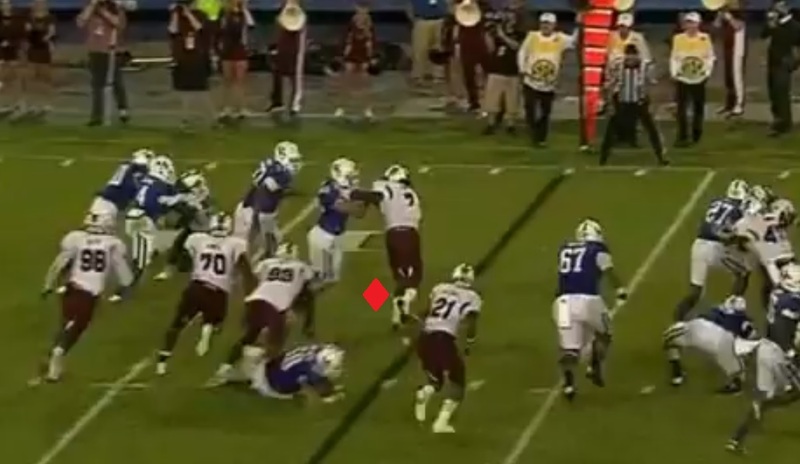 On this play we can see that an under thrown ball has put Lee out of position. The defender is now in front of him, and is in the driver’s seat to make a play on this ball. As the play unfolds though, we can see that Lee ends up winning the match up, putting the Trojans in position to extend their lead in a huge upset win. Another angle of the play shows us that Lee is able to time his leap and get slightly higher than the defender to make first contact with the football. Lee finishes the play by hauling in the contested catch for a long gain inside the red zone. On this play Lee demonstrates his ability to shield the defender on the jump ball in the end zone. As the play begins the defender is left on an island. The defender makes a critical mistake and does not jam Lee off the line. This allows him to break towards the end zone uninterrupted. Lee turns in towards the football, walling off his defender and making it almost impossible for him to make a play on the football. Despite the defenders effort on the play, Lee has now gained position and he is able to out leap the defender and make the catch for a touchdown. 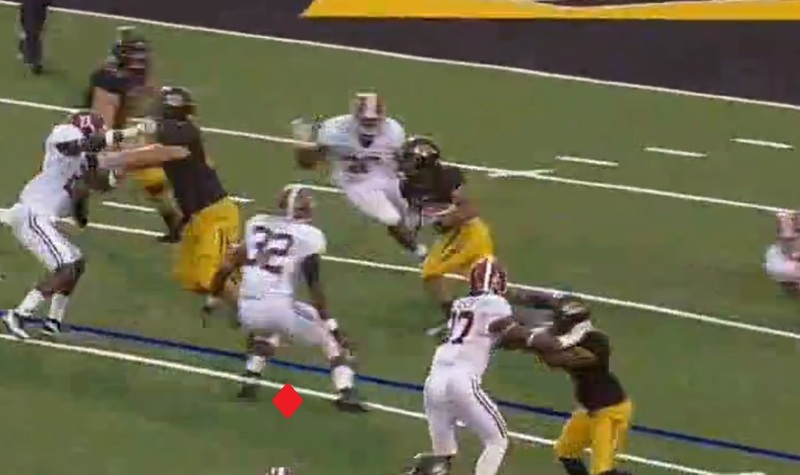 In this example we can see Lee being faced with contact very early in his route. The defender has used a technique known as an armbar to pin Lee’s inside arm down, and slow him through his route. 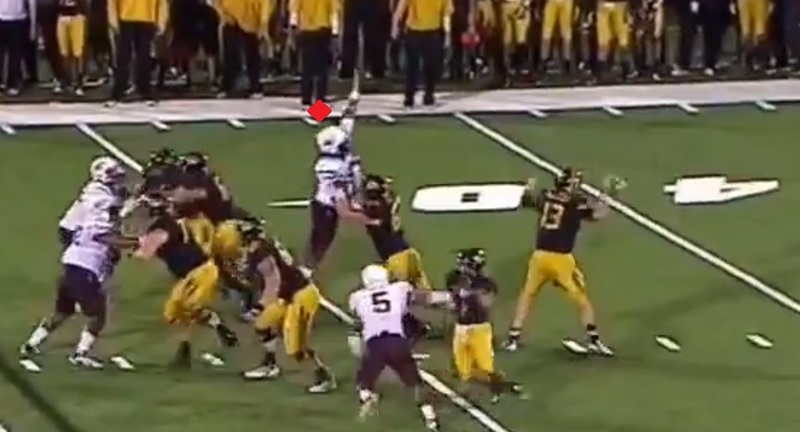 Lee like all great receivers, continues to fight through the contact while tracking the ball through the air. Lee is able to use his strength to break free, and instantly begins gaining separation. Lee is able to finish the play, making the catch for a touchdown and not having to rely on the pass interference flag that was thrown. On this last play to demonstrate Lee’s determination and effort, we will look at a touchdown Lee had against Washington. Lee runs another simple shallow route, and turns back to his QB providing him an easy target on the four yard line. After securing the catch, Lee immediately looks to turn up field and fight for the score. 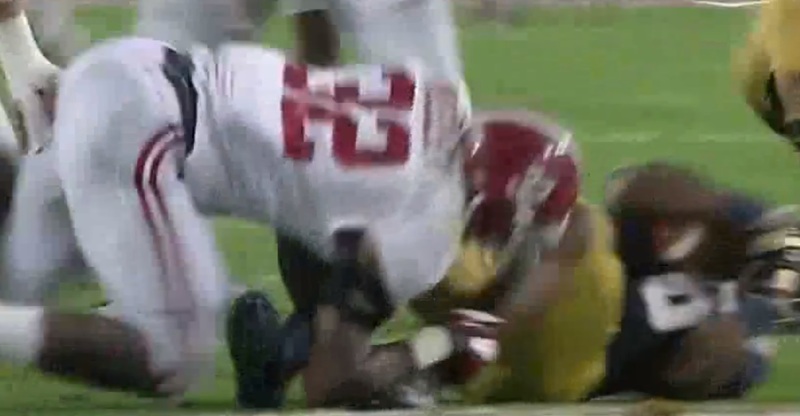 Lee is contacted just short of the goal line, but instead of being driven backwards he stays upright and keeps his legs moving fighting to cross the plane. Lee continues to fight and the result is buying enough time for his teammates to join the pile and move it across the goal line for a score. Lee flashes the natural hand catching characteristics, showing the ability to go up and pluck the football out of the air. He has soft hands, and does well securing the catch. On this play you can clearly see how smooth he can look catching the ball with his hands. The QB places the ball high, but Lee is able to time his leap correctly and put himself in position to make the play. Now you see Lee show the ability to fully extend his body and pluck the ball out of the air. Lee then finishes the play by showing off his incredible elusiveness. He is able to evade two tacklers, and then walks into the end zone with an easy touchdown . On this play Lee runs a simple slant pattern. 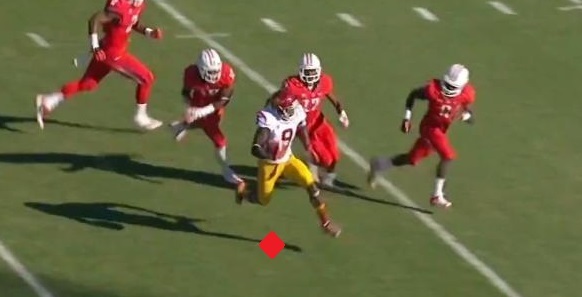 He demonstrates sharp route running, which helps him create separation from the defender. As the ball arrives, he once again shows the ability to attack it and make the hands catch, because he’s able to make the reception in stride, he turns the catch into an easy touchdown. While every single player in my Best of the Best series has traits to their game that in my opinion make them stand out, they all have things they need to improve too. So let’s look at a couple of areas where I would like to see Lee improve in 2013. I almost hate to knock Lee on this, because it’s part of what makes him so special. However, sometimes the young receiver can become a little too aggressive resulting in plays for negative yardage, or turnovers. On this play Lee is lined up in the backfield, and will take a pitch designed to go to the left. Lee makes the first man miss, but is surrounded by Bruin defenders with nowhere to go. This play looks to be a lost cause. Despite defenders closing in rapidly, Lee still looks to cut back to the other side of the field, instead of heading North and South to pick up what little yards are there. Finding no cutback lane available, Lee decides to finally try to get what yards he can on this busted play. All this dancing around in the backfield has caused Lee to neglect protecting the football, and as he is tackled the ball will come out. Instead of looking for an all or nothing play like he does almost every time he touches the ball, he could have just taken the yards available and lived to fight another day. Lee is a raw athlete who has only been playing Wide Receiver since his Senior year of High School. His inexperience at the position shows up in several areas of his game. When route running he can take too many steps throughout his routes, reducing the amount of separation he can gain. Also he has trouble beating pressing Corners off the line at times due to unrefined technique, and experience in those situations. Finally while he flashes the ability to be a great hands catcher, route runner and very capable blocker, inexperience leads to lapses in his technique and production in these areas. This isn’t really a concern however, because he has become better in all of these areas from the start of his Freshman year to the end of the 2012 season, and I would expect him to make the same strides this year. Lee is an incredible athlete who happens to play the Wide Receiver position. He shows great ability to track the football in the air, and flashes phenomenal ball skills to attack the football at its highest point and make the hands catch. At times he’s a great route runner, making sharp cuts and utilizing the entire route tree throughout games. While he doesn’t have as much top end speed as fellow Best of the Best member Sammy Watkins, he does show enough explosive ability after the catch to outrun chasing defenders in most situations. He also has an incredible first step, exploding off the line. He’s incredibly lethal once he secures the catch, showing great elusive ability, as well as the ability to run through tackles. Furthermore, he uses his body well to shield the defender from the ball, and fights for the 50-50 ball better than any Wide Receiver in the nation. He’s also a very willing and effective blocker, though his technique could use some refining. His biggest flaw is probably his desire to turn every play into a touchdown. 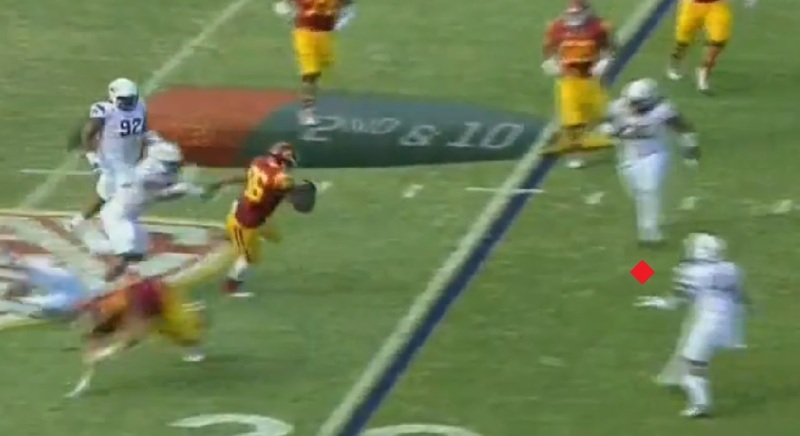 This is evident from the very first time you watch Marqise Lee play, as he is always looking for the cutback lane that will provide the potential huge gain. Part of this is why he is one of the Best of the Best, however he needs to be smarter in these situations. 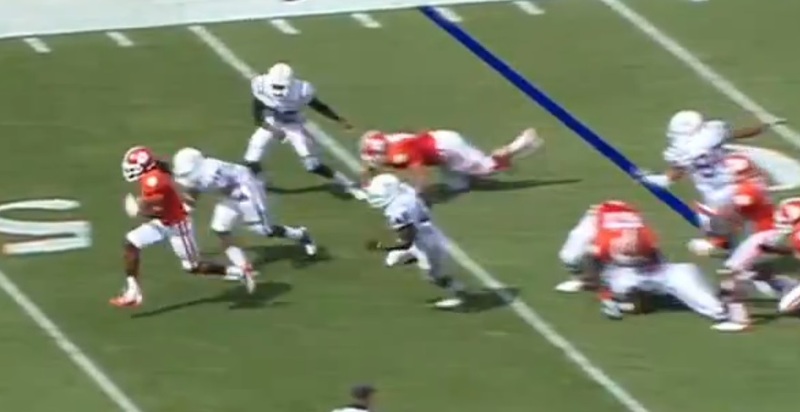 He regularly goes backwards to get across field, at times doing this on conversion downs. While it has been mostly successful for him in the college game, he can’t make a habit of this going forward to the NFL. His other “flaw” if you will is his inexperience at the position. Lee’s only been playing Wide Receiver for three years now, and while he shows the ability to be a complete player at the position, he has lapses in his game from time to time. As I mentioned before I’m not overly concerned in this as he’s already made great strides in this area. However I would like to see him get better at fighting through more physical Corners, as well as refining his route running to create max separation. We’re now six days away from the beginning of the 2013 college football season, which means it’s time for part three of my Best of the Best series. This 10 article series will take a look at my top 10 draft eligible players in college football. For my rankings, I factored my Draft stock for each player, as well as their impact in the college game. While I fully expect all of these players to be top 15 draft selections next year, there could always be fluctuation with a premium placed on positions like Quarterback and Offensive Tackle. 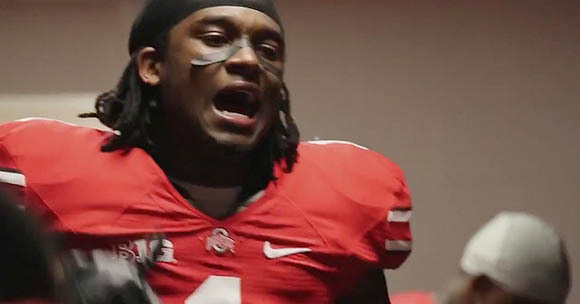 With that said, it’s time to look at my number six prospect, Ohio State Cornerback Bradley Roby. A shutdown Corner is one of the biggest luxuries a defense can have. Sure a tenacious pass rush can make your back four look a lot better then they are, but having that difference maker who can take away a teams best weapon in the passing game is something no Head Coach would turn down. 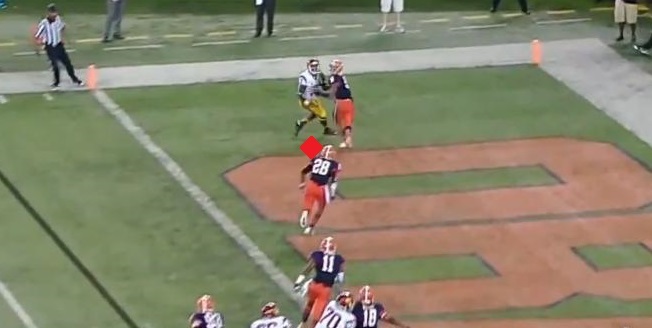 Enter Bradley Roby, perhaps the closest thing to a “lockdown” Corner in the draft eligible Cornerback prospects. Roby flashed talent as early as the first game he played for the Buckeyes and never looked back, registering 47 total tackles and three interceptions in his Redshirt Freshman season. In 2012 he improved significantly, with 63 total tackles, and 17 pass breakups (his 19 passes defended lead the nation), and while he only registered two interceptions last year, it certainly wasn’t for lack of ability. So lets look at what makes Roby one of the Best of the Best. The first game I watched of Roby’s I made a quick observation. 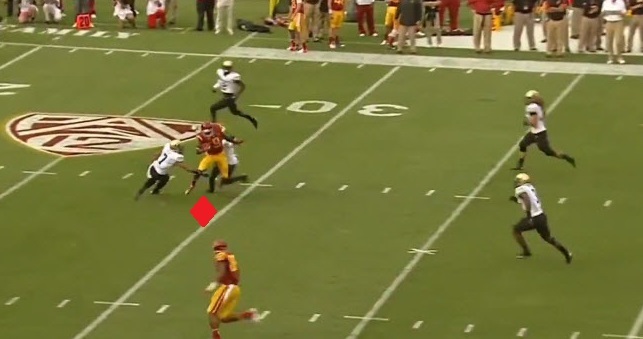 The Corner doesn’t look for the football while in coverage much. I chalked it up to just being one game and continued to watch. By the time I started watching his play from a fifth game I came to a realization. This guy doesn’t look for the football much. While that sounds troubling, and it could be, he excels in coverage for one reason. Roby has exceptional ability to play his man, and disrupt passes without locating the football. In this first image the Receiver has won the battle for positioning, and has also extended further to meet the ball before Roby. We can also see that Roby’s head isn’t turned towards the football tracking it, instead he’s playing his man the entire way. Another look at the play. 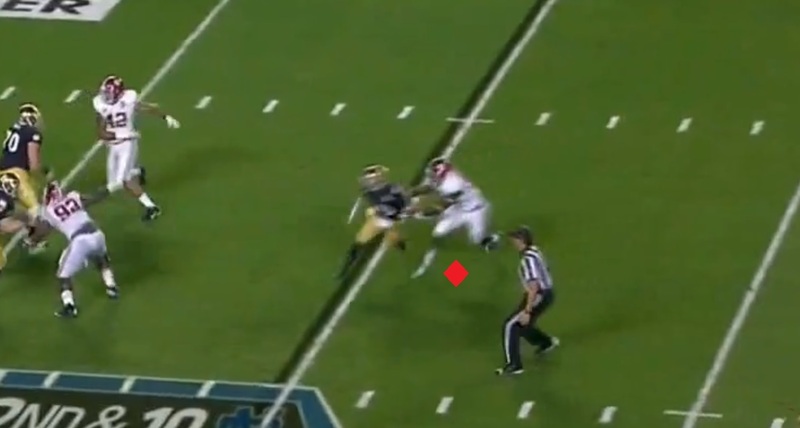 Again, you can clearly see the Receiver has the better positioning, and Roby is not tracking the football. 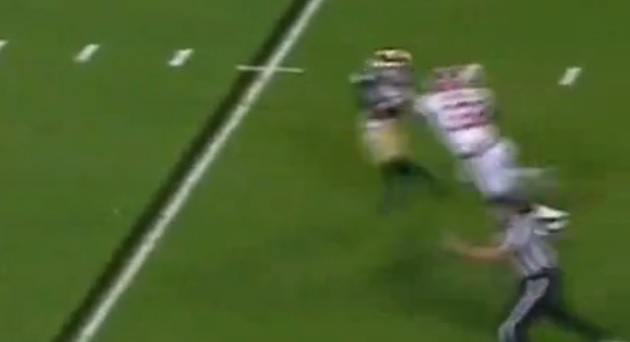 Here’s where Roby wins the play though. 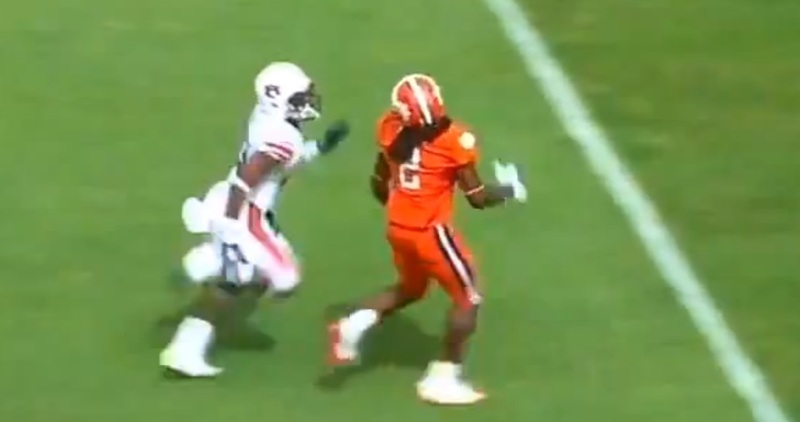 As the offensive player extends to make the catch you can see Roby hands go up with him. Roby has read what his matchups body is doing and has now reacted accordingly putting himself in position to make the play despite having no clue where the football actually is. Because of his ability to adjust to the Receivers actions, Roby is in excellent position to knock the ball away with his left hand by the time the ball actually reaches Penn State’s Kyle Carter . He does just that, and the result of the play is an incompletion that takes points off the board on a play where Roby looked easily beat. Just two plays later we see almost a carbon copy of the play above, on the other side of the field. On this play Roby is much further behind and has to make up ground he didn’t on the previous play. At this point it looks like the play is over and the result will be a Penn State touchdown, however the ball hangs in the air and it gives Roby the chance to close. As the ball hangs in the air Roby is able to close the distance, but still hasn’t located the football in the air. 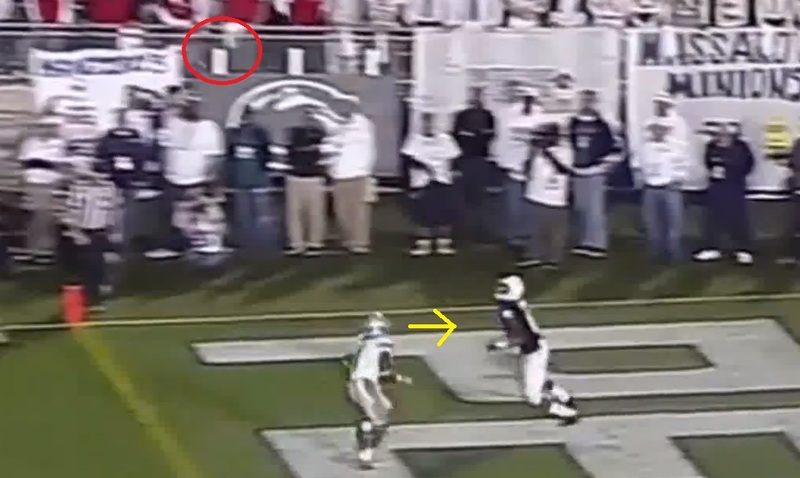 The Penn State Receiver on the other hand is turned towards the football (marked by the red circle), and is tracking it ready to make the catch. 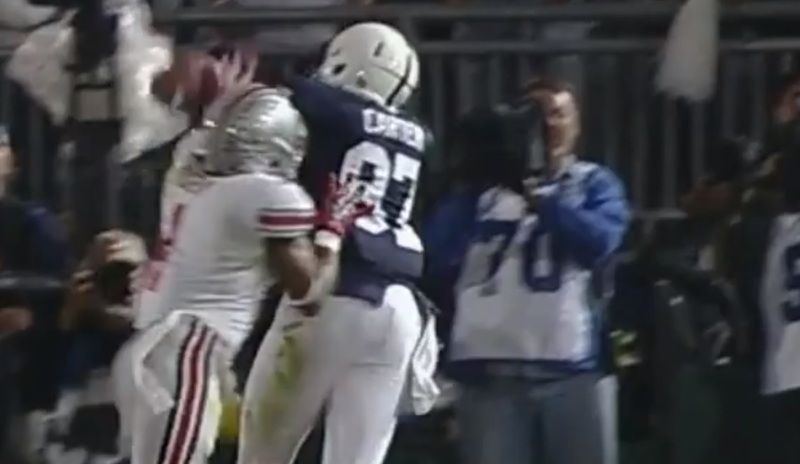 As the ball gets into the area of the players the Penn State Receiver leaps to make the catch. Roby still with his eyes locked on the Receiver reacts to the Penn State players movements, and leaps with his hand in the air to knock down the pass. Not only is his hand in perfect position to bat the pass down, but Roby has timed his leap so well that any contact between the two players will be as the ball is arriving, and not called pass interference. Roby is able to use his body to prevent the Receiver from making a catch without drawing a flag. The ball bounces off the Receivers pads, and falls harmlessly to the ground. One thing I love to see in Corners is for them to be willing, and effective tacklers. Robdy is not only willing, but he’s extremely effective, and perhaps even excellent. He shows ability to seal the edge in run defense, and displays very good wrap up tackling technique in most instances. 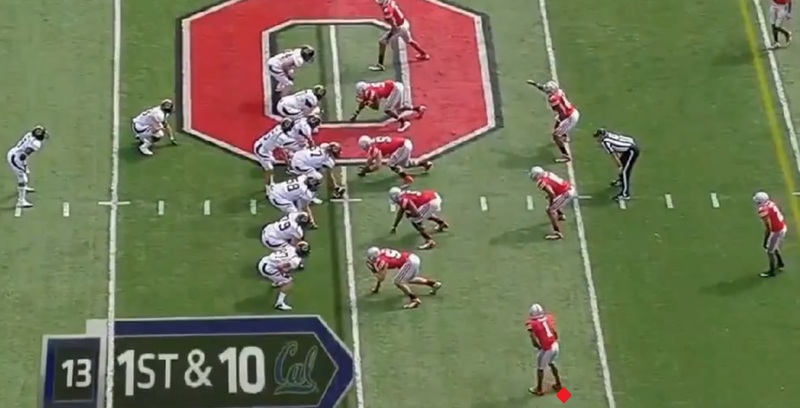 In this play against Cal, Roby’s tackling is on display in an open field situation against the Bear’s elusive C.J. Anderson. 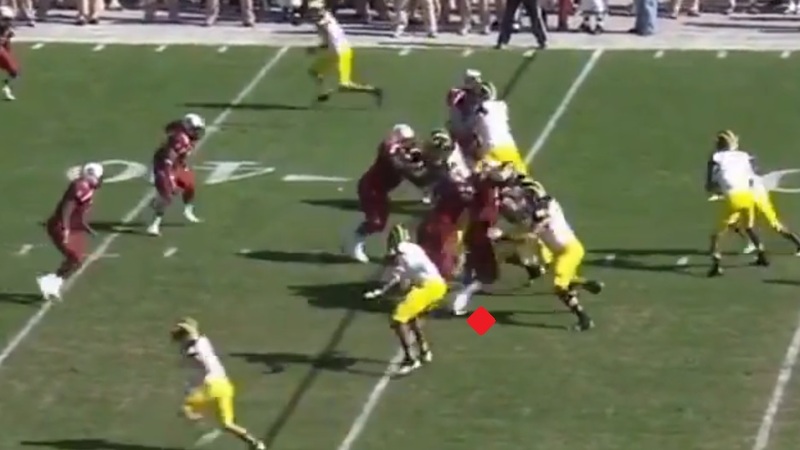 As he approaches the line of scrimmage Anderson (marked by the yellow arrow) makes the first Buckeye defender miss and is able to extend the play. 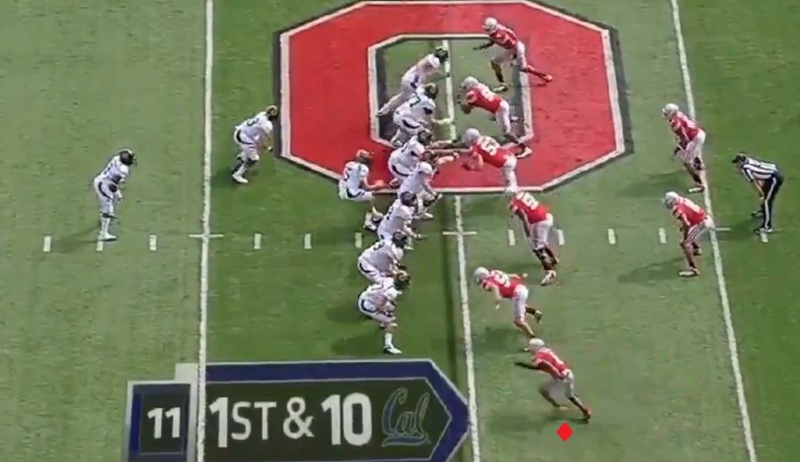 Anderson is able to elude one more Buckeye on the run (Linebacker Ryan Shazier #10), and looks like he may make it to the edge. 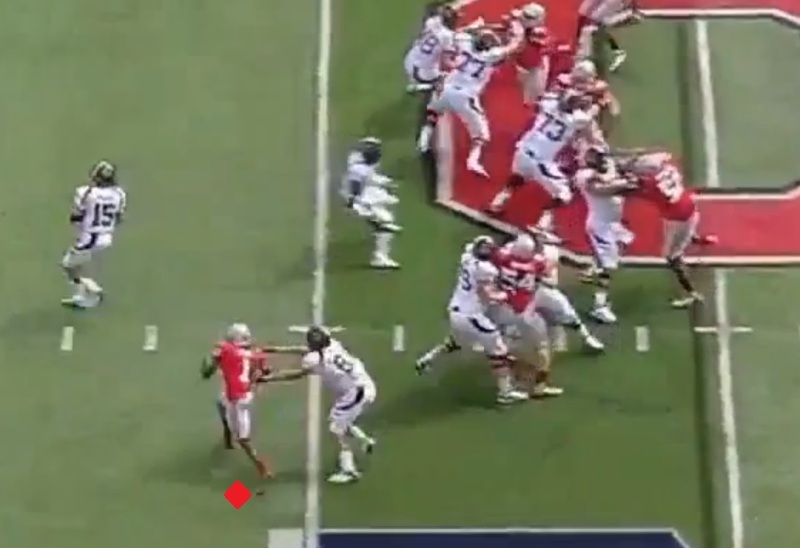 Before he can though Roby is able to close and wraps up low on Anderson. Roby shows great strength to drag Anderson to the ground for a very minimal gain. 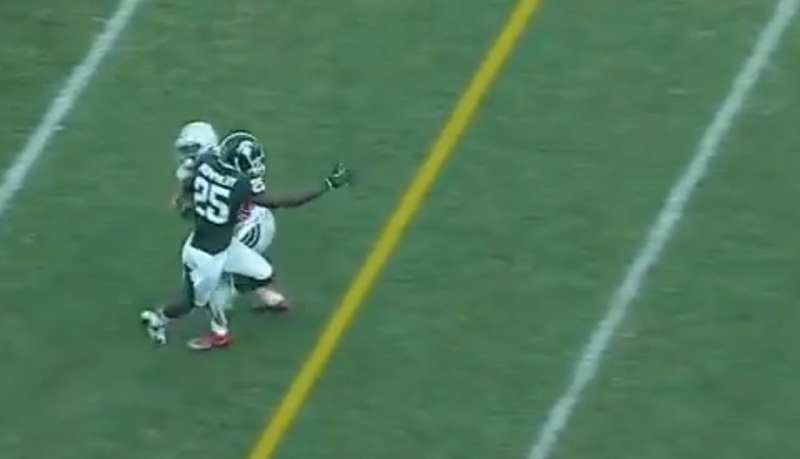 On this play against the Spartans, Roby shows his ability to seal the edge against the run effectively, and bring down one of the toughest and most physical backs in the Big Ten last year, Le’Veon Bell. 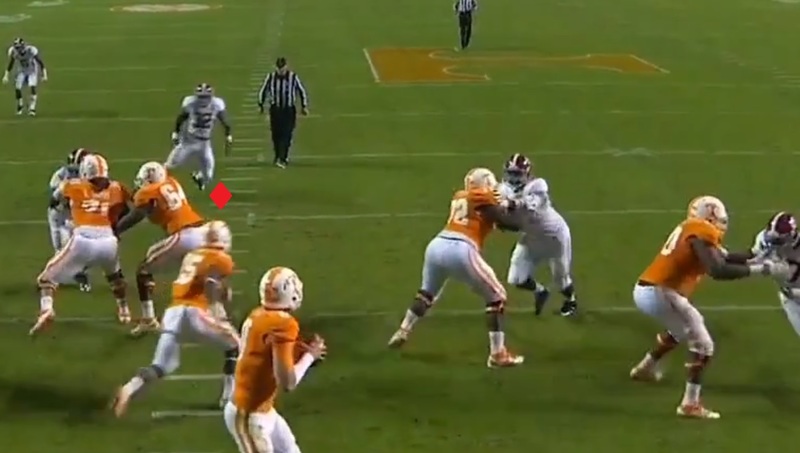 In the frame you can see that Roby is engaged by his blocker, and doesn’t look like much of a factor. 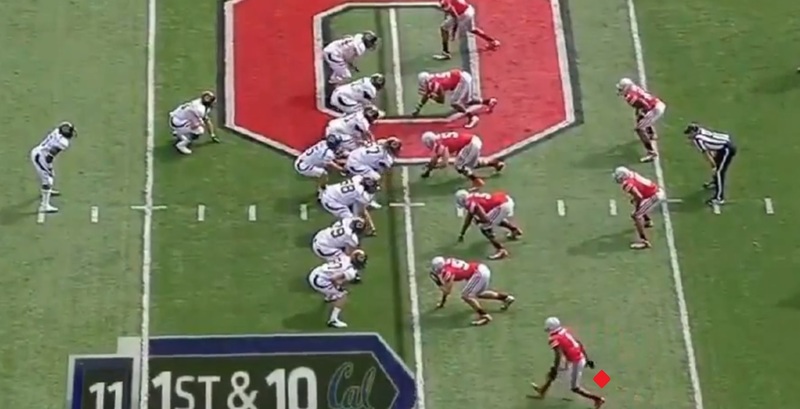 As Bell breaks for the edge you can see at the top of the frame that Roby has managed to turn his man, putting his body in between Bell and the field in front of him. Roby has now managed to fight off the Receiver, and completely shed his blocker. 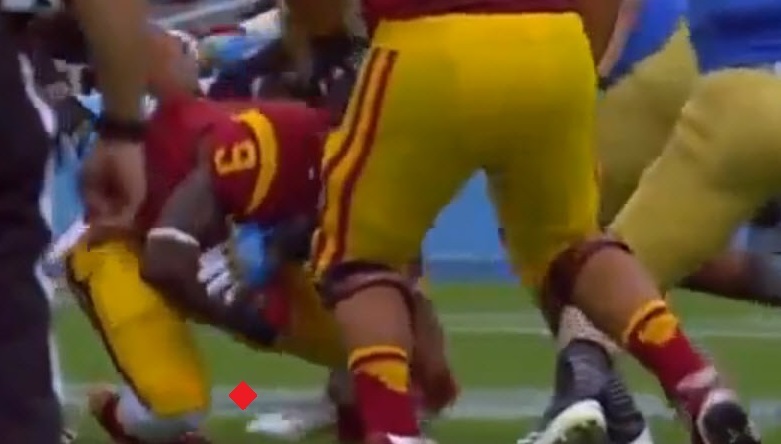 He now is able to square his hips to Bell, and put himself in better position to make the play. Bell who is known for his power, and toughness would be very difficult to bring down if Roby tried to wrap up high on him. 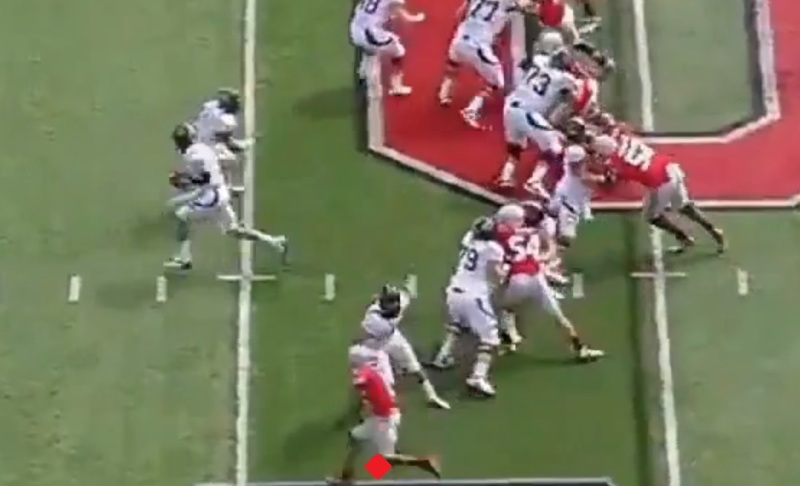 Instead, Roby goes low, and takes the backs legs out from under him stopping the play for a short gain. 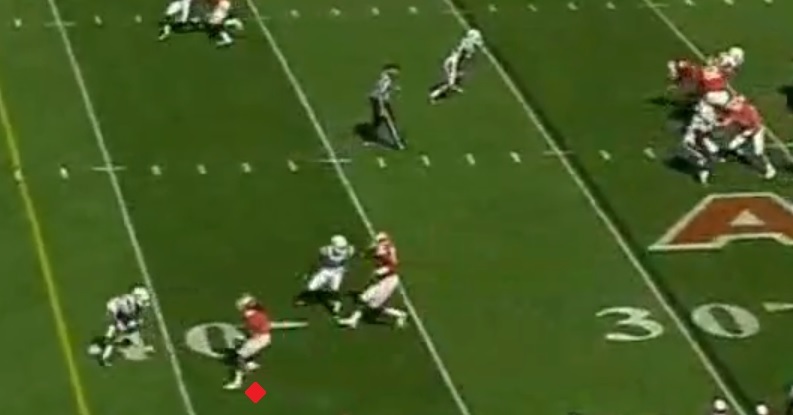 In this last play, Roby shows the ability to close on a Receiver in space, and bring him down on initial contact. 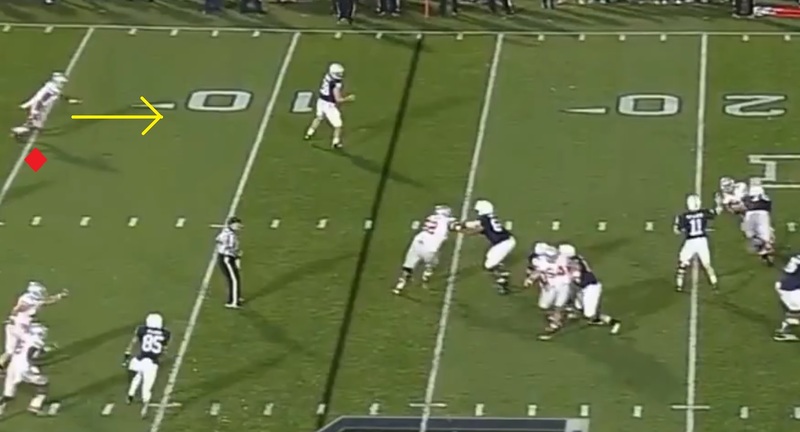 As the play develops the Penn State Quarterback finds no Receivers open. As he feels pressure starting to get near him, he locks in on his check down, the Tight End underneath. 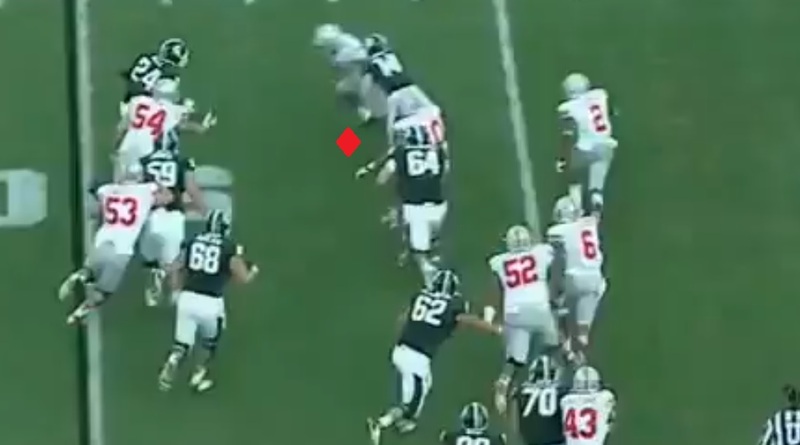 By the time Quarterback Matt McGloin is finishing his throwing motion and releasing the ball Roby has already changed direction and is closing in on the intended receiver. As the ball reaches the Tight End, Roby has easily closed the gap between him and the Receiver and is now in position to make a play. Roby actually does a poor job of wrapping up compared to most of his tackles, but is able to show great strength to bring down the bigger Tight End despite poor form. The play was a critical stop in the third quarter of a game that Ohio State was leading by just a touchdown at the time. 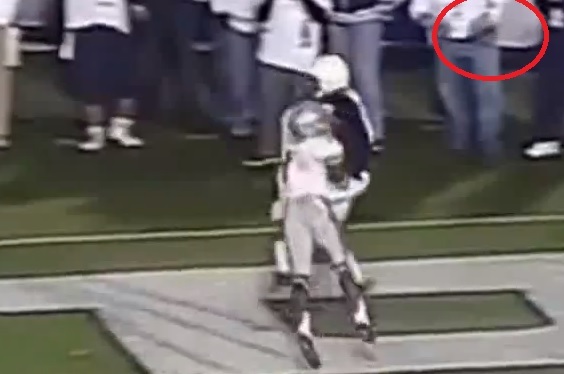 Instead of the drive extending and possibly resulting in a Penn State touchdown, Roby forces the Nittany Lions to settle for a Field Goal. One of Roby’s greatest tools on the field is his tremendous range due to elite long speed, and good athleticism. Roby has sub 4.4 speed that allows him to recover when beaten, and close on ball carriers. Because of his recovery speed he’s hardly ever actually out of a play. Even when the Wide Receiver gets by him he can close while the ball is in the air. His speed also makes him a threat as a blitzer from the edge. On this play against Miami of Ohio Roby demonstrates his elite speed to chase down a receiver who it appeared would walk into the endzone. 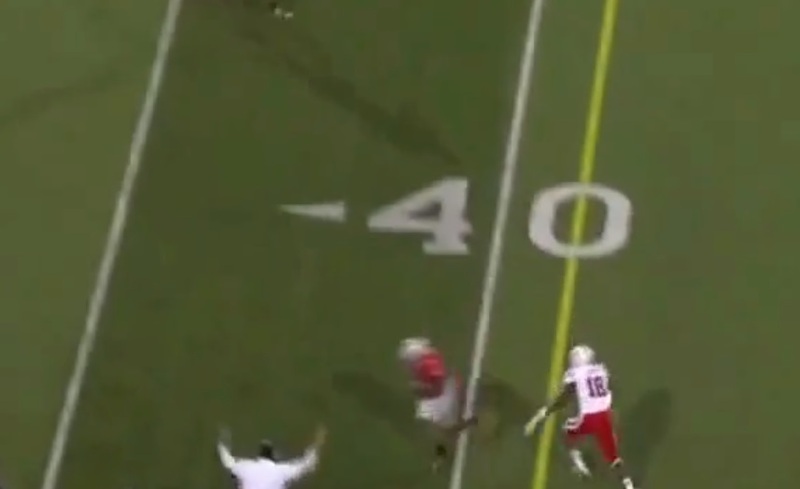 The Miami of Ohio Quarterback finds the Receiver in the middle of the field on the post route, and delivers a beautiful ball hitting him in stride. 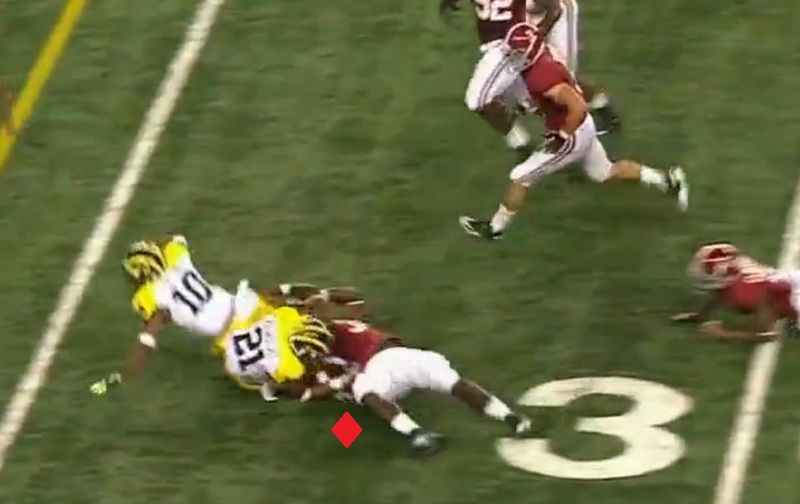 The Receiver is able to run past a diving tackler, and at this point Roby is barely visible in the frame (marked by the red diamond). 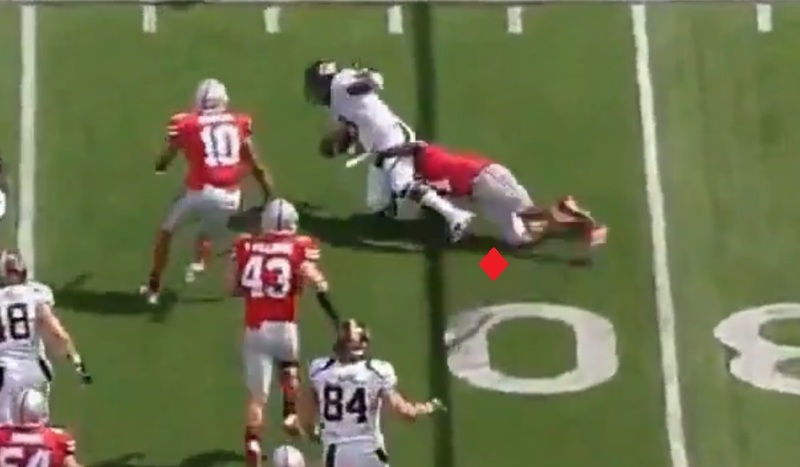 At this point Roby actually has good positioning to make a potential play, but he will end up taking a somewhat poor angle to the Miami of Ohio player. The angle results in Roby actually ending up slightly behind the receiver instead of on his hip ready to make the tackle. Despite the poor angle Roby is able to use his great long range speed to run down the Receiver and tackle him inside the 10 yard line. Even against inferior competition this is a huge play in the first quarter of a scoreless game. On this next play, we’ll look at how Roby’s speed is useful when utilized as an edge blitzer. As the ball is about to be snapped Roby has already timed the blitz perfectly and already has his momentum moving forward as he moves towards the line of scrimmage. As the ball is snapped Roby has already gotten almost level with his teammates along the front line, and has already exploded to the edge. Roby shows good awareness taking a wide enough path to the Quarterback that the Tight End sliding to block him cannot engage. 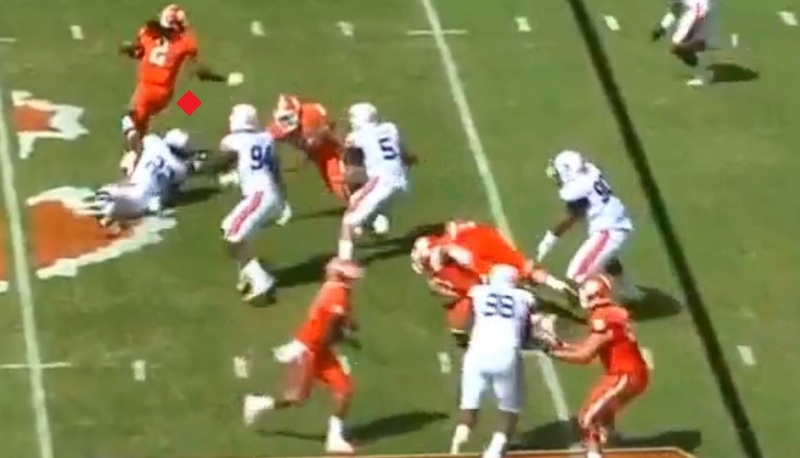 Roby is able to use his great speed and explosion to run around the Tight End unblocked. He finishes the play by punishing the Quarterback on a blindside hit. Roby has incredible physical tools, but none of that matters if you can’t actually cover your man. Unfortunately for the opposition Roby is excellent in coverage. 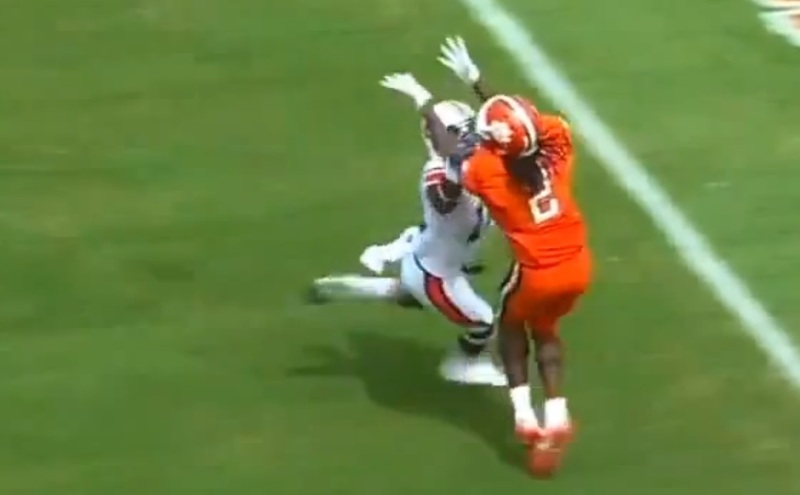 His interception numbers may not jump out at you, and I would honestly like to see him finish a few more plays with ball hawking, but Roby’s ability to get to passes and disrupt at the catch point is one of the tops in the nation. Not just that, but with his burst he can break on a ball and make a play in almost any situation. 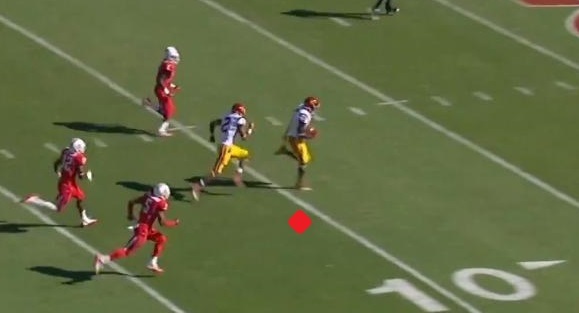 On this play, Bryce Treggs runs a post route and appears open for a First down. However Roby will show great reaction to make a diving deflection. 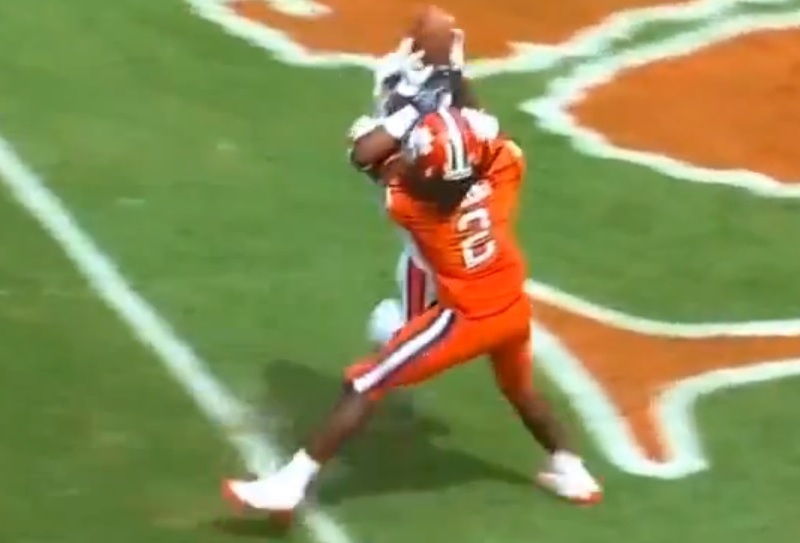 As Treggs goes to make the catch, Roby is able to extend and get his hand in the catch window to disrupt the Freshman Wide Receiver. 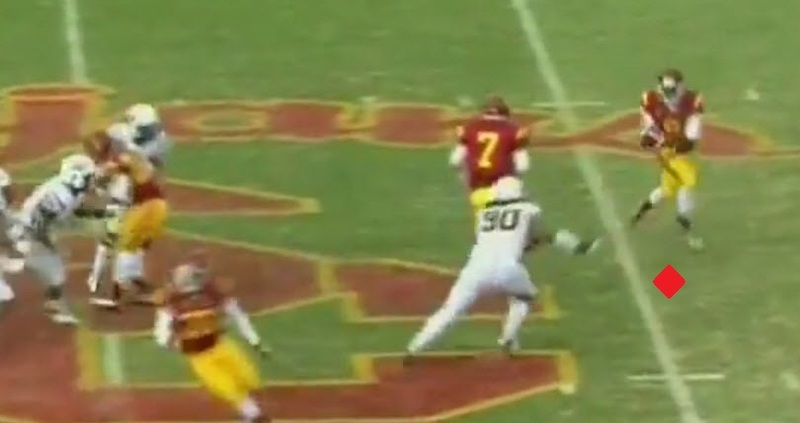 Roby finishes the play, knocking the ball out of the reach of Treggs. 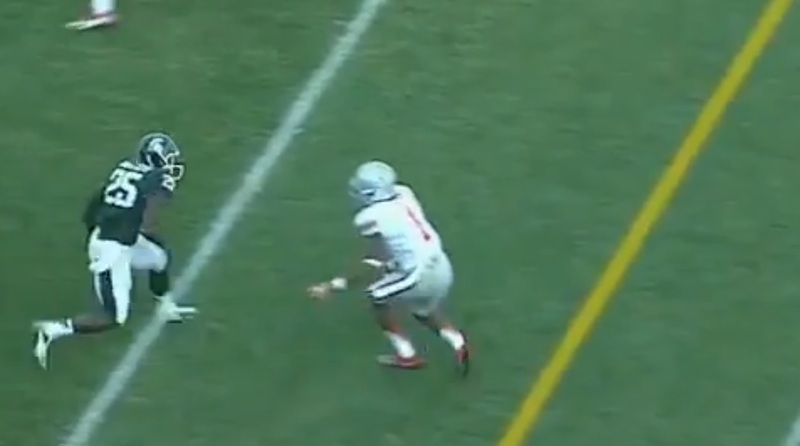 Here, we see the Michigan State Receiver run a nice comeback route. At this point in the play the ball has just been released, and the WR has created separation between himself and Roby. With the ball in flight, Roby is able to use his great closing speed to reduce the separation, and put himself in position to make the play. 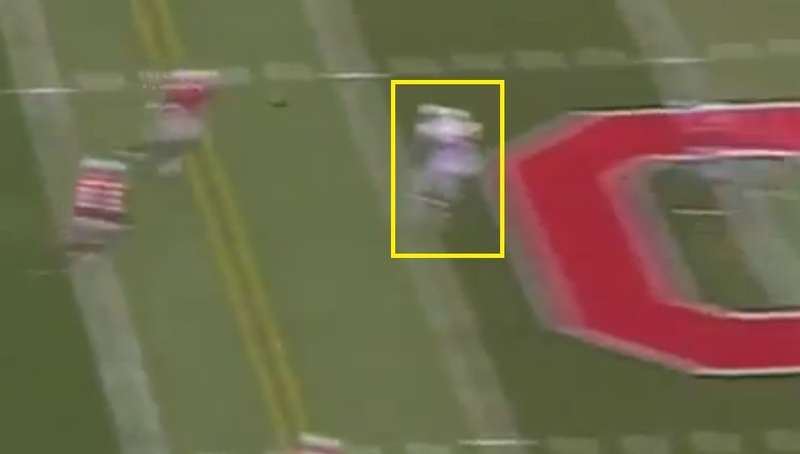 Roby shows good coverage awareness to extend his arm into the Receivers catch window and deflect the pass. 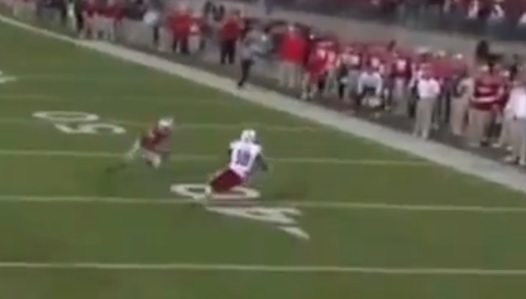 On this play early in the game against Nebraska, Roby shows good ability to transition from his back pedal in order to stay with the Receiver when he makes his cut. 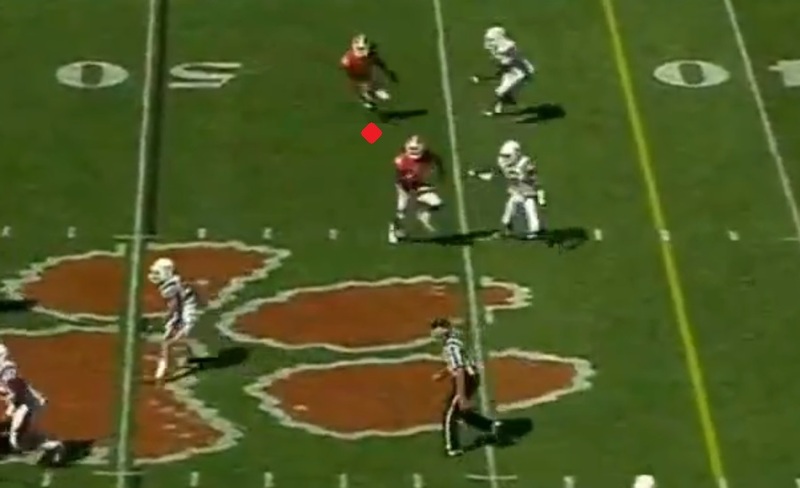 As the ball (marked by the red circle) arrives to the players Roby is able to break on the ball, and establish position to make a play. Roby shows good hands to finish the play with an interception, and will win the footrace to the end zone. While every single player in my Best of the Best series has traits to their game that in my opinion make them stand out, they all have things they need to improve too. So let’s look at a couple of areas where I would like to see Sutton improve in 2013. 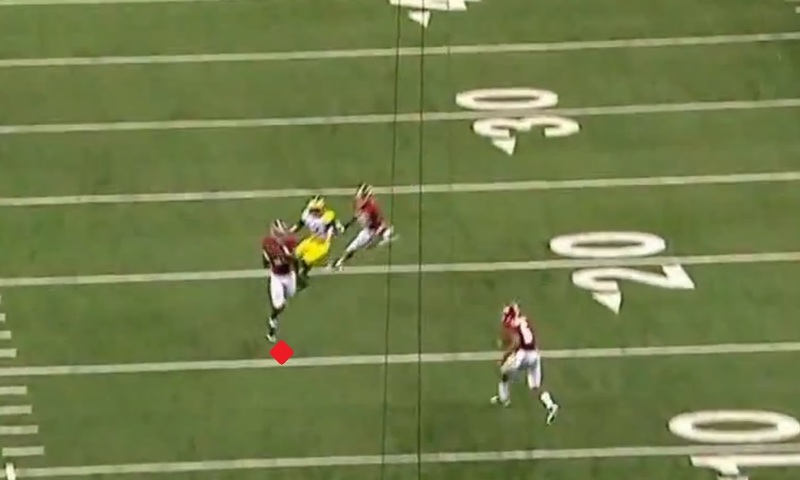 One of the areas of concerns in Roby’s game is that he has a tendency to grab in coverage. He’s an aggressive player who reacts to his matchups movements, and it can result in him being put out of position. When he feels like he’s beat, he routinely grabs down field. 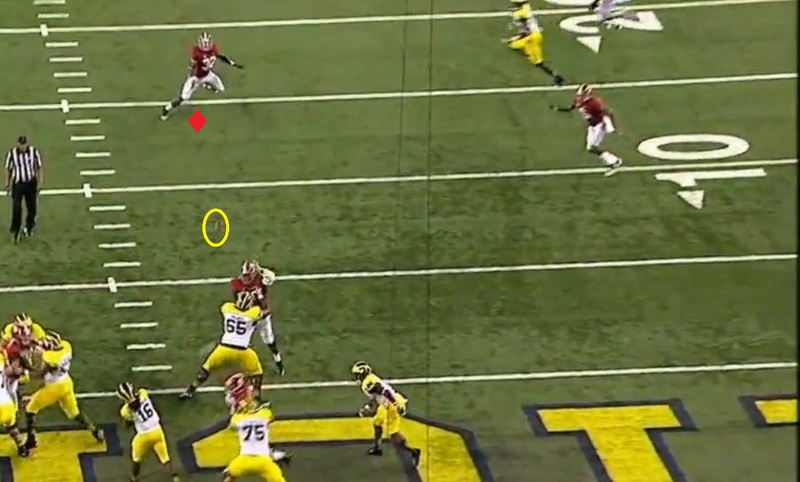 On this play Roby will read the Receiver and see that he’s going to break to the outside, and down field. 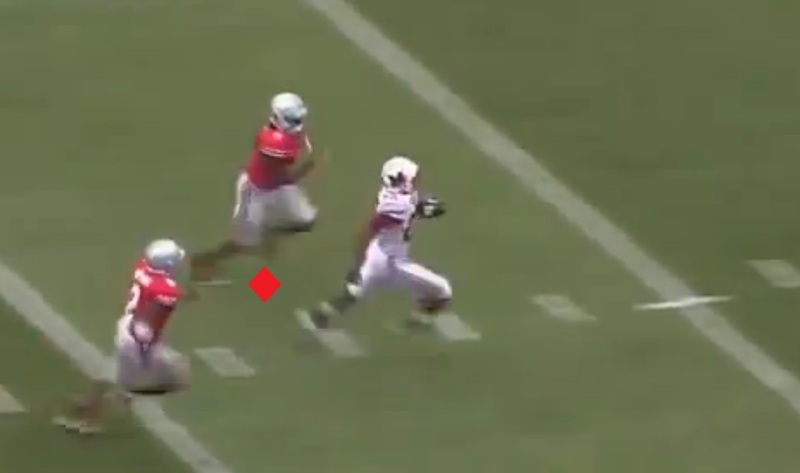 However Roby is off balance, and doesn’t show the best ability to flip his hips and turn to run with a receiver. 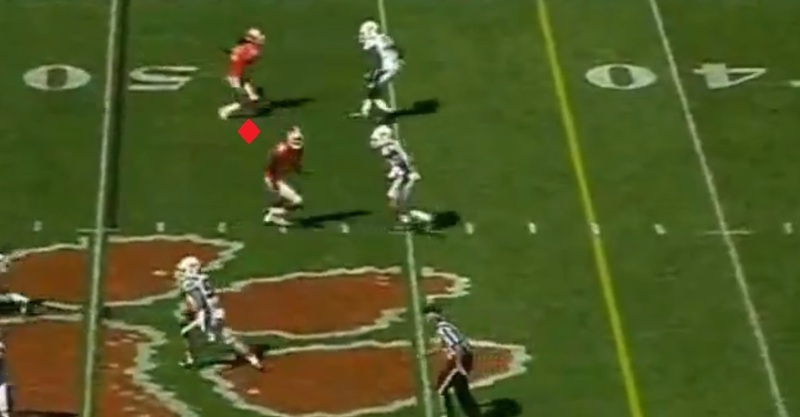 Instead, Roby locks up his receiver impeding him in his route, and drawing the defensive penalty. In this instance the play probably prevents a huge gain so it can be overlooked, however Roby can’t make a habit of this as he transitions to the next level. Which he does. Again, we’ll see Roby grab down field to prevent a big play, except this time he’s in much better position. Roby is in a great spot here, he’s got the sideline as a friend on the left, and if the Receiver cuts back inside he’s in better position to transition, and has a helper a few yards away. Just like the play before though, Roby locks up his receiver and is called for the foul. 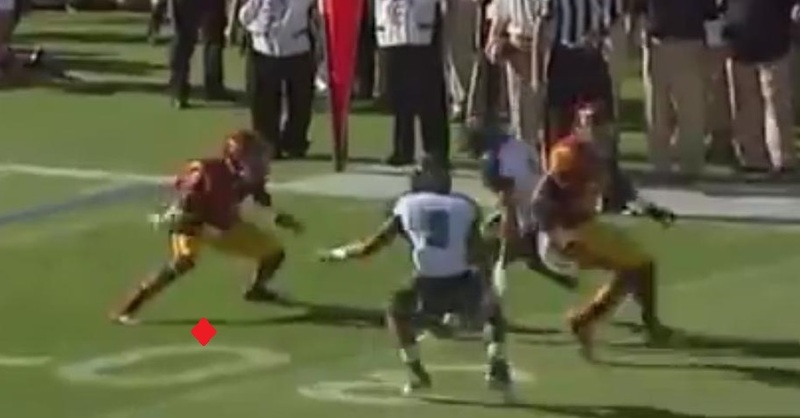 This play is much more concerning to me, because it’s very unlikely that the Receiver is able to get by him. As I’ve already touched on briefly above, Roby isn’t the best when it comes to flipping the hips. This not only leads to situations where Roby feels like he needs to grab, but also situations where Receivers can create too much separation because he’s not able to transition and react to the Receiver’s breaks quick enough. Roby will need to make some improvements in this if he’s going to be an elite cover Corner in the NFL. Roby is a supremely talented athlete, who is by far the best Corner in the NCAA. He uses great physical gifts to win matchups, and possesses a unique ability to make plays without finding the ball. At times it seems like he’s got eyes in the back of his head, as he plays his man and goes up to knock the football away with his back turned to the ball. Roby is a willing, and very good tackler. He’s scrappy, and unafraid to stick his head in and knock Running Backs around. I was having a back and forth with Eric Stoner from Draft Mecca on twitter about Roby, and I would like to borrow his words that he used to describe Roby in run support. He called Roby a “Pit Bull”, and for me the comparison is perfect. He’s tough, scrappy and aggressive, and while he may not be the biggest guy he’s tough to break free of when he wraps up. 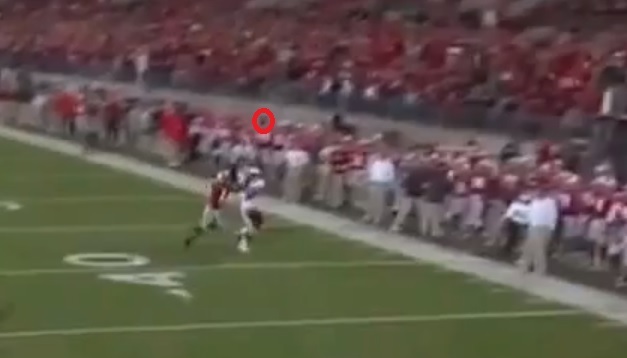 Roby also shows great coverage ability to react to the pass and get in position to knock it down. He’s got a good ability to get to the catch point and disrupt the Receiver, and his physicality makes every catch a chore for the opposition. He also is a guy who makes plays on Special Teams, with several punt blocks in his career. I would like to see him be a little less aggressive down the field in regards to initiating contact during the Receivers route. Roby had shown that he’s somewhat susceptible to double moves, and the play fake, which goes back to his aggressiveness in coverage. 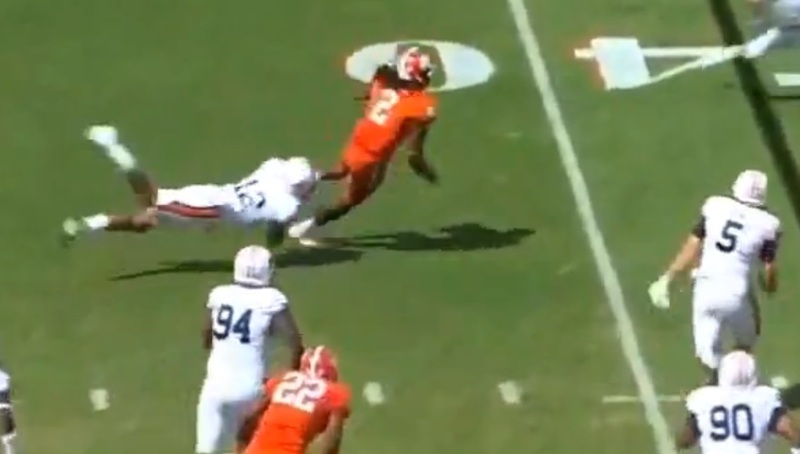 He also needs to transition better, and develop better “flip the hips” ability, but at this point in time it’s hard not to be extremely impressed with Roby when you watch him. One thing to watch, is Roby has some off the field concerns. In my opinion they aren’t serious enough for any team to remove him from their board, however it’s something to monitor going forward. We’re now seven days away from the beginning of the 2013 college football season, which means it’s time for part four of my Best of the Best series. This 10 article series will take a look at my top 10 draft eligible players in college football. For my rankings, I factored my Draft stock for each player, as well as their impact in the college game. While I fully expect all of these players to be top 15 draft selections next year, there could always be fluctuation with a premium placed on positions like Quarterback and Offensive Tackle. With that said, it’s time to look at my number seven prospect, Alabama Linebacker C.J. Mosley. One of the more interesting things to watch for me this season will be the progression of C.J. Mosley from Alabama. Mosley is an intriguing guy. He’s primarily taken a backseat to other Crimson Tide backers, however when he’s on the field he flashes a ton of ability. You can instantly see traits that make him a special player at the college level. He can cover, he can run sideline to sideline, he can tackle, he really is a well-rounded player. So lets look at what makes him one of the Best of the Best. When first watching Mosley, his play in coverage situations instantly jumped out to me. He reads the Quarterback well, has smooth hip transitions, looks fluid in his drop back, and has good ball skills to finish plays with interceptions. 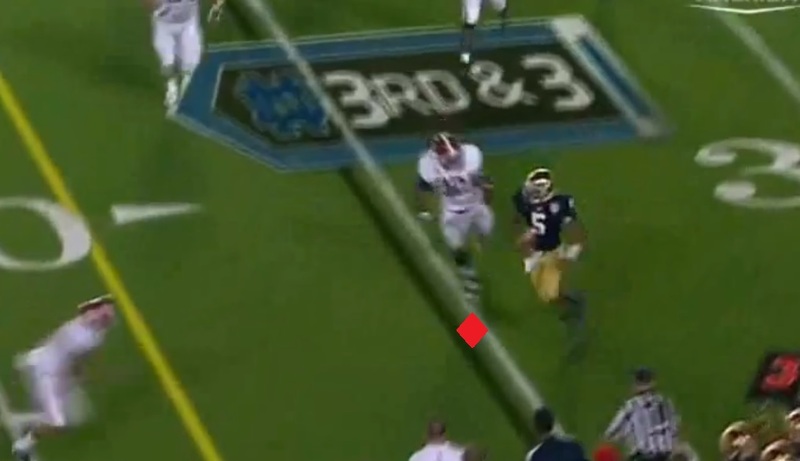 In this first play against Notre Dame in the National Championship, Mosley shows off tremendous ability to not only pick up the Receiver (yellow square) coming across the field on the shallow crossing route, but also shows the ability to jam and reroute him to take him out of the play. As the Receiver slips off the line Mosley kicks out to meet him in his route, the receiver tries to shake him with a quick studder, but Mosley is able to stay right with his man displaying some quick footwork of his own. 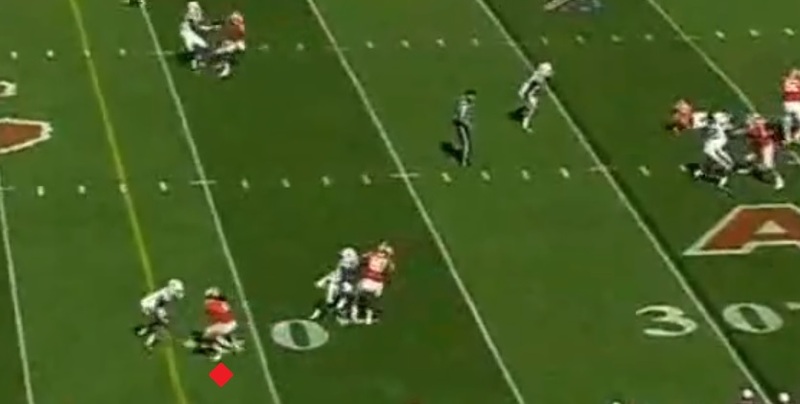 Mosley then is able to initiate contact and jams the Receiver. He’s able to knock him off his route, and he continues contact through the play. At this point Mosley has thrown the Receiver completely off his route, and is also showing good athleticism to stay with him in coverage. 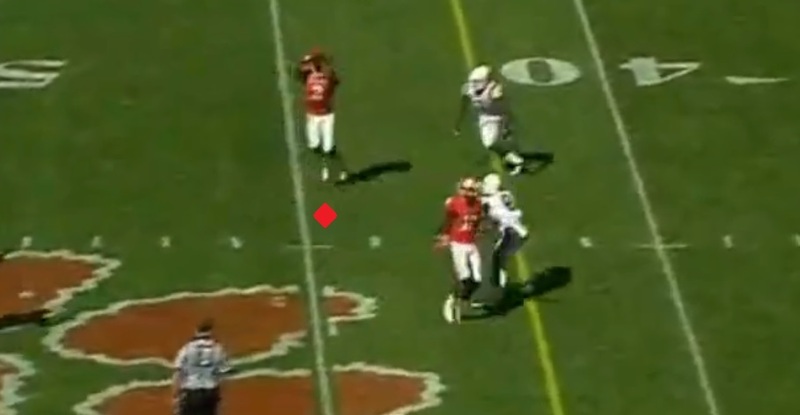 Mosley has effectively eliminated the Receiver from being an option on the play. Due to his reroute and tight coverage, if the Quarterback throws him the ball it will likely be deflected, or the Receiver will be tackled for no gain. 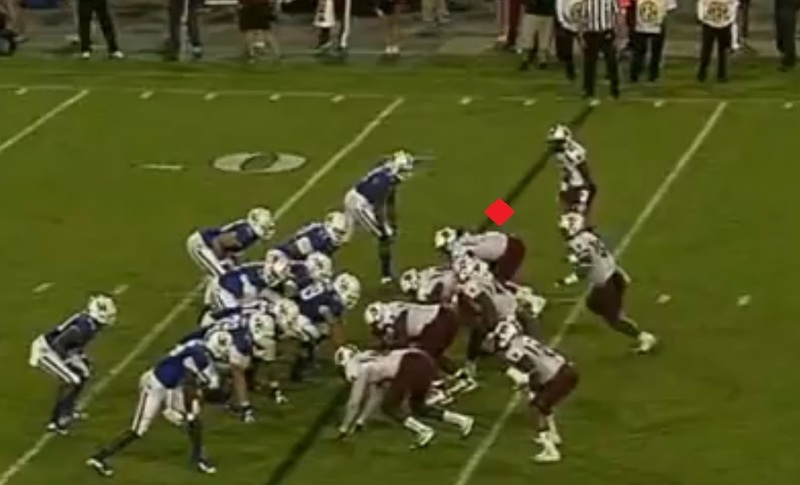 On this play against Michigan Mosley demonstrates good ability to read the Quarterback and put himself in position to make the play. As the QB snaps the ball notice Mosley has already started his back pedal, and has his eyes on the QB while getting into his coverage responsibilities. As the QB goes through his progressions Mosley continues to watch him in order to be able to determine where the ball is going. Mosley reads the QB and determines where the ball is going by this point, and has already made his adjustment to break on the ball. 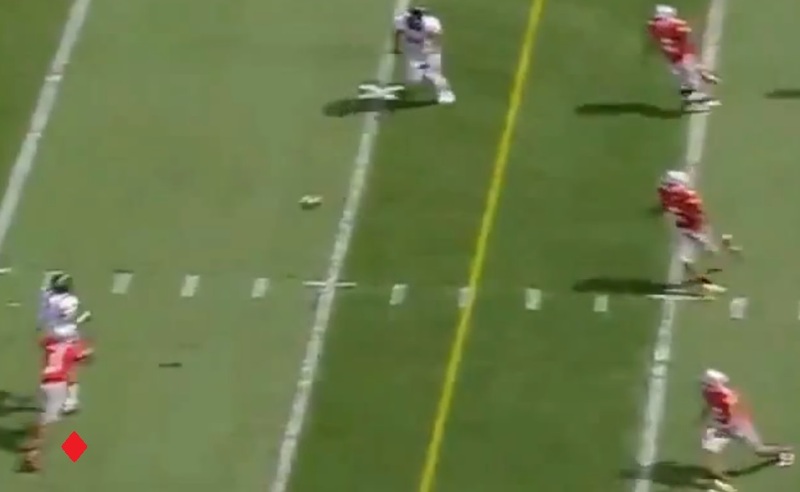 As the ball is released to the Wide Receiver appearing to come open, Mosley has made the correct read, and already jumped underneath the post route. By the time the ball actually arrives, Mosley is in position to make the easy interception which he runs back for a score. 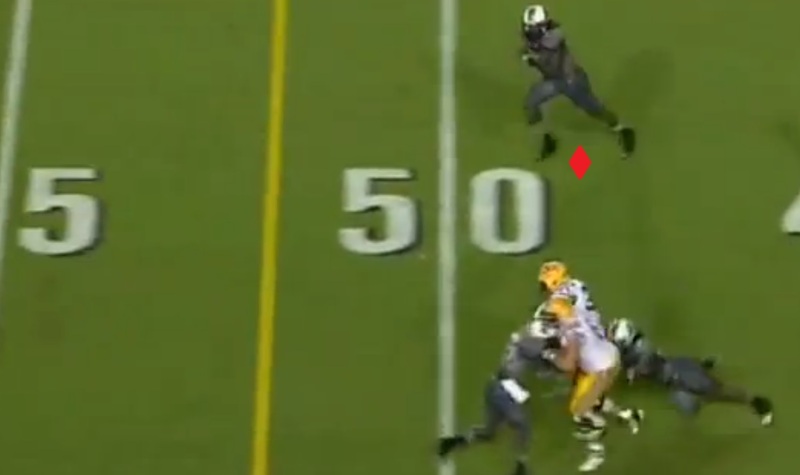 Mosley makes the read almost instantly, and moves laterally to where the Quarterback’s eyes are on the field. The intended Receiver is the Running Back coming out of the backfield, but he goes the wrong direction on the timing route. Once again, Mosley has put himself in position to at least attempt to make a play on the ball by the time the QB is releasing it. 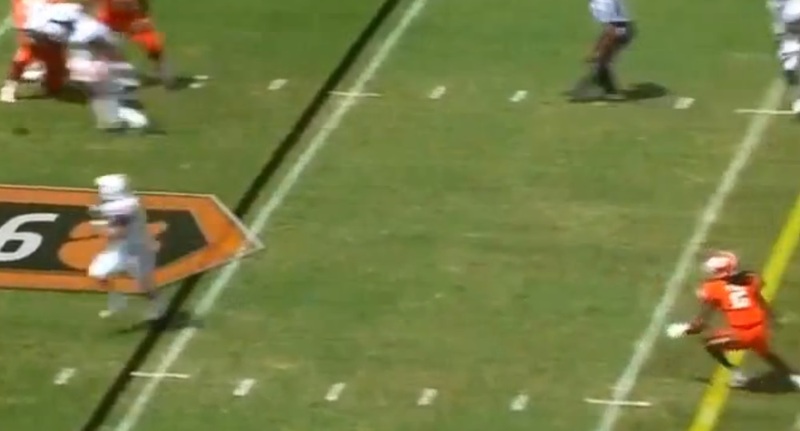 It’s a terrible mistake by the RB Lane, but that doesn’t make Mosley’s play any less impressive. The Linebackers shows great reaction ability to dive and secure the football before hitting the turf. At the time of the interception Alabama only had a four point lead, and Mosley’s play put them in prime scoring position again. A lot of times you find guys who are good at coverage but shaky in run support, or vice versa. For Mosley he was supposed to be a strictly coverage linebacker. While he excels in coverage, he is also extremely impressive in run support. He fills gaps well, diagnoses and reacts quickly to most plays, and is a sound tackler. 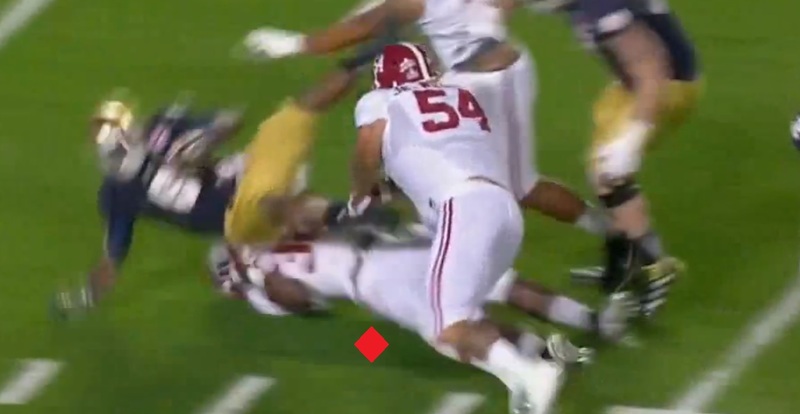 On this play early in the game against Notre Dame, Mosley shows good ability to read the play, then shoot the gap and make an extremely physical tackle. 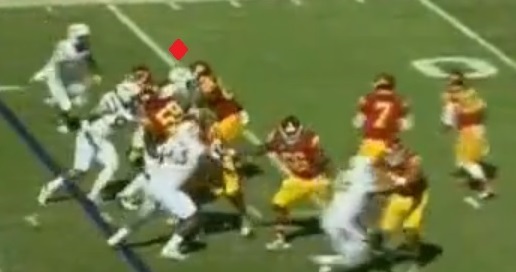 As the play begins Mosley lets his defenders in front of him occupy blockers while he reads up field. The Running Back is held up in the backfield when his blockers are not able to generate a push down field. 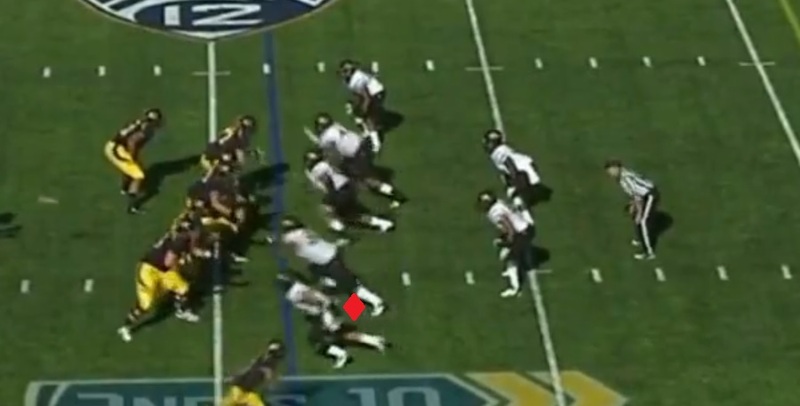 At this point Mosley will diagnose and find a gap and shoot through it. 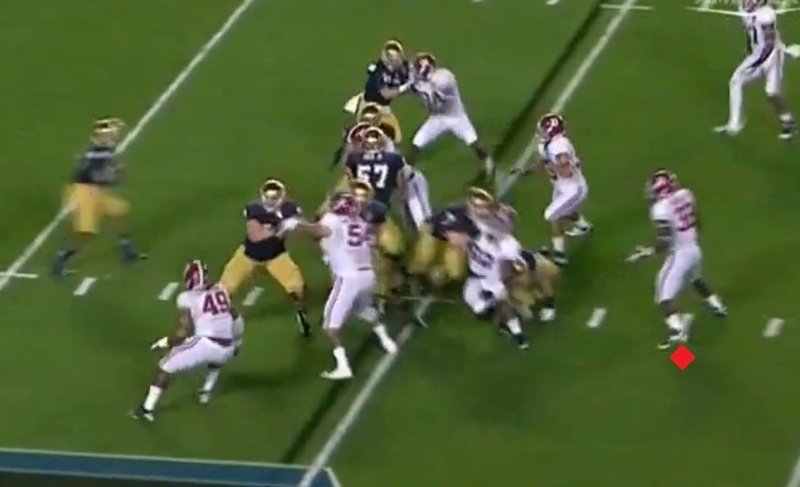 Mosley explodes through the gap and wraps up the ball carrier. 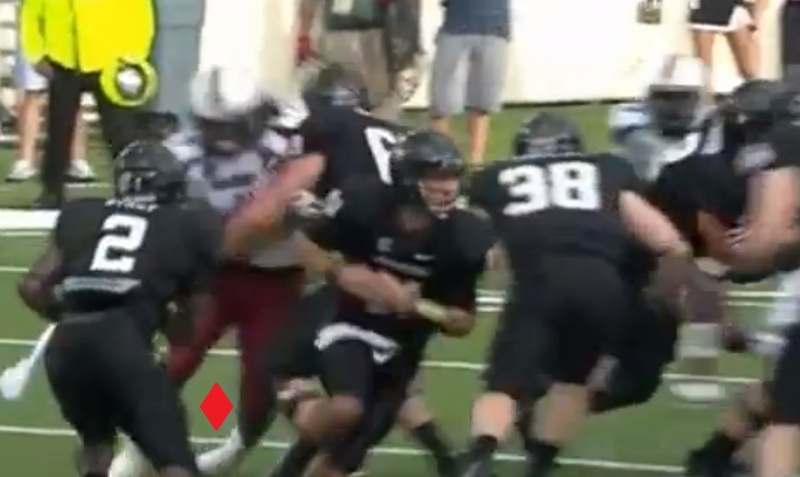 The plays over, but the Backer is about to impose his will. Mosley drives the RB Theo Riddick back a few yards, and then in a move you would be more likely to see in a WWE ring then a football field he violently throws him back and over his shoulders to the turf. This helps set the tone for what will be a physical beat down of the Irish. On this play Mosley again shows how quickly he can burst through a gap and bring down the Running Back. 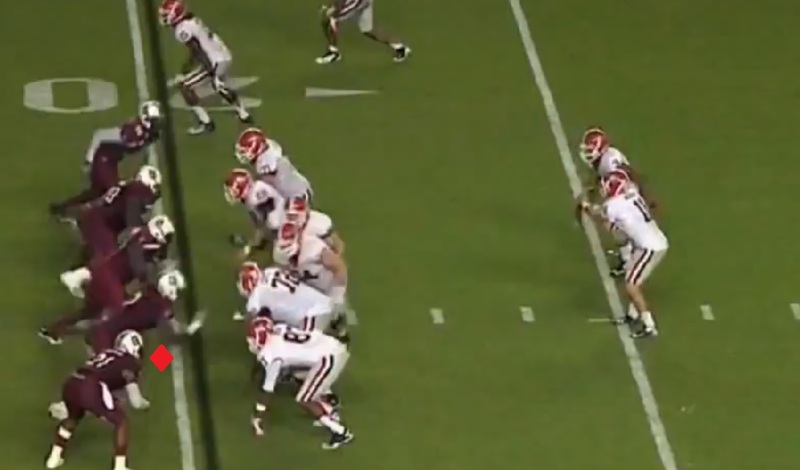 Mosley quickly reads the play and locates the lane for the Running Back. 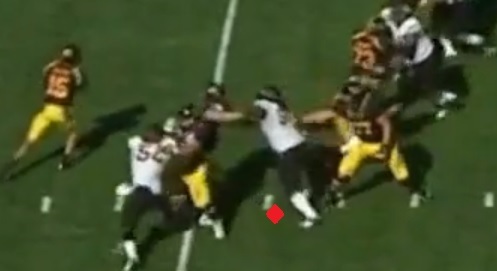 Before Riddick can even cut back Mosley has exploded into the lane and closed it off. Mosley is able to easily bring down Riddick for no gain on the play. 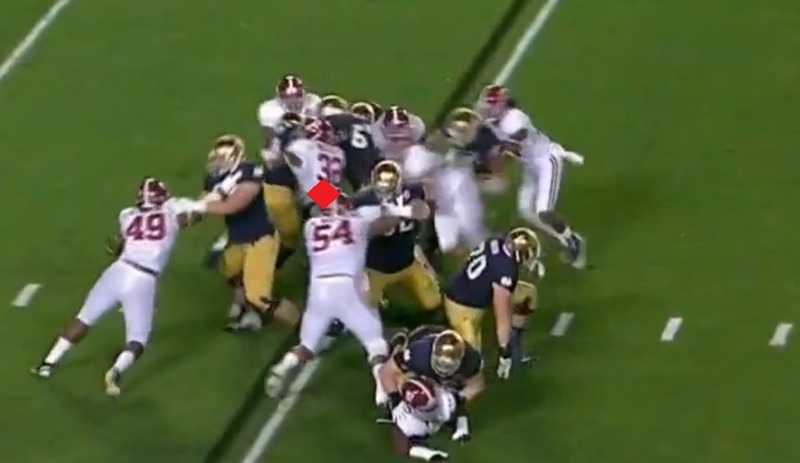 On this last play, Mosley shows the ability to make tackles even partially blocked. 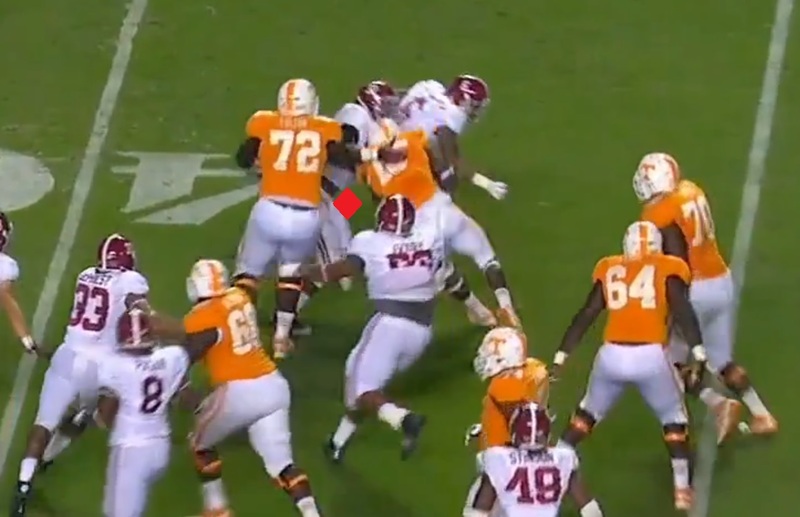 Mosley is being blocked by a much bigger Offensive Lineman, but because of his length is able to keep the lineman off his pads. 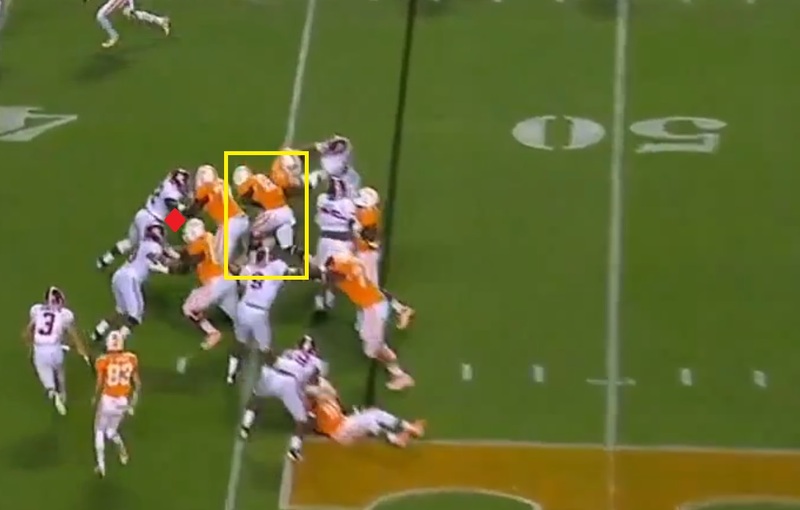 As the RB plows through the hole Mosley is occupied by the much bigger Offensive Guard. However, Mosley will be able to free one of his arms and that’s all he needs. Mosley is able to stick his free arm out and shows great strength to be able to stop and eventually drag down the RB while partially blocked. One of the biggest misconceptions about Mosley in my opinion is that he’s not an exceptional athlete. I disagree with this, because he’s able to play sideline to sideline and is great in pursuit. While he may not be the fastest guy in a straight line, or the highest jumper, his ability to track and tackle ball carriers all across the field shows me a great level of athleticism. On this play Mosley somewhat bites on the play fake and begins moving with the Running Back. However he will show he quickly is able to recover. 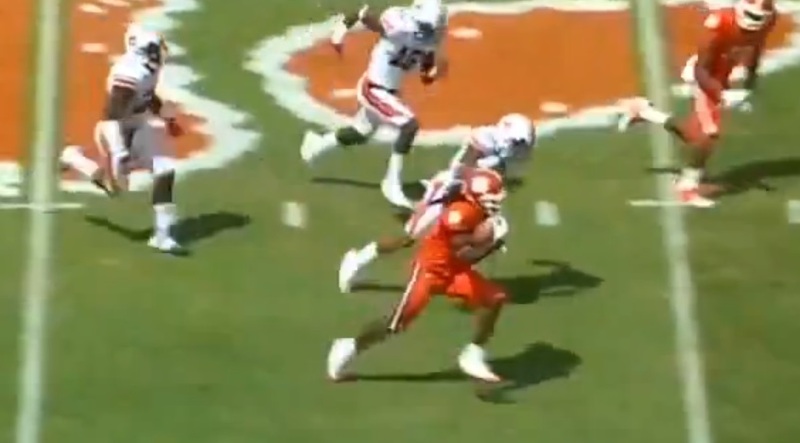 By the time the Quarterback is in his pump back to release the ball Mosley has already recovered and has his momentum moving in the right direction. 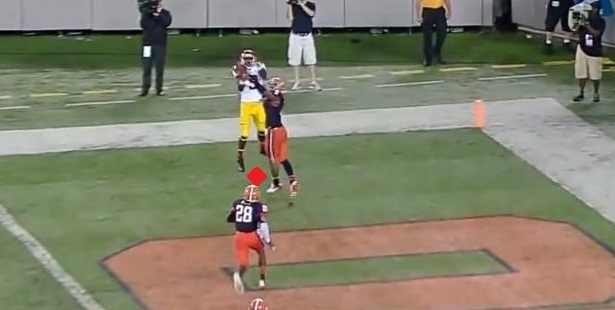 As the Receiver makes the catch Mosley is nowhere on the screen. The Receiver looks to have a blocker in front of him, and this could be a big play. 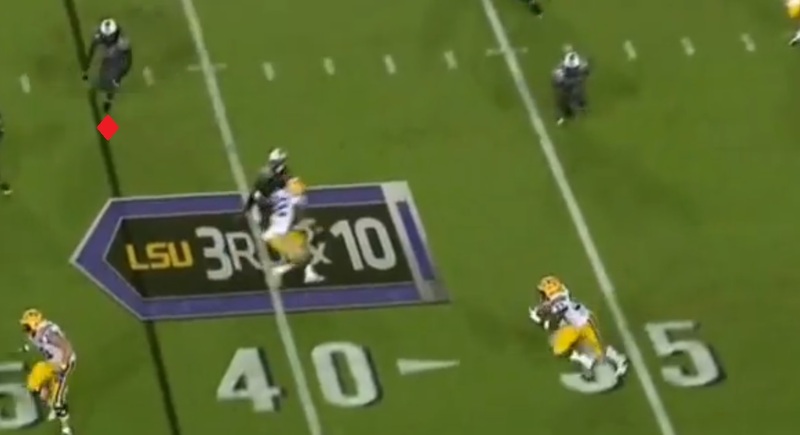 Before he can get too much further down field though Mosley comes flying in and makes the tackle. What looked like a significant gain isn’t even a first down because of his play sideline to sideline. 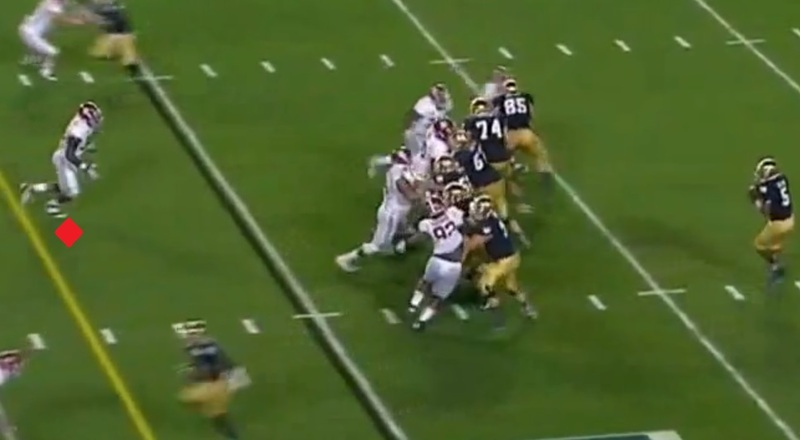 On this play Mosley is spying the QB, and will make a tremendous play to force the Irish to punt. 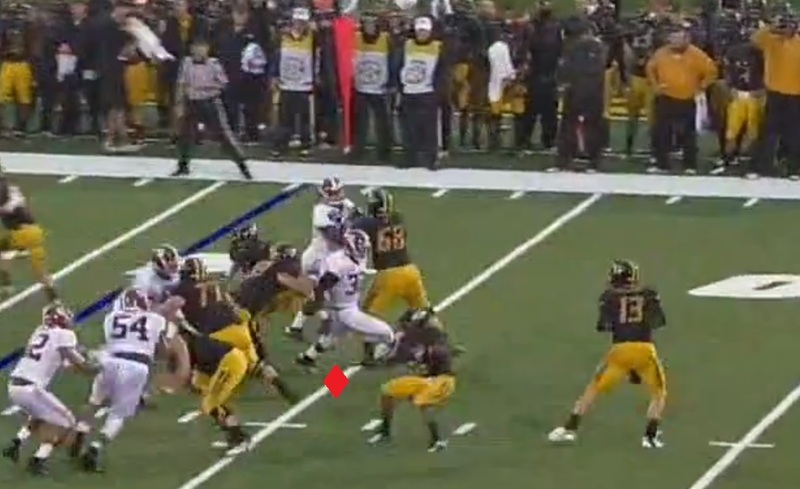 Mosley quickly reads the field, and finds the huge running lane the Quarterback has been provided on third and short. He instinctively shoots across the field to fill the QB’s escape route. 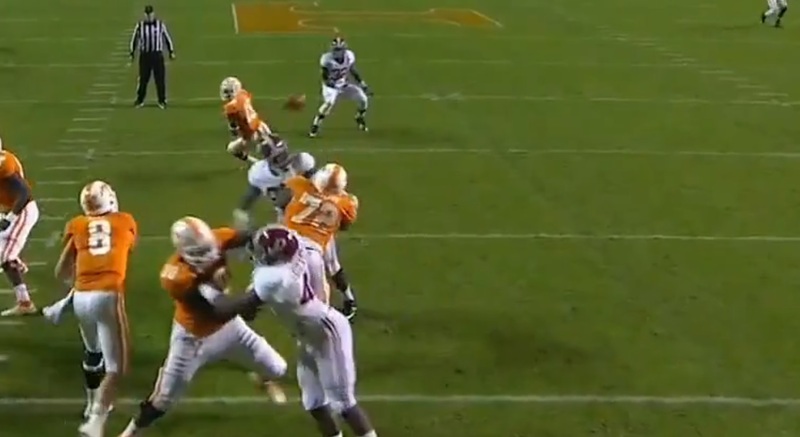 Mosley has the angle on the play, but it’s still going to be a footrace against a very athletic QB. The Backer is able to get over to the QB in order to close off the inside cutback, and force him to the sideline where help is waiting in the form of a Tide teammate. 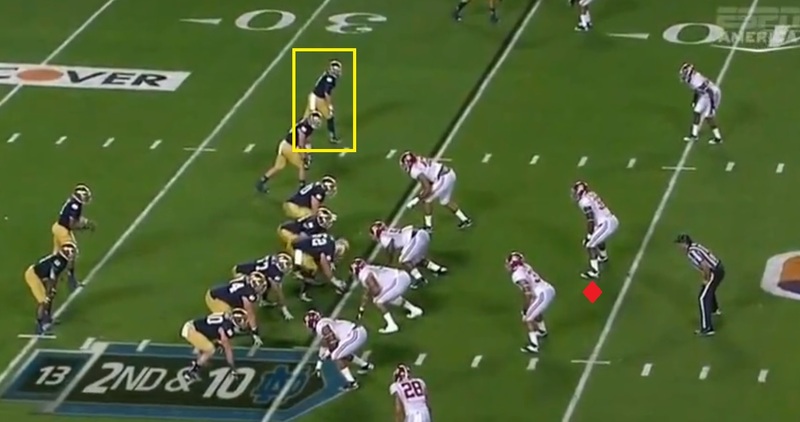 The two of them force the QB out-of-bounds, and force the Irish to give the ball back to the Tide offense. Not only is Mosley skilled in coverage and able to make plays in the run game, but he’s also a very effective blitzer. The Linebacker times his blitzes well, anticipating the snap and exploding off the line. He gets into the backfield easily at times, and shows great closing burst and pursuit ability to run down players in the backfield. Mosley times the snap excellently on this play, and gets great explosion off the line. 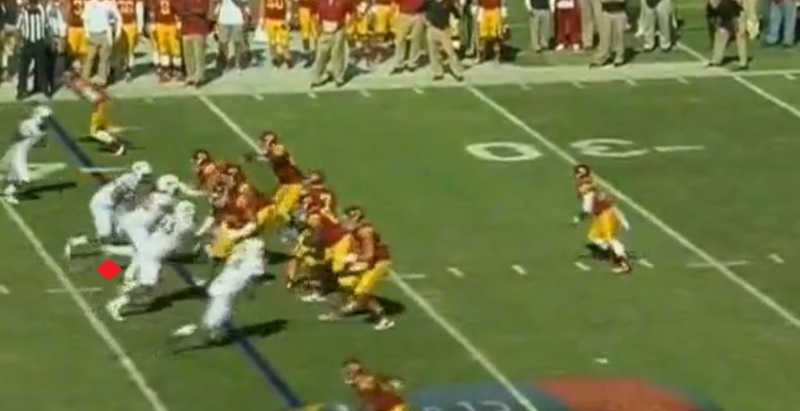 Notice how much further up field he is then any other white shirt. The Center is able to make contact with Mosley, but his reaction to the snap is so quick that the Center can’t really deal with his rush. 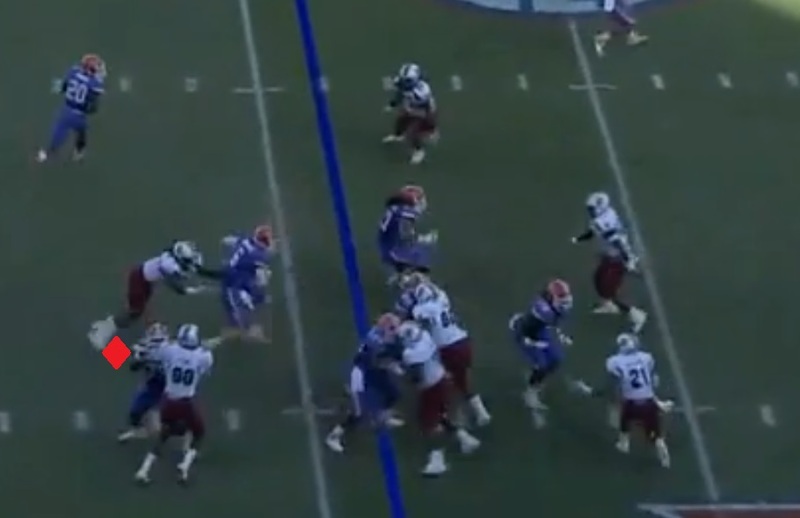 The Center makes an effort to grab him and take the penalty instead of a sack, but Mosley is strong enough to run through the holding attempt with little problem. 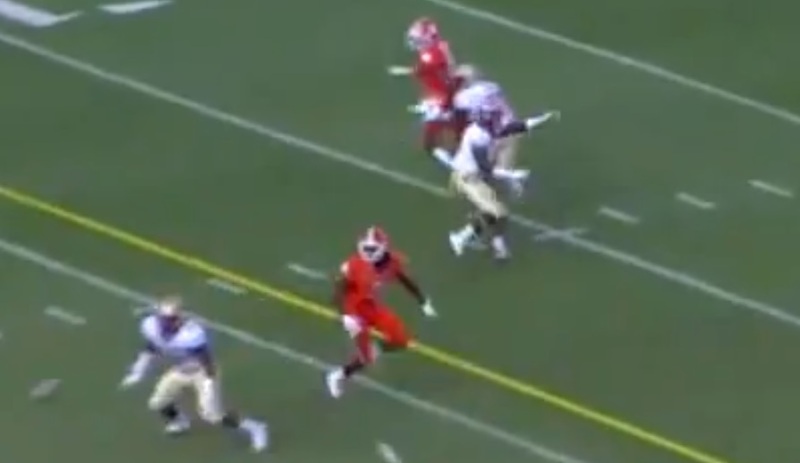 Once Mosley gets into the backfield and gets a free run he’s essentially a run away freight train. 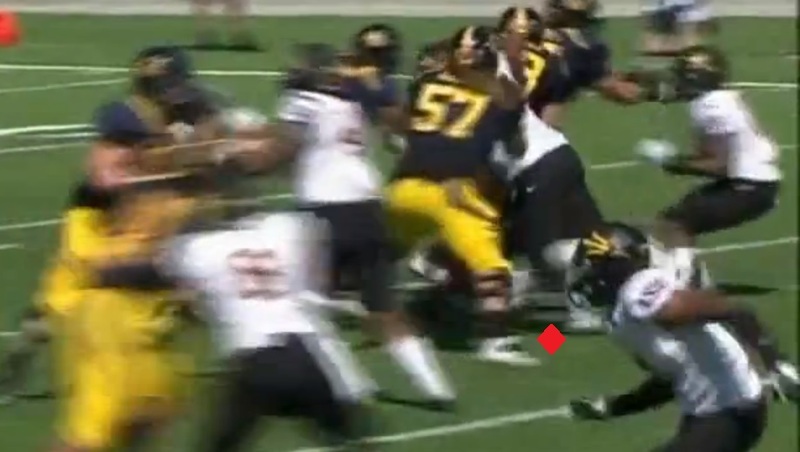 The Quarterback tries to avoid the Linebackers rush, but Mosley is able to easily pursue and sack the Missouri QB. While every single player in my Best of the Best series has traits to their game that in my opinion make them stand out, they all have things they need to improve too. So let’s look at a couple of areas where I would like to see Mosley improve in 2013. This is a bit of nit picking because usually Mosley makes the play anyway, but at times he can be caught taking too many steps on plays. This mostly happens when he’s has his eyes in the backfield diagnosing the play, and in my opinion is a result of just not having enough reps yet. On this play against Missouri we see an example of this. 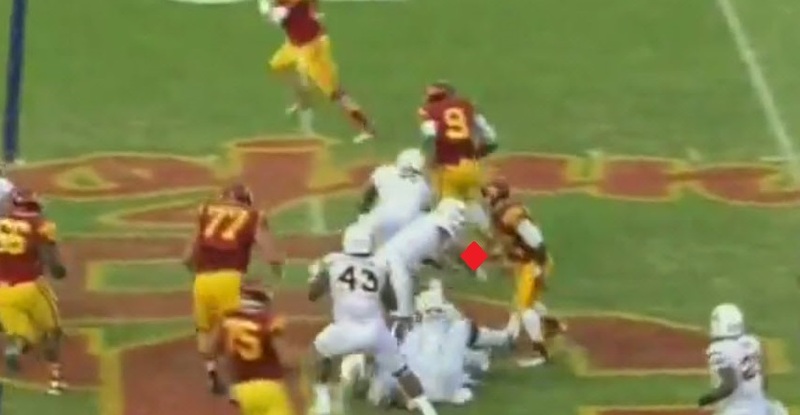 While his teammates are attacking the ball carrier Mosley is still shuffling laterally diagnosing the play. 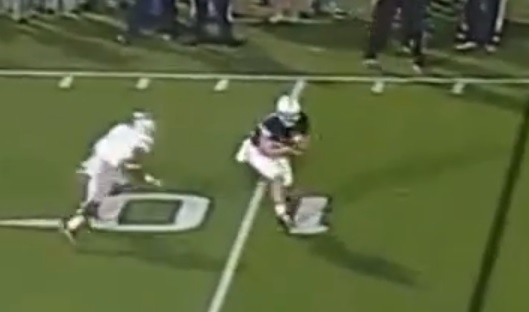 Even as he gets downhill to the ball carrier, he’s still shuffling laterally somewhat. 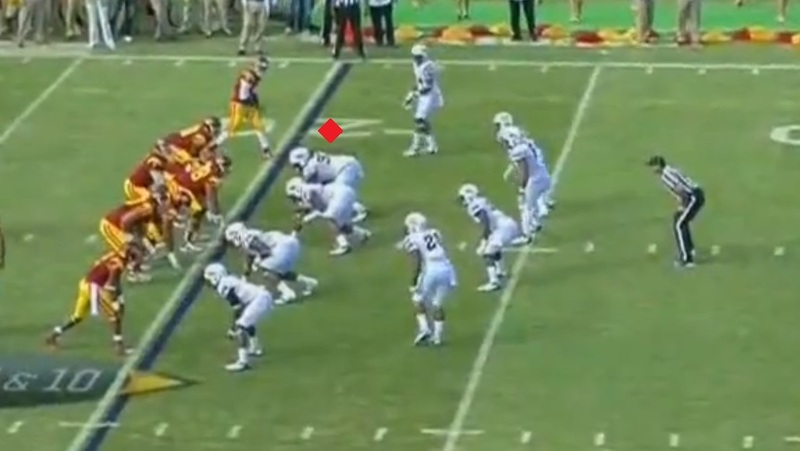 This makes him slow to react to the Running Backs cutback, and creates a big gain for the Back. 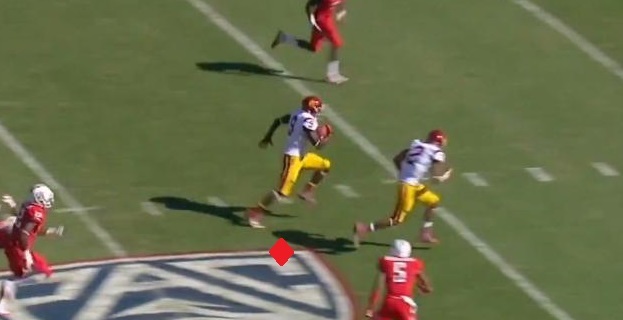 However he does make up for it with tremendous pursuit down field to drive the RB out of bounds. This isn’t so much something Mosley has to improve on, more of something he’s going to have to adjust to. While the Tide Defense has great players along the entire depth chart, Mosley will be seen as the guy. How will he handle the pressure? How will he deal with having offenses scheme around his play making ability? These are two things I will definitely be watching as the 2013 season unfolds. C.J. Mosley is my top ranked Linebacker in the NCAA, and for good reason. He’s skilled at literally every phase of the game. He’s an ace coverage Backer showing the ability to jam Receivers through their routes, and drop back seamlessly into coverage. He also reads the Quarterback better than any LB in the nation, and shows the ball skills to interrupt and pick off passes. He’s also skilled in the run game. Mosley displays great tackling ability, wrapping up and dragging the ball carrier to the ground, and he also at times punishes the opposition with violent tackles that make them think twice before running his way again. He shows ability as a blitzer, getting into the backfield and chasing down the Quarterback for a sack, or forcing him to throw it away. The Backer also has exceptional sideline to sideline ability, pursuing ball carriers, and showing the skill to cut back across the field and make plays with lateral agility. I would like to see him clean up some of his footwork as he can be caught taking too many steps while diagnosing plays at times. This can take him out of position on plays, and create big gain opportunities for the offense. At times he doesn’t react as quickly as you would expect him to after you see his reaction time on the good snaps. This is caused by a lack of reps in my opinion, and will start to go away as the season progresses. I’m also going to be watching Mosley’s transition from a great role player into the focal point and leader of the Defense as that is a position he hasn’t been asked to fill at Alabama before. We’re now nine days away from the beginning of the 2013 college football season, which means it’s time for part two of my Best of the Best series. This 10 article series will take a look at my top 10 draft eligible players in college football. For my rankings, I factored my Draft stock for each player, as well as their impact on the college gridiron. While I fully expect all of these players to be top 15 draft selections next year, there could always be fluctuation with a premium placed on positions like Quarterback and Offensive Tackle. 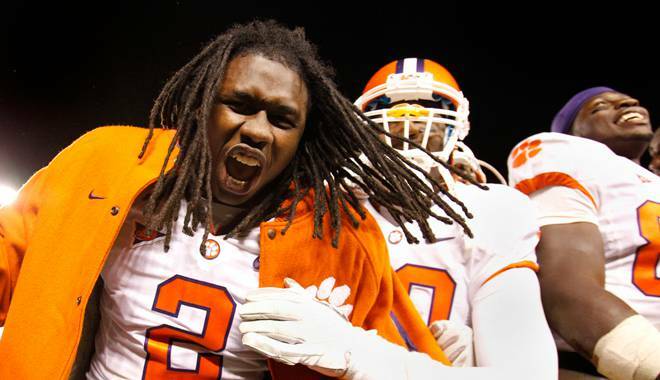 With that said, it’s time to look at my number nine prospect, Clemson Wide Receiver Sammy Watkins. In 2011 Sammy Watkins made his Freshman debut against Troy, and had a more than solid day hauling in seven passes for 81 yards and a touchdown. The Florida athlete used that performance to springboard him into a stellar first season resulting in 82 catches, and all-purpose yardage in excess of 2,200 yards. In 2012 Watkins battled injuries and a stellar year for former teammate and new Houston Texan DeAndre Hopkins, and his yardage took a big step back with only around 1,100 all-purpose yards. Now as 2013 begins Watkins is healthy again and looks ready to prove why he’s one of the elite talents in college football. Watkins is an extremely explosive athlete. As a track star, Watkins shows the top end speed to run away from defenders, and has the shiftiness and quickness you love to see from players at the position. 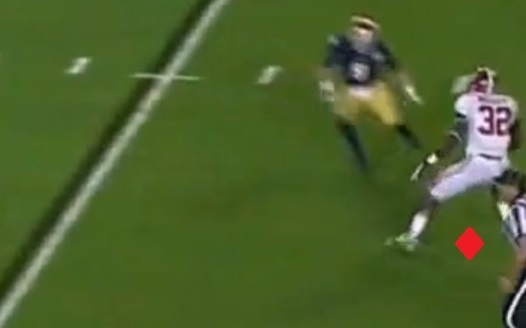 This play is one of Watkins most explosive plays from his Freshman year. It’s third down at the beginning of the third quarter against Auburn. 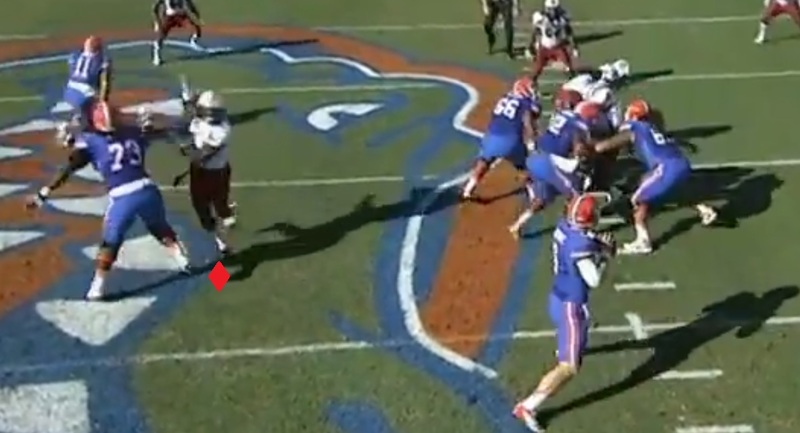 The Corner across from Watkins is lined up 10 yards off of Sammy to prevent the big play. 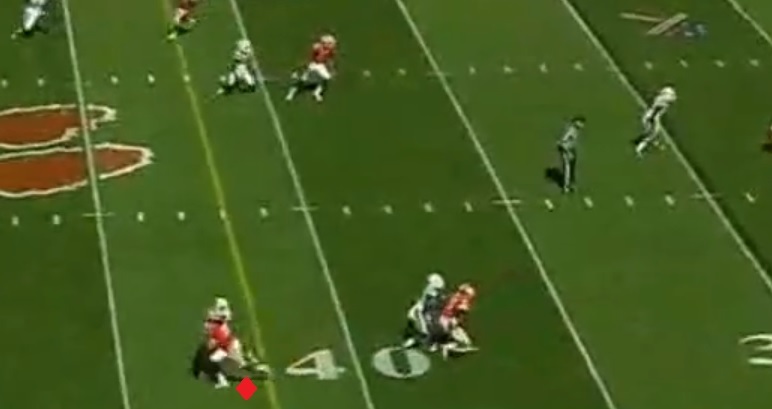 Watkins runs a quick curl route right to the sticks and sits in the open area to pick up the easy first down. 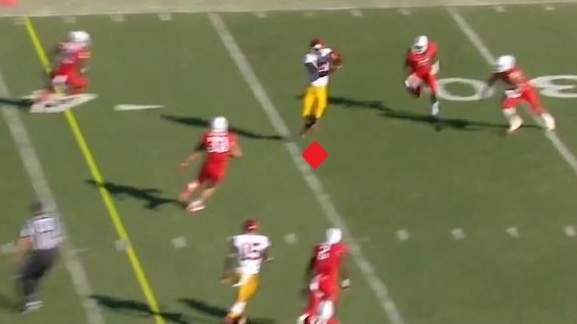 As he makes the catch, Watkins instantly looks to go North and South and pick up as many yards as possible. 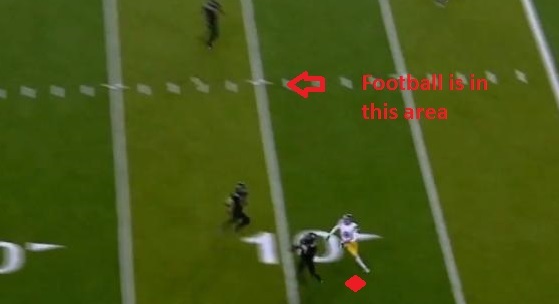 Watkins is able to use the extra gear he possesses to accelerate right past the diving tackler and now has become a thread to take a simple six yard route the distance. Still accelerating after the catch, Watkins runs by another diving Defensive Back. 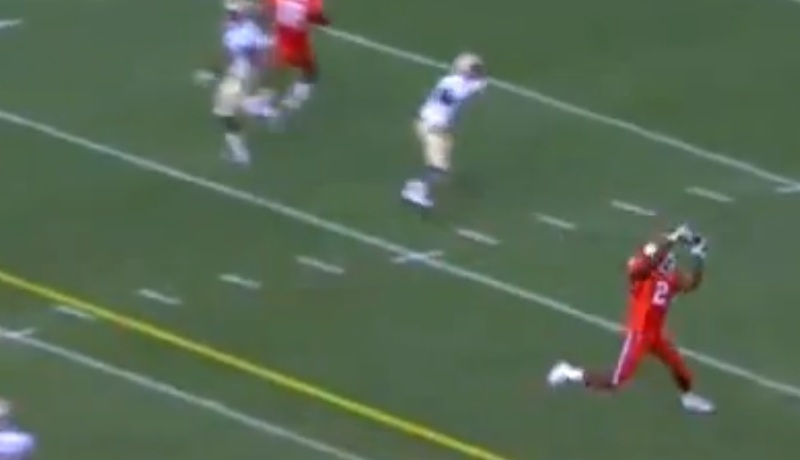 Watkins uses his exceptional explosiveness after the catch to break to the edge. At this point there’s no shot for the defense to make the play, Watkins walks into the end zone. Here, Watkins will take the ball out of the backfield against Furman. Watkins teammates have done a good job providing him with a clean lane to run through by sealing their blocks against the lesser competition. In an instant Watkins has already accelerated through the hole and past any tackler that had a chance to bring him down before the play became a huge gain. 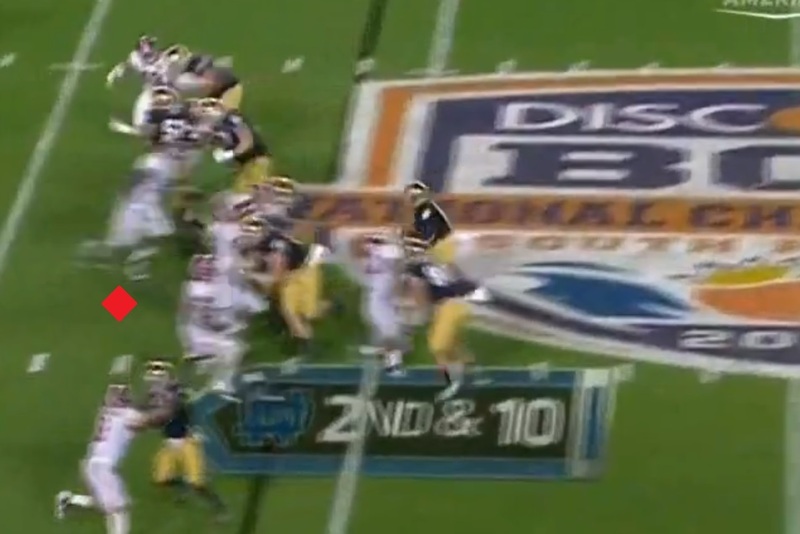 There’s one last attempt to push him out inside the five, but the result of the play is a TD. 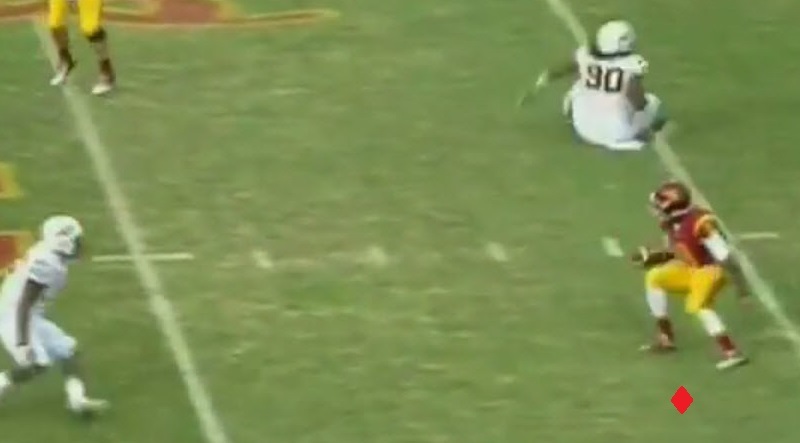 Since pictures don’t do this play justice, here is the video http://www.youtube.com/watch?v=O6S_TlcXCLU . Another area where Watkins really shines is his route running. He runs extremely quick and crisp routes, He is assertive in his foot technique, stabbing the ground and making angular direction changes rather than rounding off his routes. Also, he shows the ability to run most routes in the route tree, and run them well. 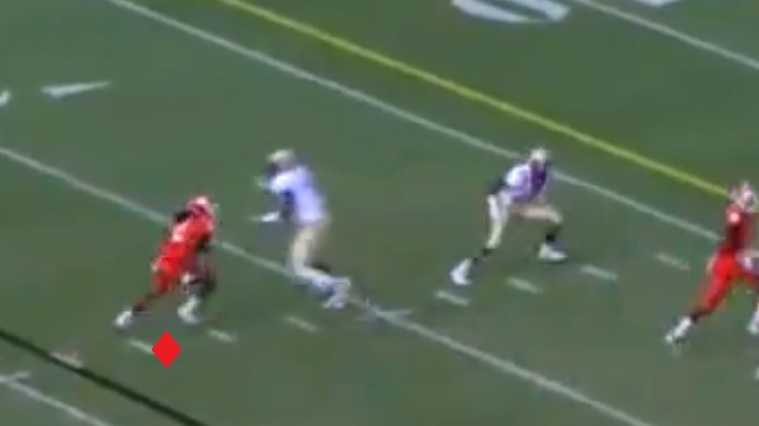 On this play Watkins is able to beat his man easily with an effective stop and go route. Watkins heads up field for about six to seven yards then puts the breaks on and fakes curling back to the Quarterback. The Defensive Back bites on the curl fake, slowing down in his back pedal and preparing to break on the curl. As Watkins cuts back to the outside of the field, the DB is left helpless and must now fight to recover. 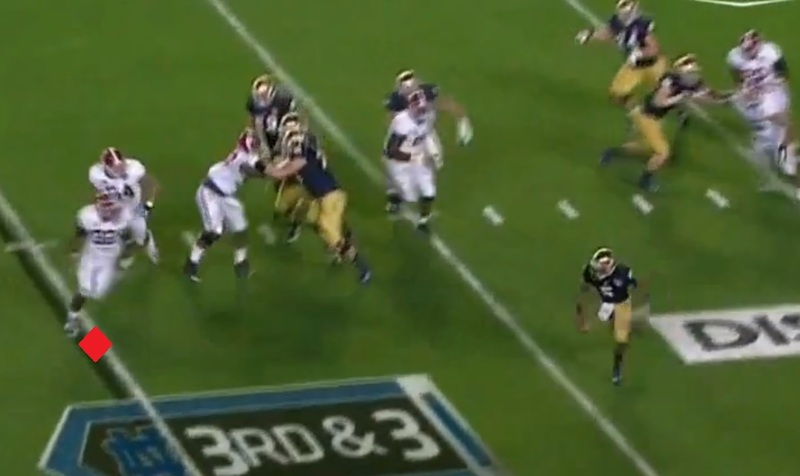 Watkins now has a step on his man, and has the speed to pull away. 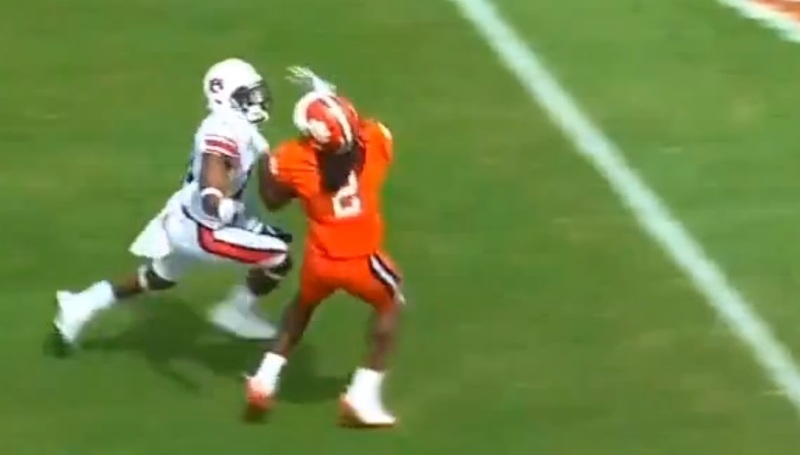 The QB was ultimately sacked on the play, but a half of a second more time in the pocket and this play would have resulted in a touchdown for Watkins and Clemson. 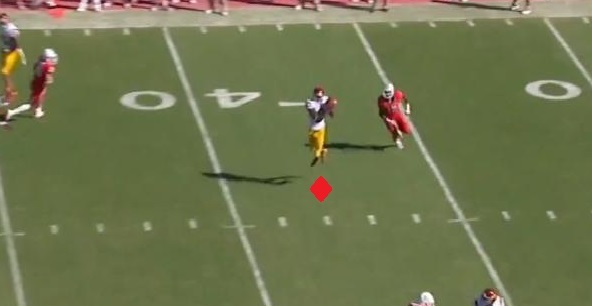 Here we’ll see Watkins utilize a quick in route to beat the man coverage. 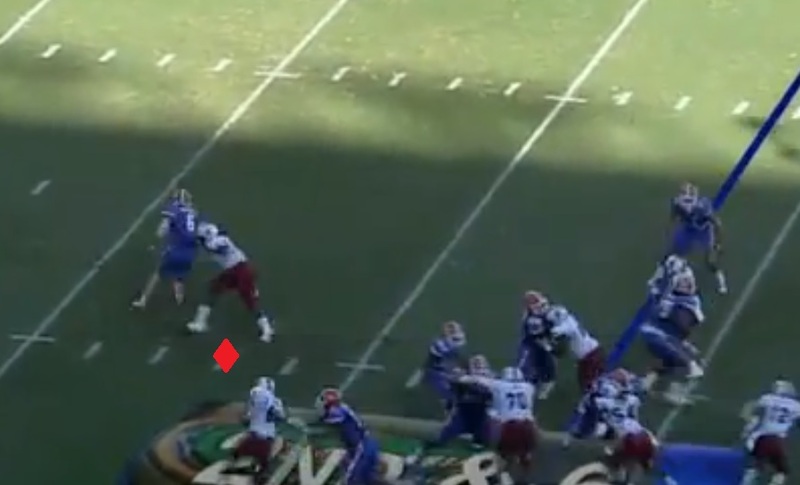 Watkins heads a few yards up field then abruptly stabs the ground, allowing him to make a sudden direction change. With the sharp stab, Watkins is able to make a 90 degree direction change in an instant, leaving the defender with a tough hip transition to recover. 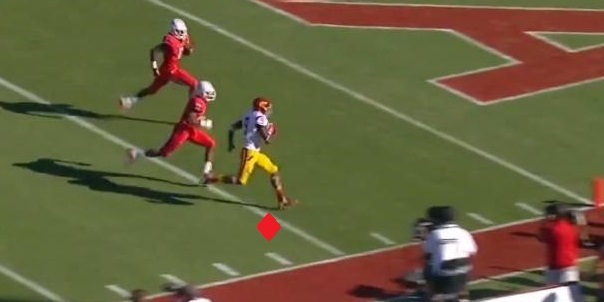 The quick cut creates the cushion Watkins needs to make the catch. 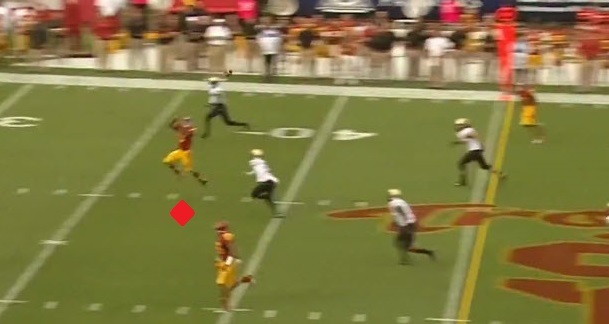 Finally, we’ll look at a post route that was an easy touchdown for Watkins. 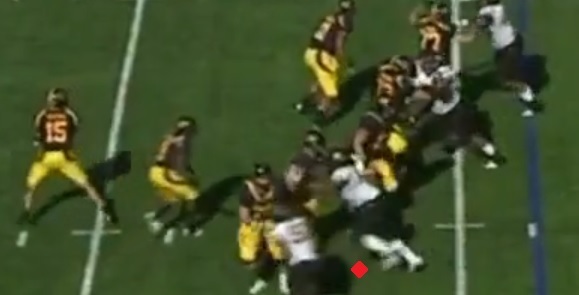 Watkins who is lined up off the line of scrimmage goes down field about 10 yards and again stabs the ground hard. 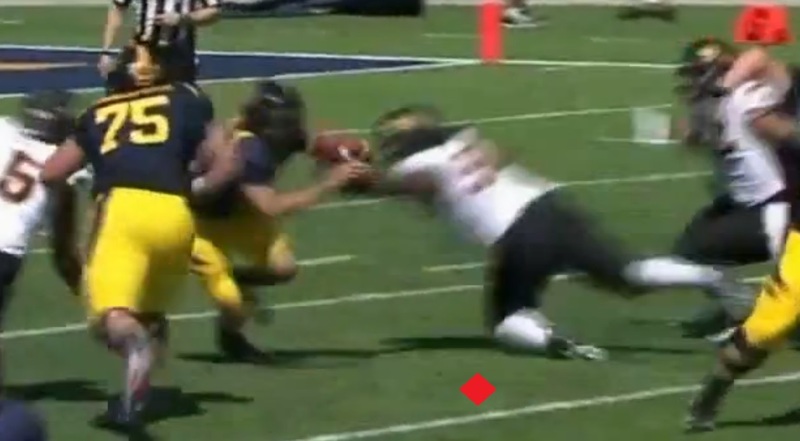 The stab allows Watkins to cut easily and cut towards the middle of the field, while still moving further down field at the same time. 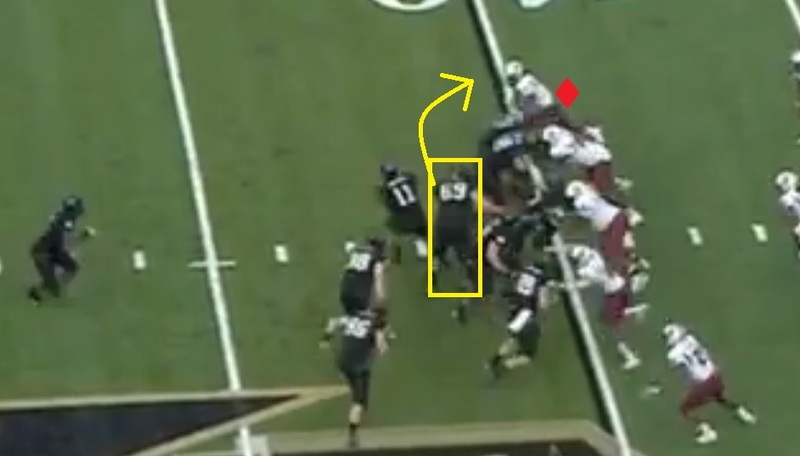 Watkins is able to get behind the safety, and to the spot that the Quarterback has thrown the ball. 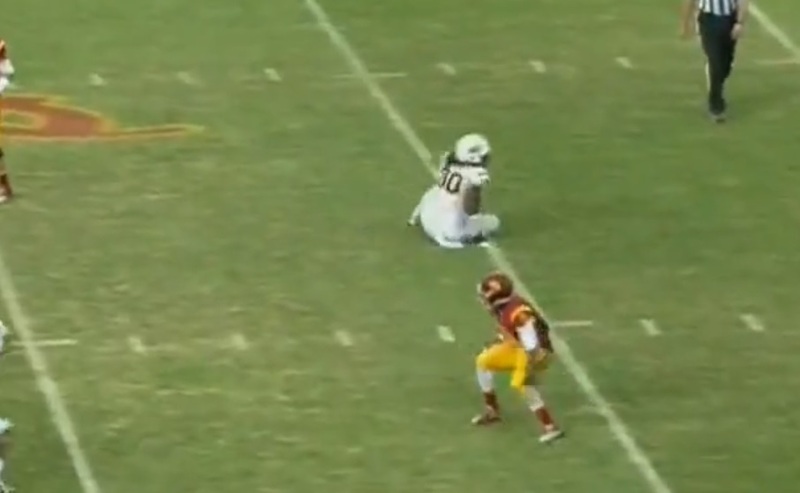 The Safety is late to react, and Watkins is left all alone in the middle of the field. The Quarterback and Watkins have good timing with one another and Watkins is able to make a nice leaping catch and walk into the end zone. One of the biggest things I look for when watching a Wide Receiver is what they can do after the catch/first contact, or their YAC ability. 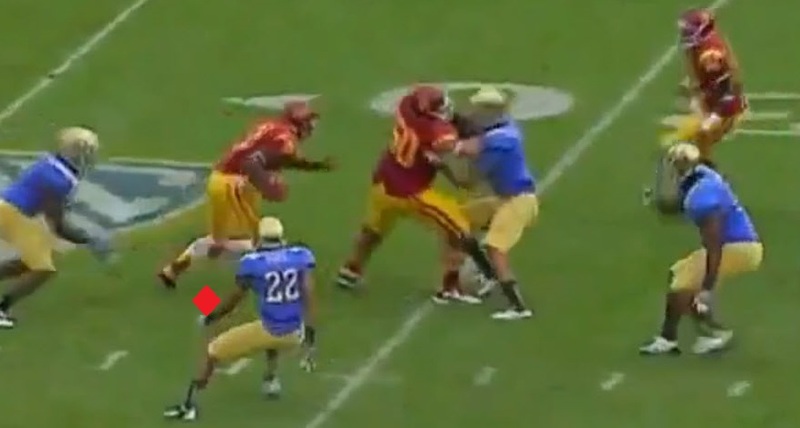 Watkins combines quickness, explosiveness and elusiveness into a package that is a YAC lovers dream. He immediately looks down field once securing the catch looking for cutback lanes, and the most likely path to pay dirt. He shows the ability to shake tackles, and once he sees green he’s almost always gone. 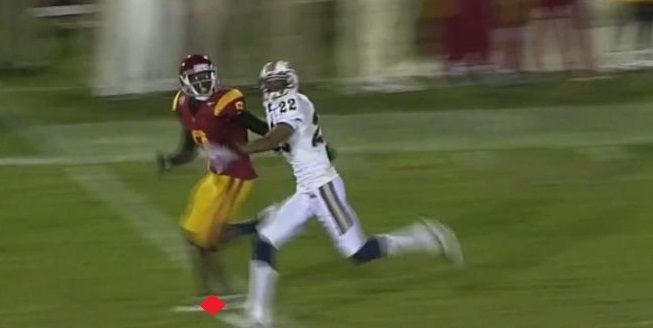 Here we see a great example of what Watkins is capable after the catch, or first contact. 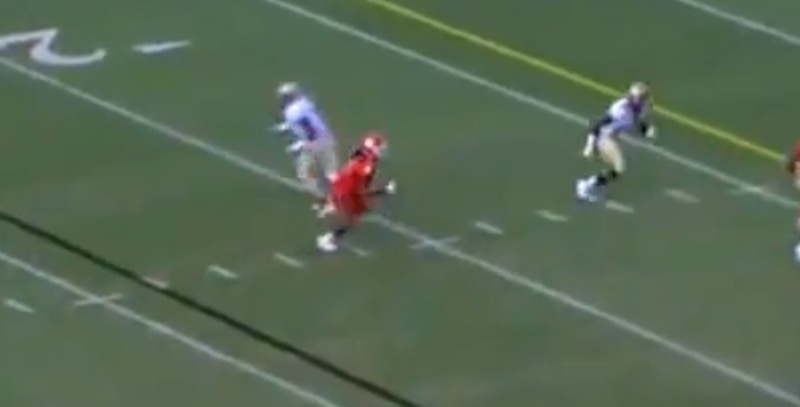 On this play Watkins takes the hand off in the backfield, and will be contacted very early. 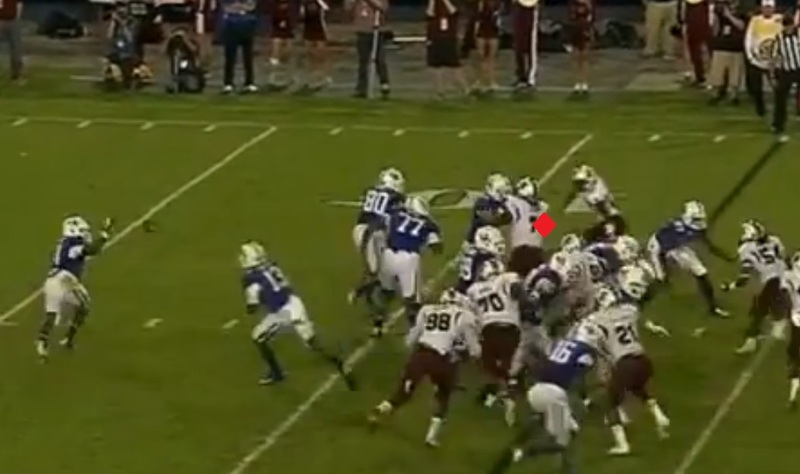 Watkins is contacted almost immediately, and deep in the backfield. However the elusive runner is able to shift through the tackle and keep moving. Again Watkins faces contact in the backfield and he is once again able to slip by. Becoming a trend on this play by now, Watkins slips yet another tackle attempt in the backfield. Watkins runs through one more tackle attempt then is finally brought down by the fifth man. However the damage is done for Auburn. A play that should have been stopped in the backfield for a significant loss on third down has now resulted in the chains moving due to Watkins individual effort. It’s truly a disservice to call Watkins just a Wide Receiver because he’s much more. He’s a special athlete that can be a weapon in just about any offense. His great top end speed, and quick lateral agility make him a threat to score every time he touches the ball. He’s a player that you can get the ball in many ways. Whether it be from one of the outside Receiver positions, in the slot, in the return game and even handing the ball off to him in the backfield. If you can draw the play up you can probably include Watkins in it. While every single player in my Best of the Best series has traits to their game that in my opinion make them stand out, they all have things they need to improve too. So let’s look at a couple of areas where I would like to see Watkins improve in 2013. Watkins is an elite talent and wins a lot of match ups just because his physical skill set is that much better than his opponents. When he is faced with a worthy match up though he sometimes has trouble competing for contested passes. 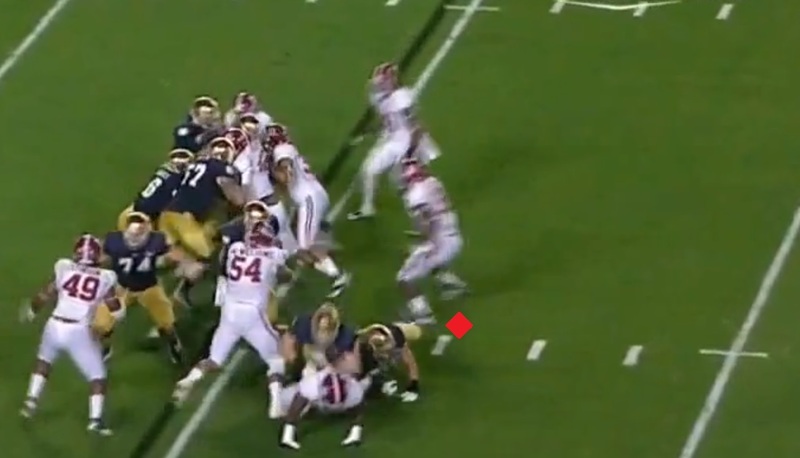 Early in the game against Auburn his Freshman year, Watkins is able to run by his defender and get a step on him. This would be an easy touchdown, however the Quarterback doesn’t push the ball deep enough. 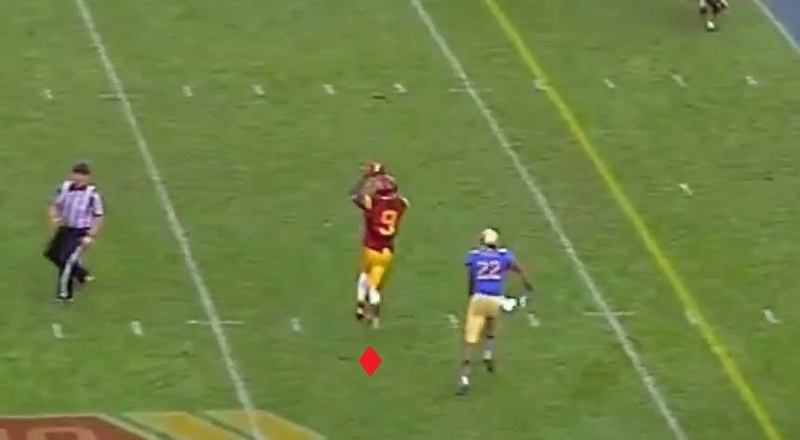 At this point Watkins is doing a great job tracking the ball through the air. Watkins makes the adjustment to the under thrown pass, and at this point is still in good position to make the play over a Defensive Back who hasn’t located the football. Here’s where things go wrong. Even with the defender on the inside, Watkins still has the upper hand because he has located the football in the air while the defender still hasn’t turned his head. 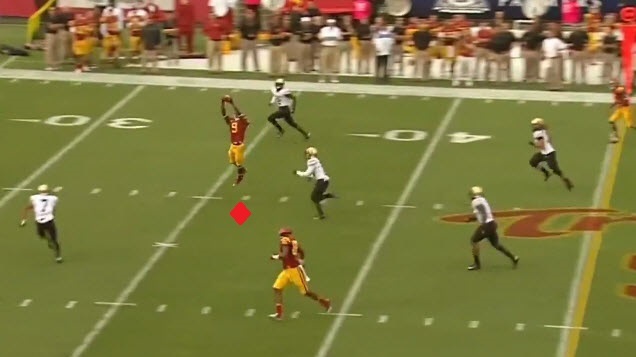 If Watkins gets vertical and attacks the football at its highest point, he will likely win the match up being able to secure the catch before the defender can make a play. 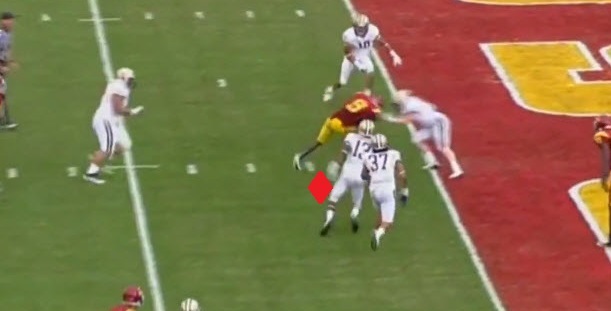 However, Watkins doesn’t get very vertical at all, and because of this puts himself at a disadvantage because now he has to catch the ball through the defender. Watkins makes the catch initially, but is not able to secure the ball like he would if he attacked the football in the air. Without being able to secure the catch in the air, the defender is able to rip the ball free as Watkins is going down to the turf. 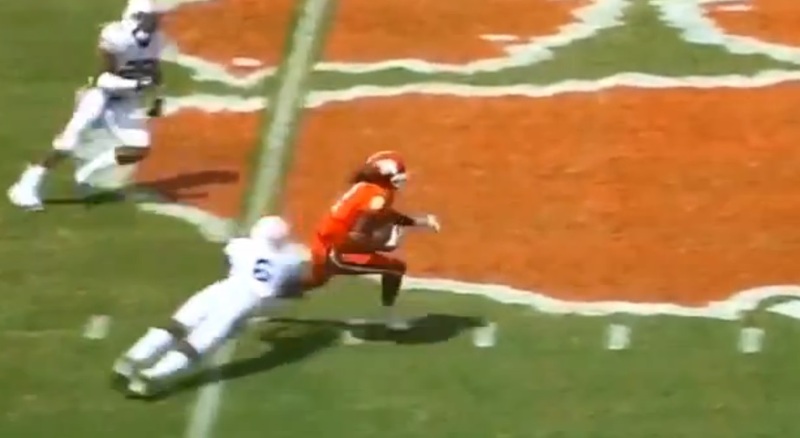 If Sammy Watkins wants to reach his ceiling he will need to learn to be more physical as a Wide Receiver. What I mean by this is he will need to work at fighting through the jam, and also learn how to use his frame to shield his defenders. A receivers body can be a great tool for the player, being used to create separation, and keep defenders from being able to make a play on the ball. To this point that’s not something I’ve seen used often by Watkins, and it would only make him even more of a threat if he developed this skill. 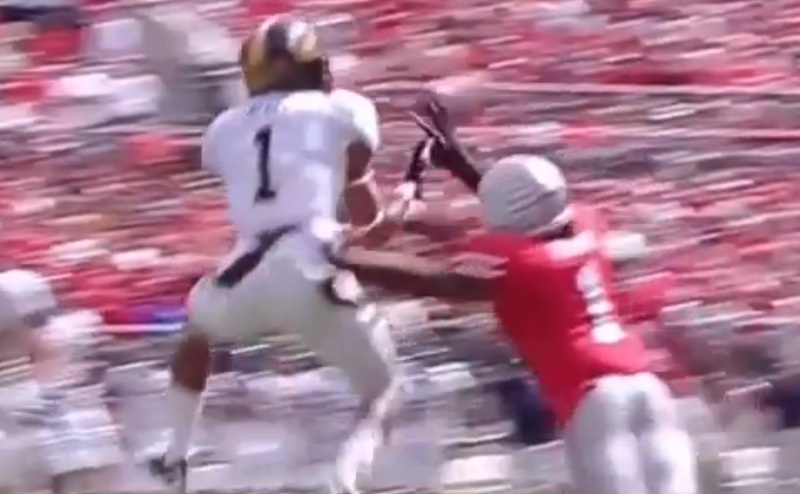 Watkins is an extremely gifted athlete playing Wide Receiver. He has incredible explosiveness and quickness, with great top end speed. He’s a shifty elusive player who is able to evade tacklers and pick up YAC in bunches. He runs precision routes, and has a feel for where the first down sticks are on the field. At times he shows great body control to make catches on the sideline, and is a very willing and underrated blocker. He has good hands, but at times lets the ball get into his pads when you would like to see him rip it out of the air. Watkins needs to work on attacking the 50-50 passes better, and also using his body more to win battles. He dealt with injuries all last season, so he will need to show that he is injury free and can stay that way going forward. He has minor character concerns that teams in the NFL will want to look into, but nothing that will impact his draft status or cause a team to remove him from their board in my opinion. He lacks ideal size for an outside receiver, but with his other physical tools has the ability to be a very good number one Wide Receiver at the next level. With it now only 10 days until the 2013 college football season begins, I’m happy to be debuting my “Best of the Best” series. This 10 article series will take a look at my top 10 draft eligible players in college football. For my rankings, I factored my Draft stock for each player, as well as their impact on the college gridiron. While I fully expect all of these players to be top 15 draft selections next year (if they all declare), there could always be fluctuation with a premium placed on positions like Quarterback and Offensive Tackle. 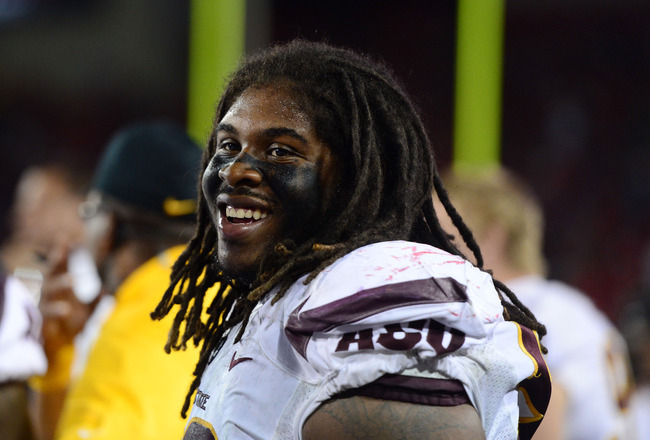 With that said, it’s time to look at my number 10 prospect, Arizona State Defensive Lineman Will Sutton. After a less than stellar start to his career Sutton finally burst onto the scene in 2012. Sutton took his game to a new level, finishing second in the nation in tackles for a loss with 23.5, and third in the nation in the sack category with 13.5. He also posted exceptional tackling numbers, finishing 2012 with 62 total tackles. So with the boom season is he just a one year wonder, or is there more to his game to maintain longevity in 2013 and beyond? When watching Sutton, the first thing that immediately jumps out to me is how well he can adjust to the snap timing throughout a game. He’s not the most explosive player off the ball. However once he reads the snap, he’s able to anticipate and jump it so well that he’s often quicker than the opposing Offensive Lineman blocking him. In this first play, we will look at a simple rush, but because of Sutton’s timing, the blocker isn’t able to disrupt Sutton effectively off the snap. Another look at this play shows us how quickly Sutton has fired off the snap. If you look you can see that because of Sutton’s timing, there is a lane created between the Center and the Guard where they haven’t reacted quick enough. 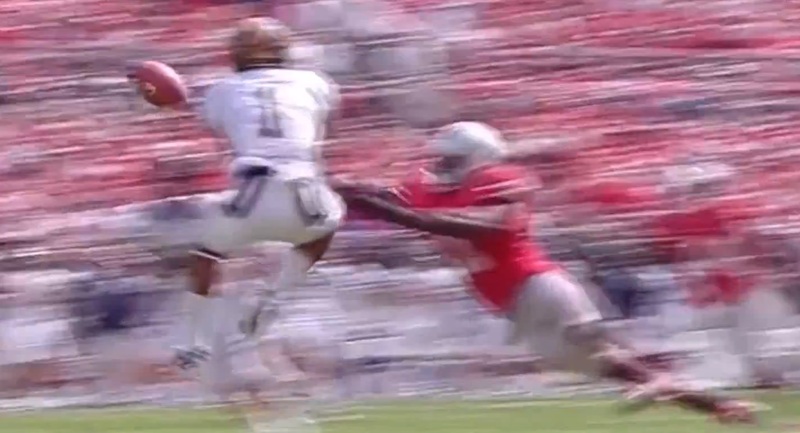 In this frame we can see Sutton’s explosive closing speed on display. He easily shoots through the gap created, and at this point all the Center can do is try and disrupt him from his side, or grab his jersey and take the foul. 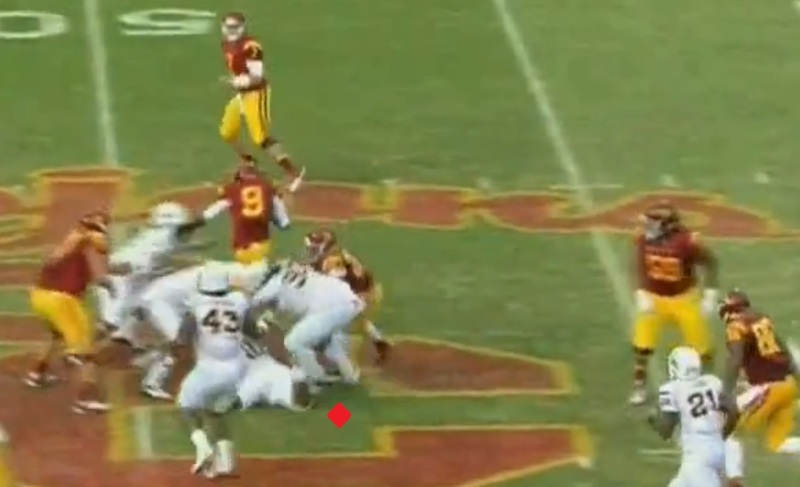 Sutton finishes the play by stripping the Quarterback as he gets into the backfield. Cal recovers the ball, but it’s a sizable loss on third and long resulting in getting the ball back to his offense. Here again we see Sutton with great timing of the snap. 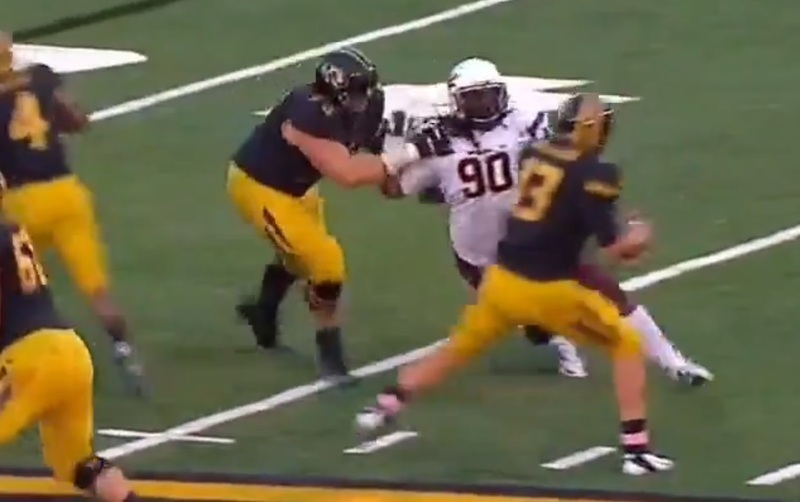 Notice how the Center has hardly gotten out of his stance, while Sutton has already fired up and again has both hands ready to attack the blocker. 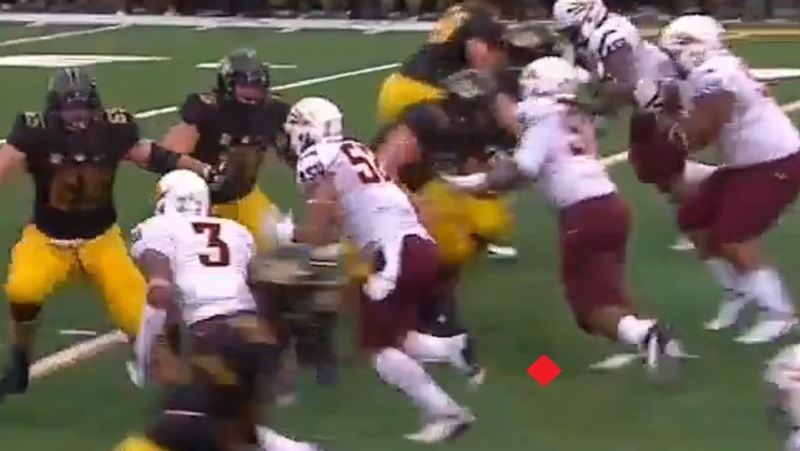 Sutton’s timing allows him to contact the blocker before he’s ready to deal with him, because of this Sutton is able to use a quick rip to get to the side of the blocker and blow by him. At this point Sutton has left the Center looking foolish, but more importantly he’s got a free lane straight to Quarterback. 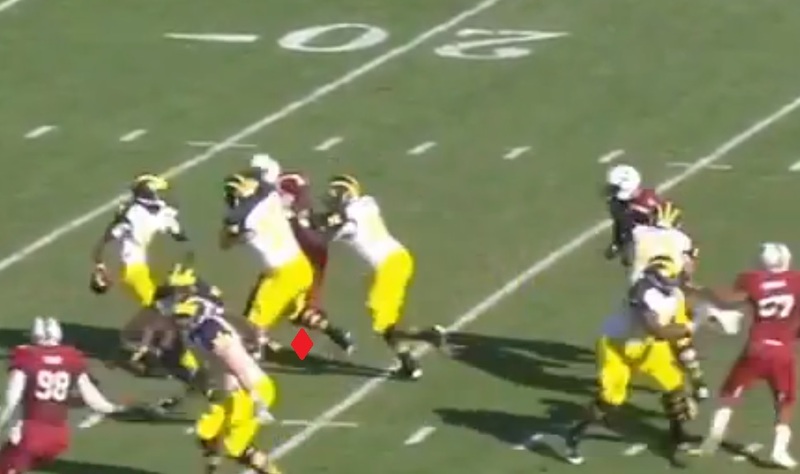 Sutton shows great closing speed to get to the Quarterback before he can set and throw the ball. 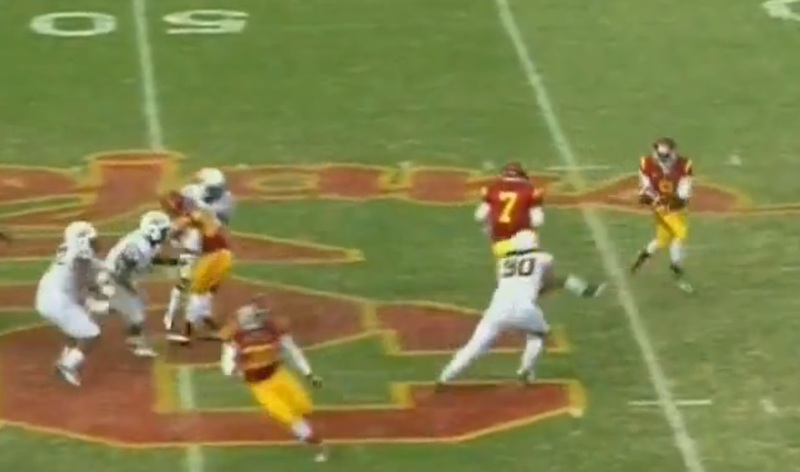 This results in the QB having to make a hurried throw off his back foot which falls incomplete. Snap timing may have been the first thing that jumped out when I watched Sutton last year, but his pass rushing technique wasn’t far behind. Sutton has a full arsenal of pass rushing moves, utilizing not only quick and devastating swim moves, but powerful rips and bull rushes when anchored properly. On this play we will once again see great explosiveness off the snap from Sutton, but it’s his phenomenal pass rush move that I want to point out. 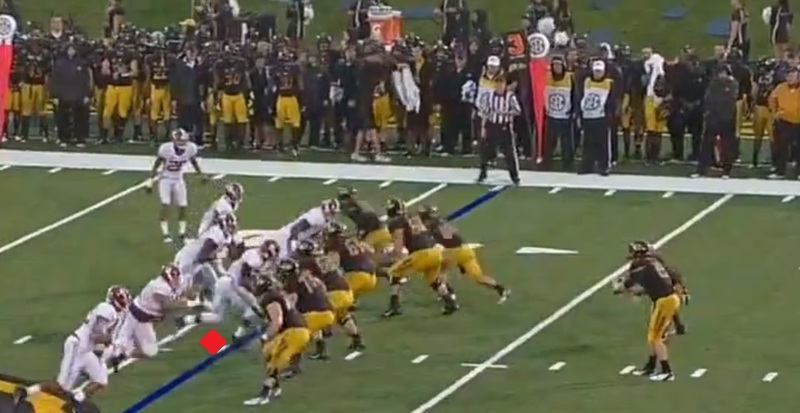 As the ball is snapped, Sutton shows again that he can consistently fire off the snap and engage his blocker in a very short period of time. At this point Sutton has already won his battle against the Center by utilizing a explosive swim move to force the blocker out of his way. 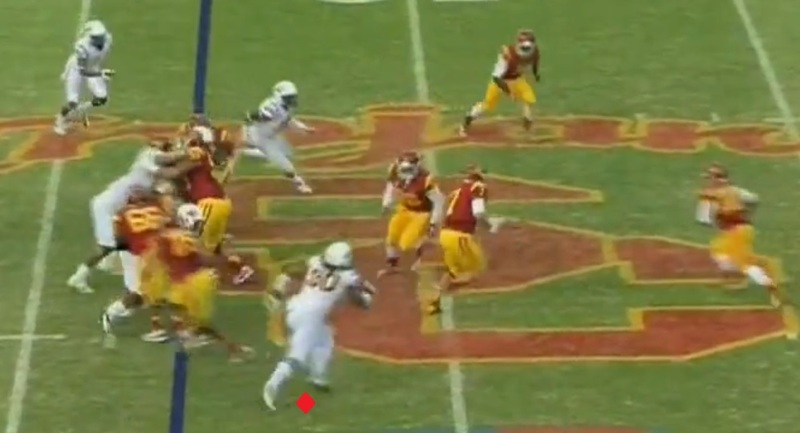 Before Quarterback Matt Barkley has finished his drop back Sutton has already created a free lane to the QB. Sutton is able to easily get his arm up and around the blocker, making it impossible for him to be impeded in his pass rush. With the free lane, Sutton is able to continue his explosive pursuit and brings the Quarterback down, forcing a punt. 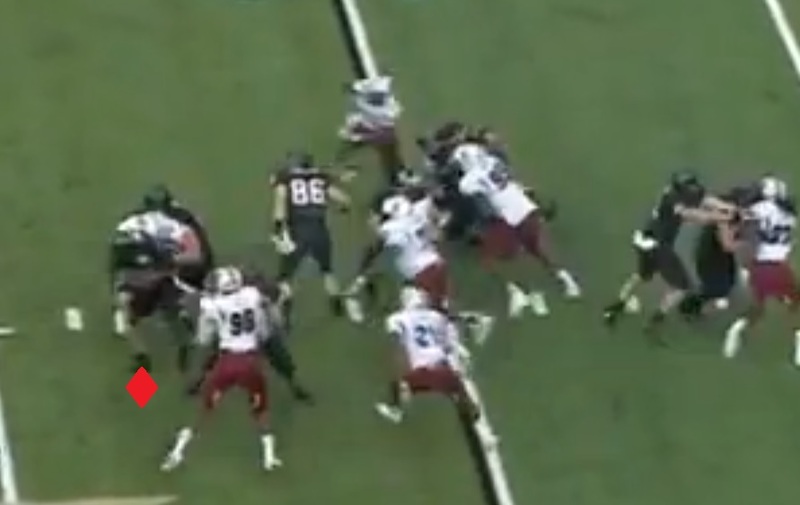 Next we’ll take a look at Sutton’s power in his pass rush game, his Bull Rush. From initial contact it is easy to see that Sutton is able to generate incredible strength and power to drive his blocker back to the Quarterback when utilizing proper leverage. 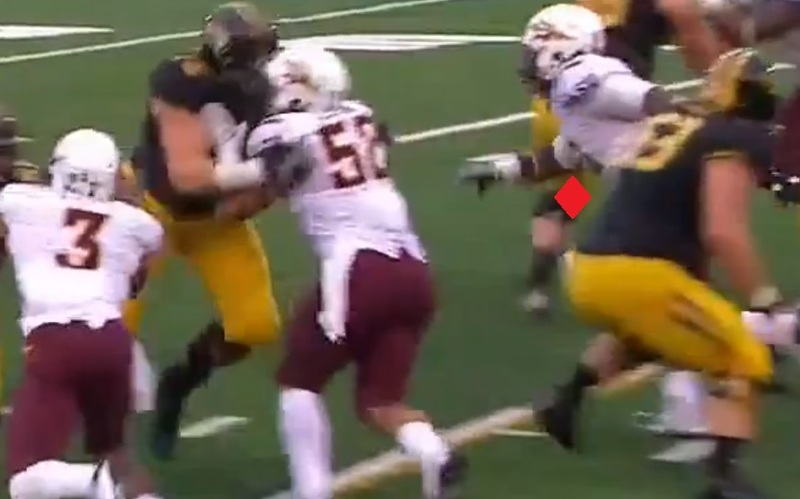 The ball has just barely reached the Quarterback off the snap, and it’s already evident how much of a leverage advantage Sutton has on his blocker. 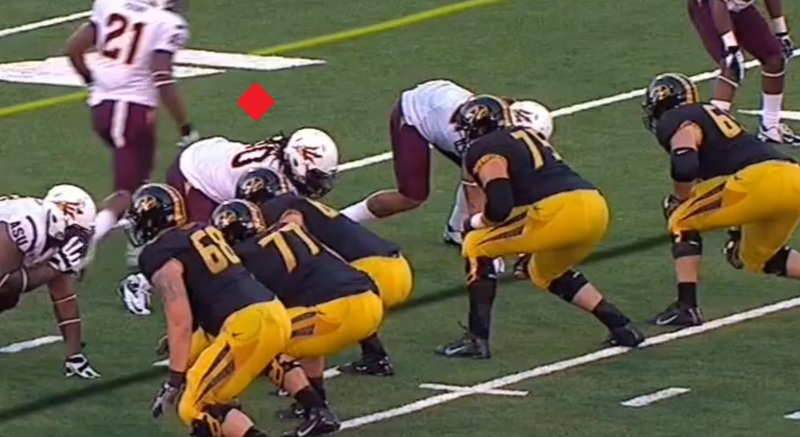 Notice how much further back the Right Guard blocking Sutton is, as opposed to the Left Guard. Sutton is already at least a yard further up the field. Sutton uses good technique, keeping his arms extended so the blocker can’t get into his body. 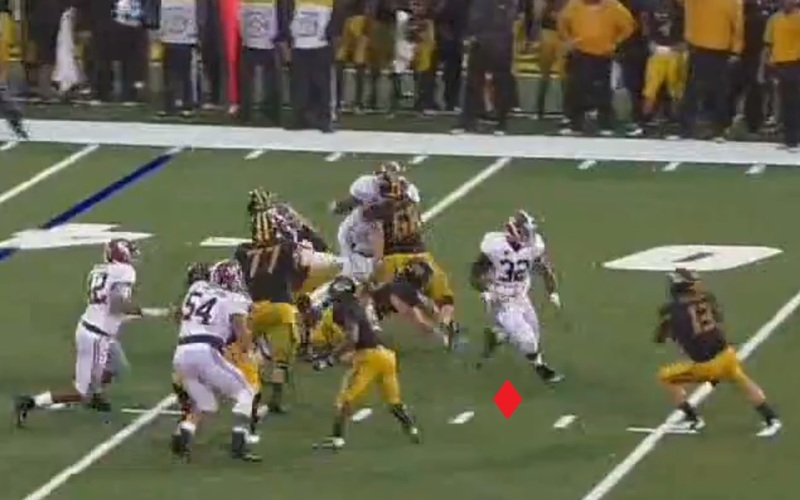 This makes it even easier for Sutton to use his leverage advantage to force the blocker into the backfield. Sutton not content to just make the Quarterback uncomfortable, is able to disengage easily with the leverage advantage, and finish the play by getting a hit on the QB. Something that is rare to see in a Defensive Tackles game, is an exceptional speed rush. 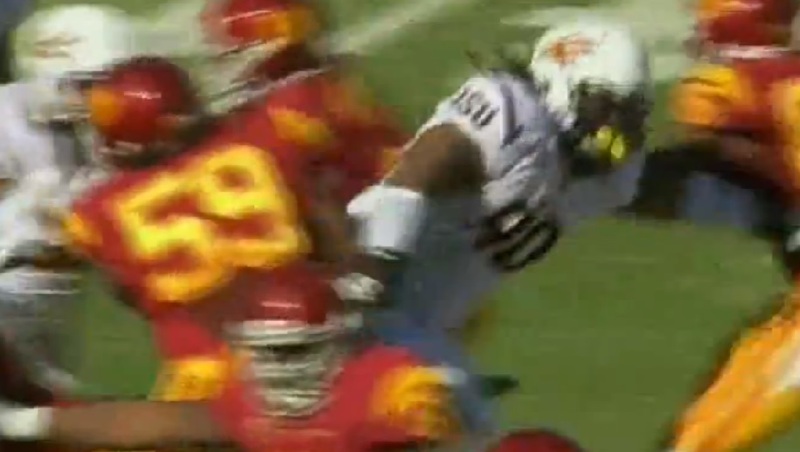 But on this play against Missouri, the Arizona State standout displays an extremely effective one. As the play begins, you can see Sutton utilizing good technique, dipping his shoulder inside to give him the angle and leverage necessary to dip around the blocker. Due to technique and burst, Sutton is able to slide around the Right Guard and put himself in position to make the play on the Quarterback. 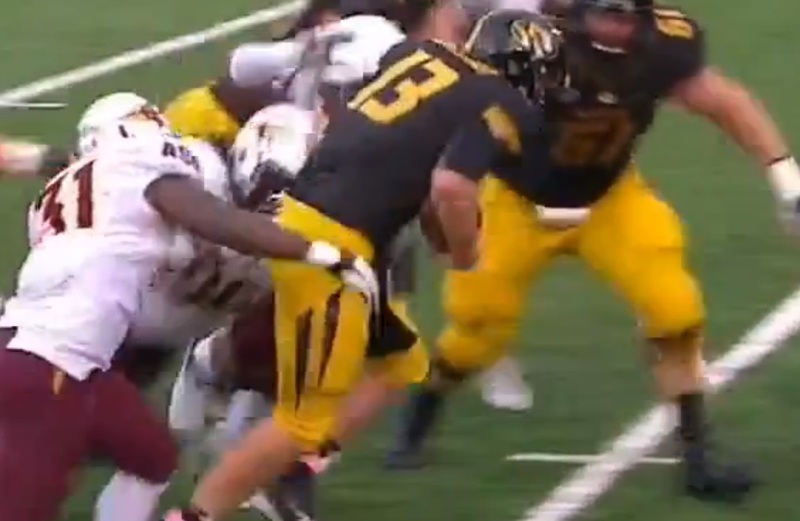 Even with the Guard grabbing at Sutton’s jersey, he is able to explode around the blocker and to the Quarterback. The QB has no choice but to tuck the ball and take a sack. Sutton flashes great athleticism on the field. He shows the ability to not only leap and knock down passes, but also make plays sideline to sideline. Late in the game against Missouri Sutton flashes leaping ability, timing his leap well and extending fully to fill the Quarterback’s passing lane and force an incomplete pass. Sutton shows good skill to knock down passes, with 6 pass deflections in his career. More impressive about Sutton’s athleticism though, is his ability to make plays from sideline to sideline, and down the field in pursuit. On this play I want to point out Sutton’s ability to read and react to the play going away from him, as well as his pursuit ability to get back to the play and help out on the tackle. Notice Sutton is lined up on the far side of the field. Right from the snap, the play is designed to go away from Sutton’s side of the field as you can see from the Quarterback rolling to the near side of the field. As the receiver looks to turn up field, we can no longer see Sutton in the frame. It certainly looks like he won’t be involved in the play. However just a moment later as the Tight End approaches the original Line of Scrimmage we see Sutton come back into the frame closing in on the ball carrier. 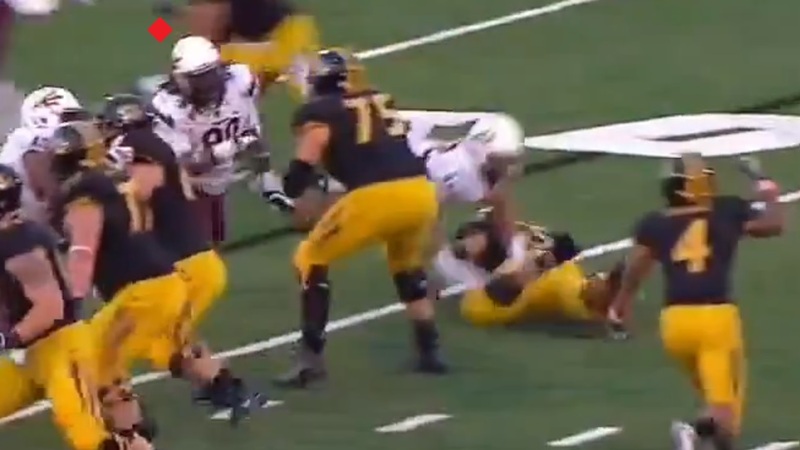 Sutton finishes this great pursuit play by joining in on the tackle. Sutton displays a good amount of versatility in terms of where you can play him. 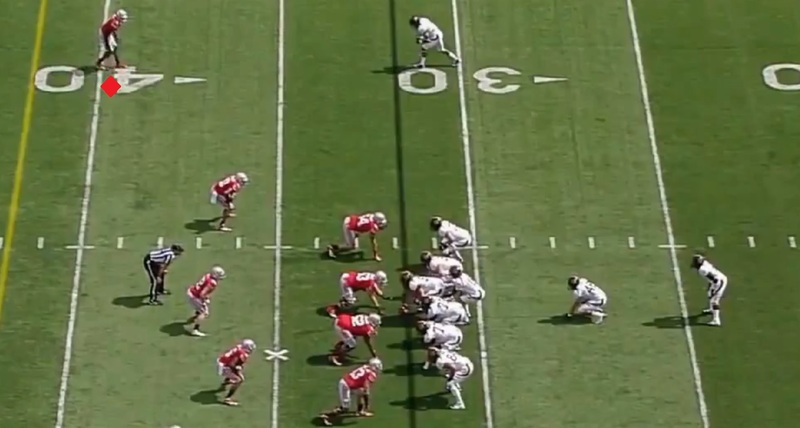 While he finds most of his success lining up in between the Guard and Tackle (3 technique), he also flashes ability to make plays lined up across from the Center (0 technique), and further outside at End in a 5 technique position of a 3-4 alignment. 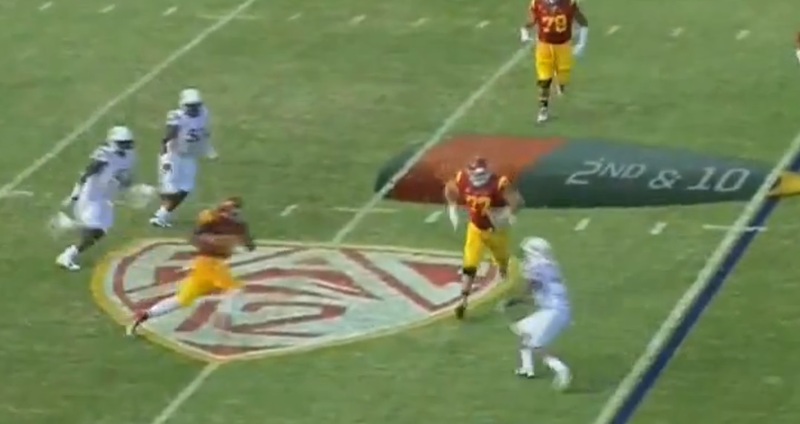 Like most players his size, Sutton can have trouble making the play in open space. While he excels at beating blockers and getting to the Quarterback, smaller and shiftier Backs and Receivers can give him fits at times. 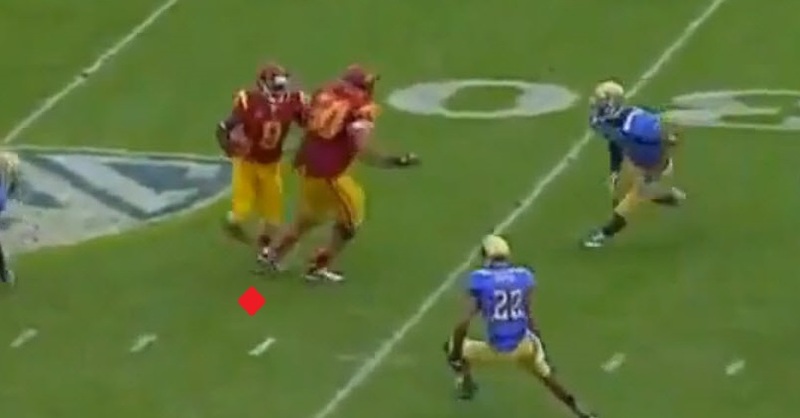 On this play we will see Sutton make the appropriate read, getting to Marqise Lee in the backfield on the reverse. 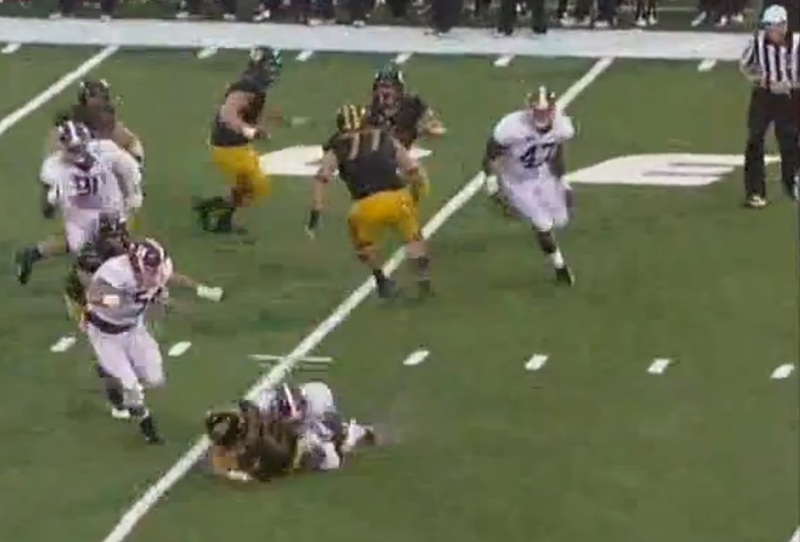 However, when confronted with the tackle in space opportunity Sutton isn’t able to finish the play. 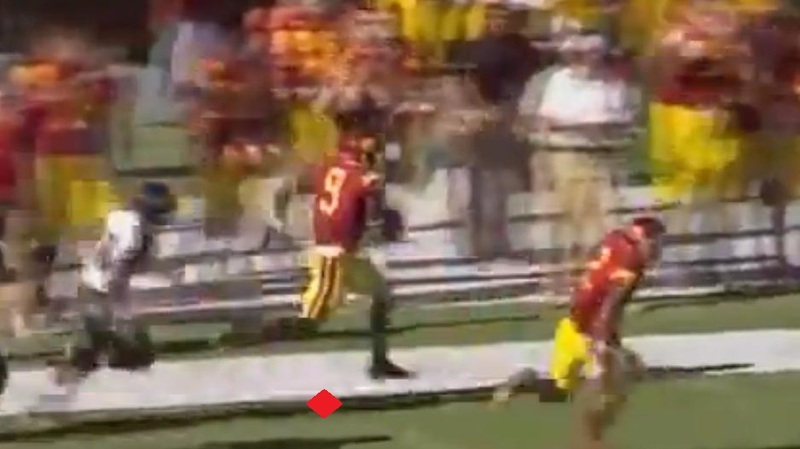 Sutton reads the play perfectly, pursuing the Quarterback back to the pitch point, and then instantly taking his pursuit from the QB to Wide Receiver Marqise Lee. 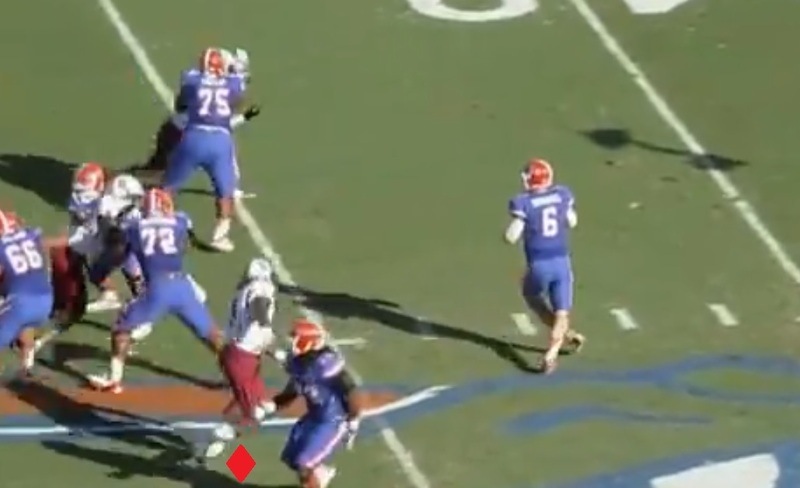 At this point Sutton is in excellent position to make a critical stop in the game. Sutton now dives for Lee, extending his arm to make a desperation tackle attempt. Lee is easily able to run through the tackle attempt to extend the play. Sutton however doesn’t give up on the play, and will get a chance at redemption as Lee cuts the play back. 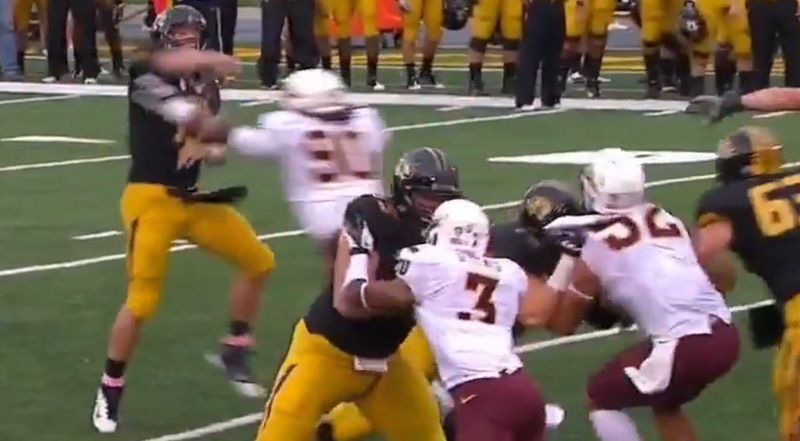 Sutton’s quick recovery forces Lee to make another cut back towards the rest of the Arizona Sate defense. 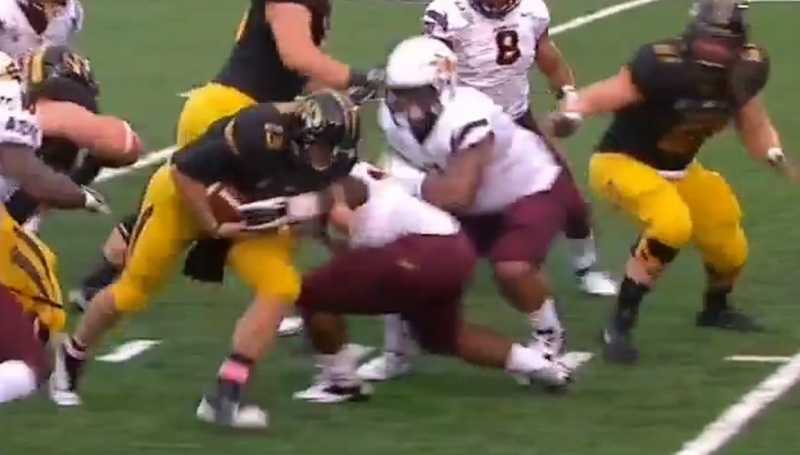 Sutton is once again presented with the opportunity to tackle Lee for a loss, but like the rest of the Arizona State defense, he fails to do so. In fairness to Sutton, there is a blocker getting a shot on him, and Lee is one of the most elusive players in college football. 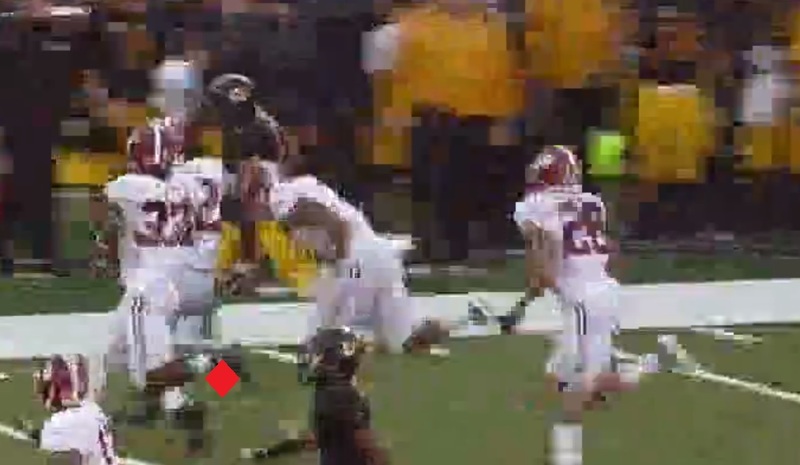 Lee is able to turn this busted play into a Houdini act for a 20+ yard gain. While Sutton is a very physical player, at time his tackling technique leads something to be desired. Sutton makes the correct read and is in position to stop the Quarterback on the keep, however instead of wrapping up and dragging him down he goes with a weak arm tackle. As a result, the Quarterback is able to run through the attempt, and the result of the play is a touchdown. 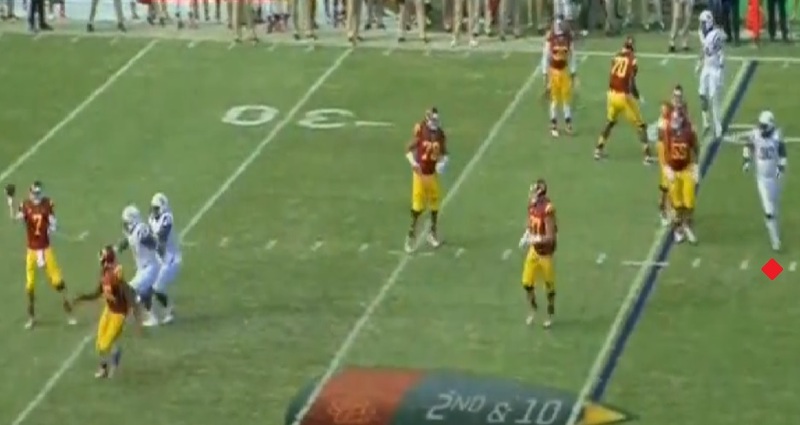 In an Arizona State loss that was decided by four points this is a critical mistake. The other area of his game I would like to see Sutton focus on this year is being more consistent in regards to leverage. When he gets off the snap and gains good leverage he’s virtually impossible to block. However when he struggles to gain leverage at the point of attack due to poor technique, his pad level being too high or a lack of burst off the snap he can be moved around easily. Sutton did add 30 pounds of weight during the off season, so this should help with his ability to anchor and create leverage, however it is an area he will need to improve to reach his potential. Sutton is a phenomenal Defensive Tackle, who shows a balanced ability in both the passing game, and in run support. He has a very strong set of pass rush moves that he combines with great snap timing and a good degree of power to win match ups on a regular basis. He usually utilizes good technique, and shows good ability to read and react to plays in the backfield. He has a nose for the ball, pursuing well sideline to sideline and making hustle plays throughout games. He also utilizes quick feet to cut through narrow lanes, to make plays. Like most Defensive Tackles, he struggles at times to make plays in space, and can have lapses in technique and pad level that create leverage issues. He also doesn’t always have good tackling technique resulting in missed opportunities. Scheme versatility makes him an intriguing prospect as a 3-4 Defensive End, or pass rushing Under Tackle in a 4-3 alignment. He missed the entire 2010 season with Academic problems, and at 6’1 will more than likely have doubts due to his size.